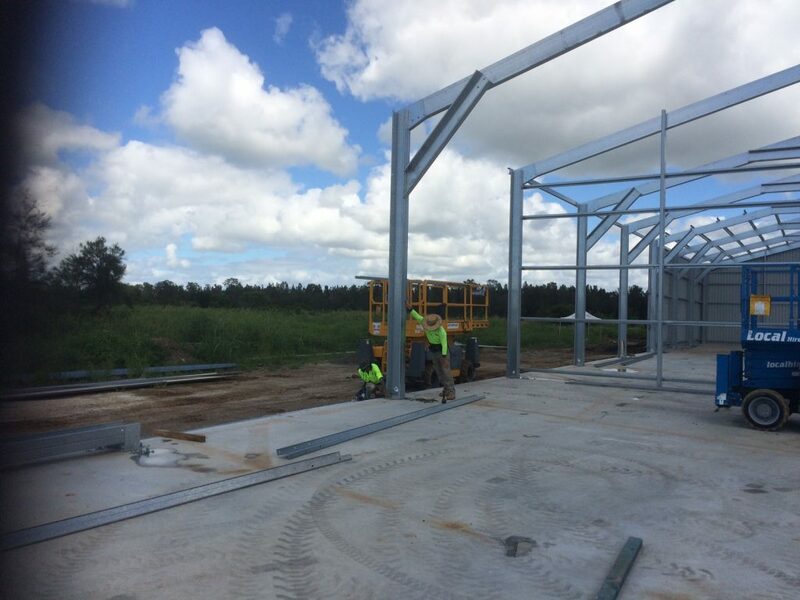 Our client has large valuable machinery that needed protection from the elements. 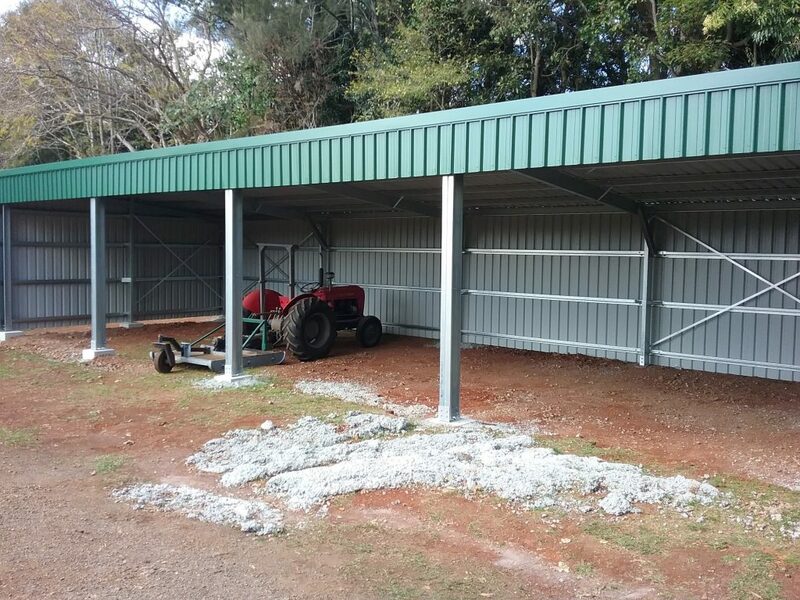 He engaged Totally Sheds to supply and construct an Open-Gable Storage Shed that would provide shelter for these machines and all their parts. 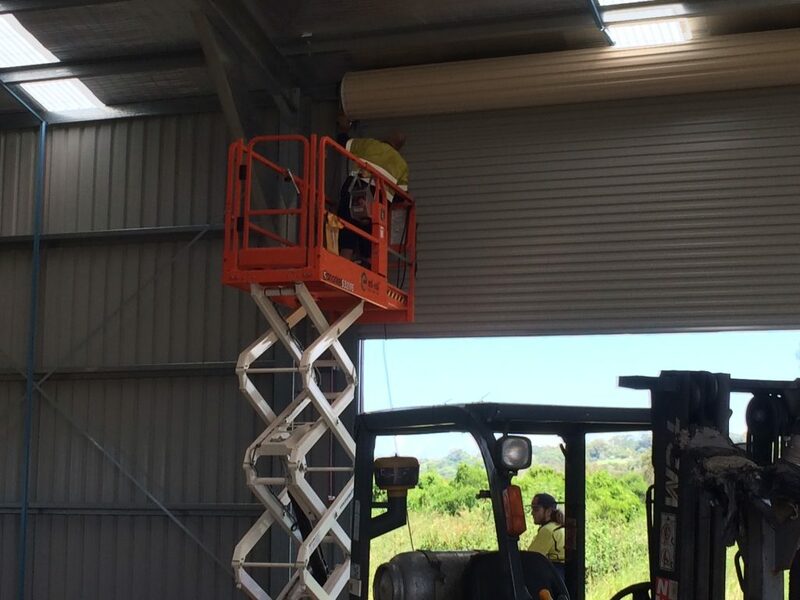 With a clear span of 18m and 5 equal bays totalling 25m we supplied and constructed a completely under-roof area of 450 sqm with 5m eaves and an apex at 5.6m high. 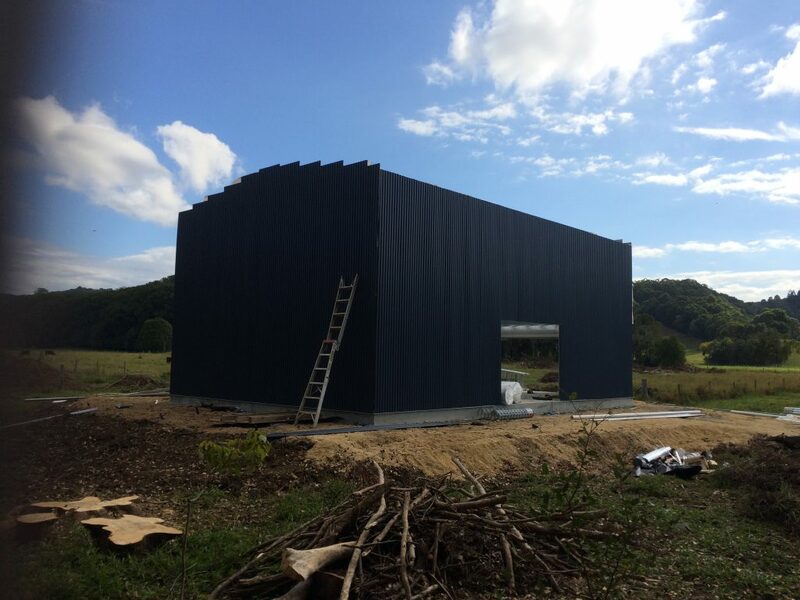 Got something big and want to protect it? 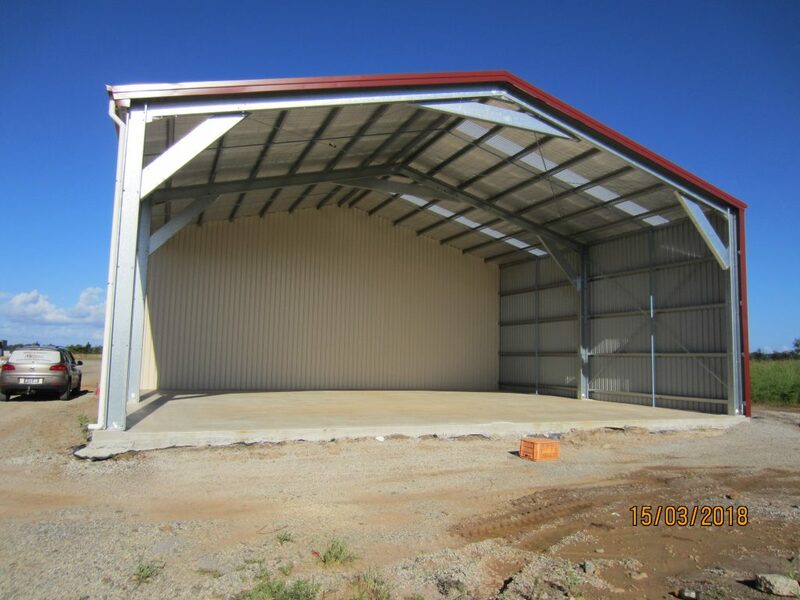 Talk to us at Totally Sheds. 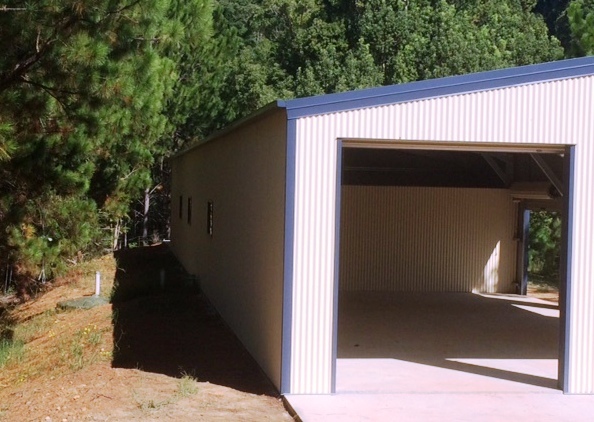 We custom design Sheds; big, medium or small – just right for you! 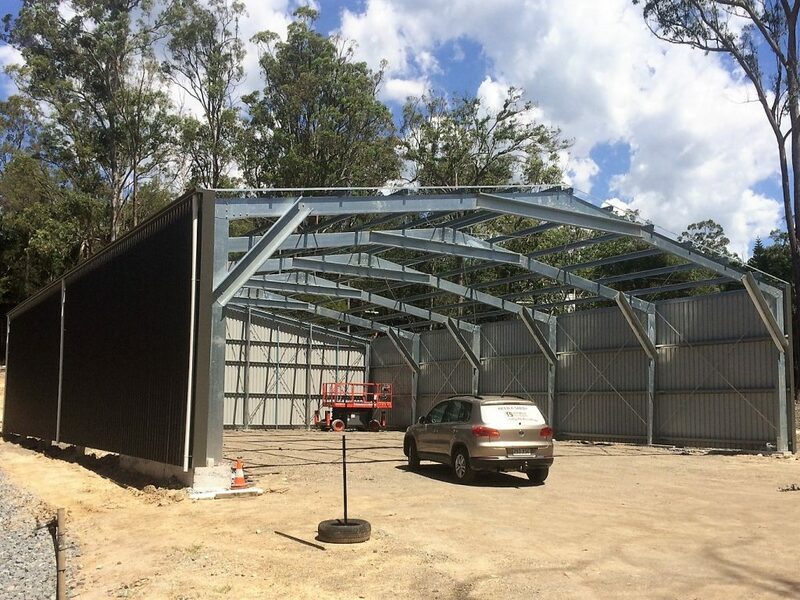 Call us now or request a quote and get your Steel Building underway. 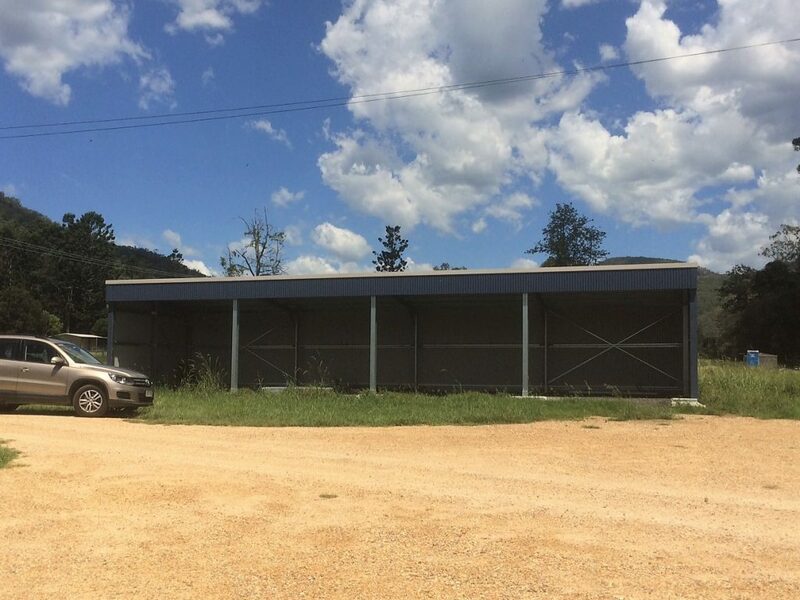 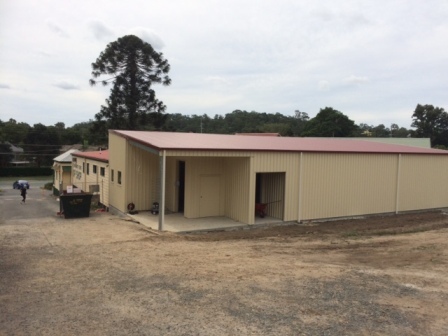 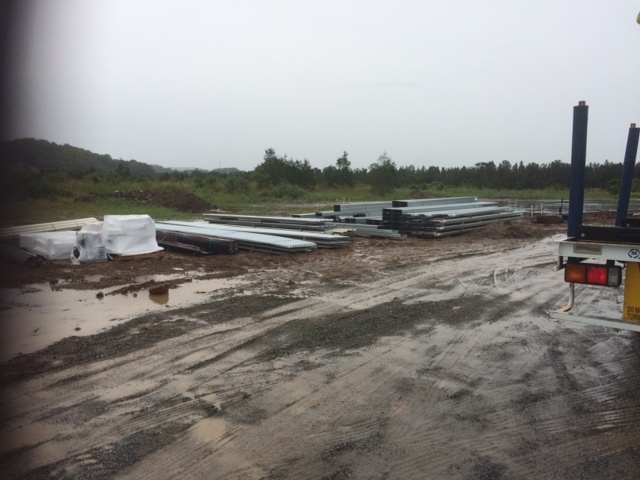 Totally Sheds was engaged to construct two sheds on a client’s property at Numinbah Valley Queensland. 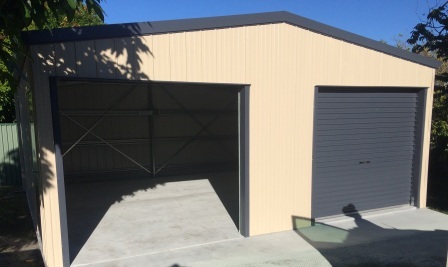 They were building a new home for their parents and wanted a Triple Garage to house all Dad’s things which included cars and other assorted items collected over a lifetime. 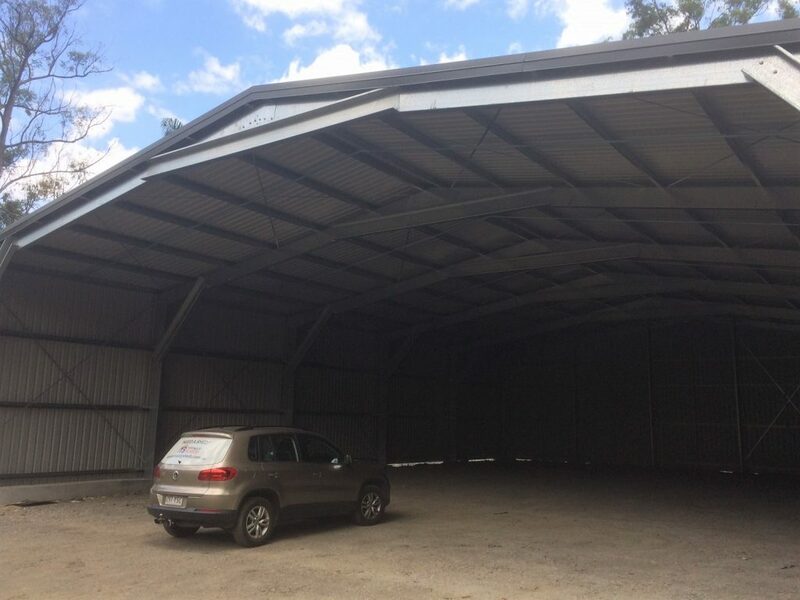 Totally Sheds designed, supplied and built a substantial 11m wide x 12m long Triple Garage with 3 equal 4m bays, 3 x 2.6m high by 3.05m wide roller doors and included a personal access door for easy entry to the shed. 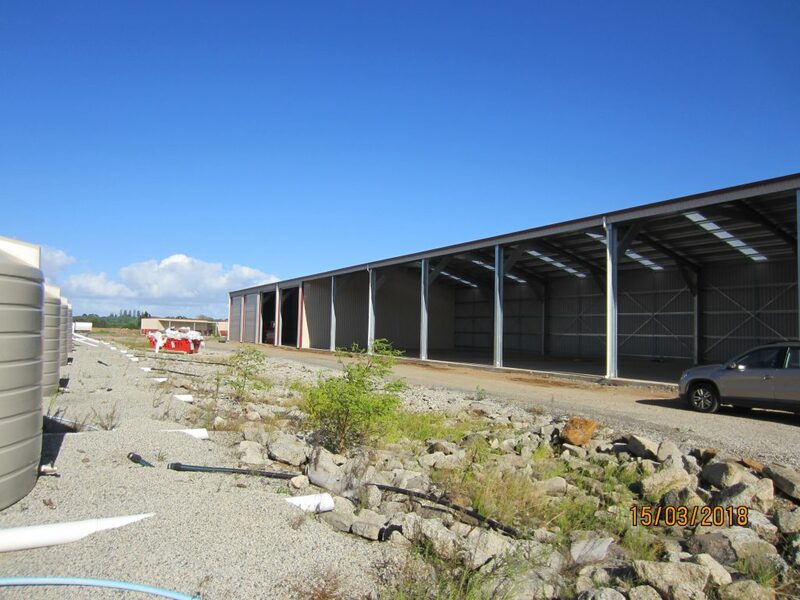 The second structure was an Open-front Farm Shed on piers only 6m wide and 19.2m long with 4 equal bays of 4.8m. 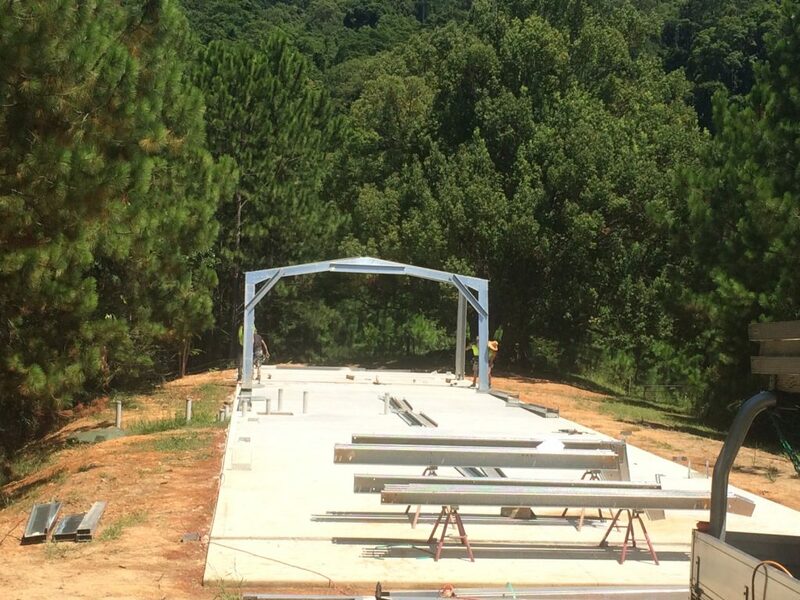 The client intends to use this structure for an historic museum housing horse-drawn carts and other memorabilia. 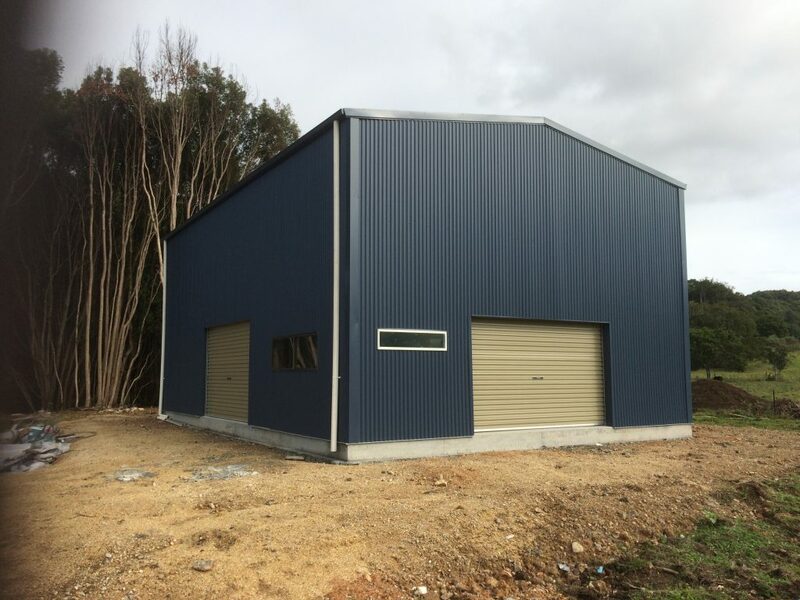 The colour scheme features Deep Ocean walls and trim with Dune roof and roller doors, gutters and gable end capping, which ties it all in really well. 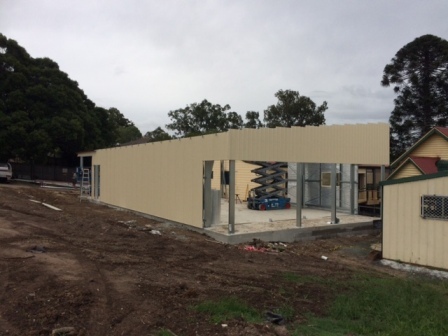 Watch this space as we have just been contracted to build the museum itself and an adjoining toilet block. 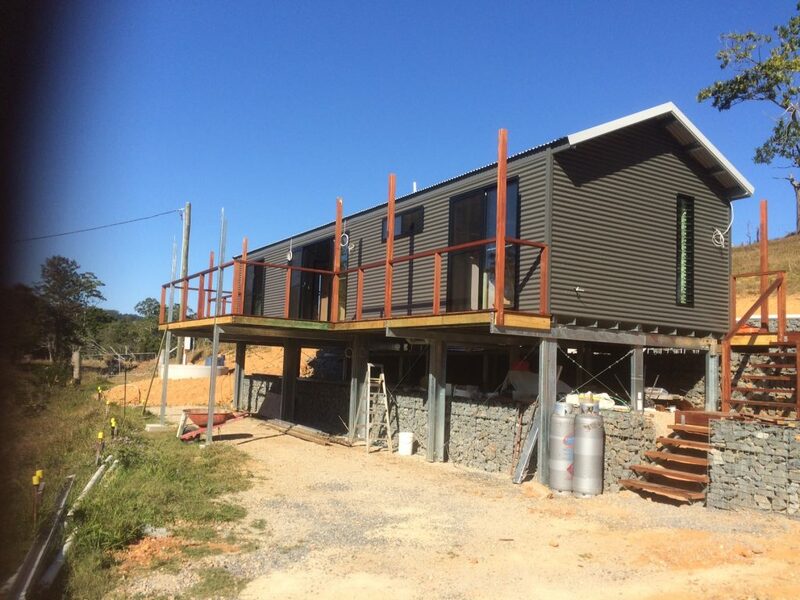 Fully compliant Class 1A Liveable Dwelling recently completed in Middle Pocket, Northern NSW. 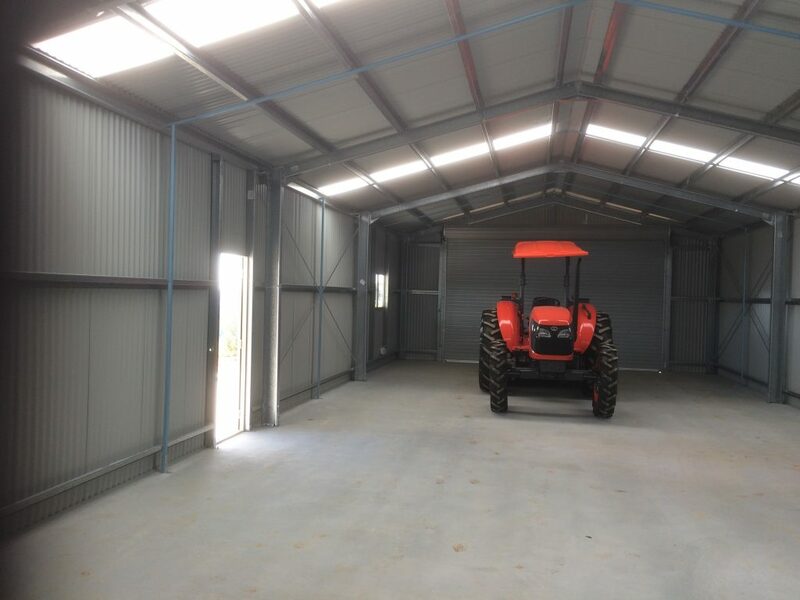 For full explanation and photos click on our “Liveable Sheds” tab – Investment Shed. 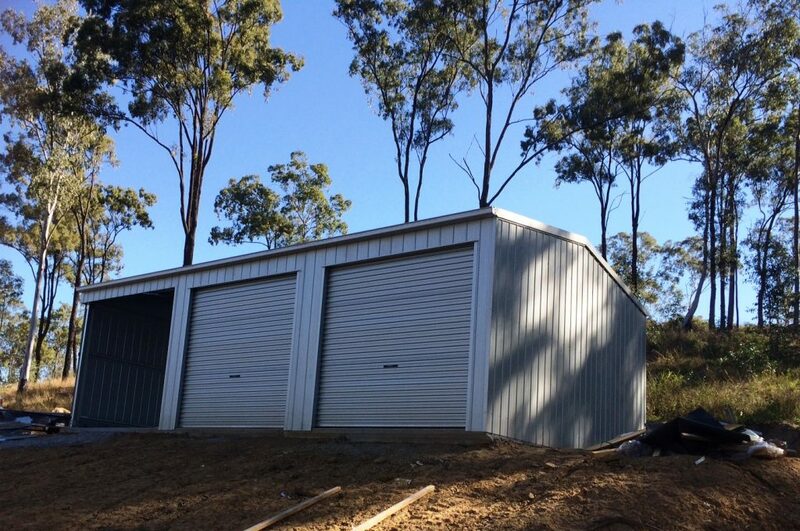 Our client was in desperate need to get more storage space on their property at Upper Coomera. 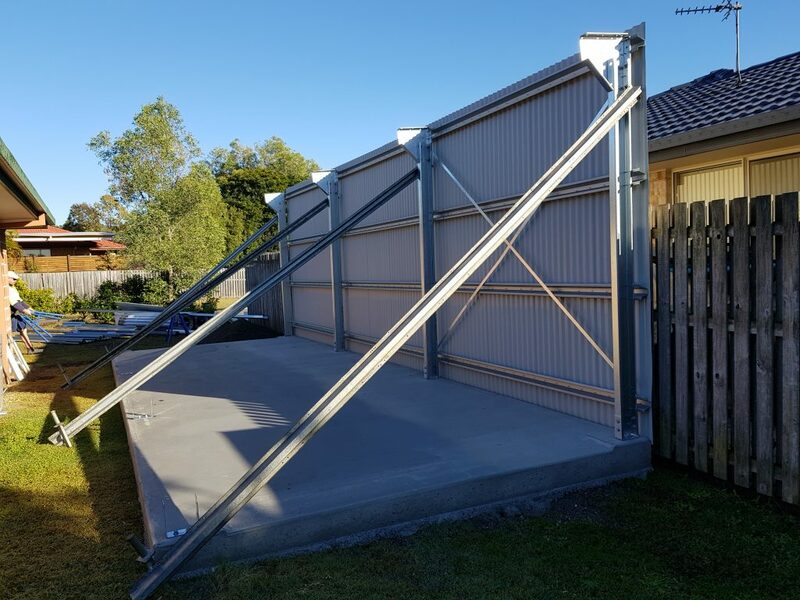 They did not have a lot of space to work with, but with the help of Totally Sheds, applied to Council for a Skillion Shed with a zero setback from the neighbour’s side boundary. 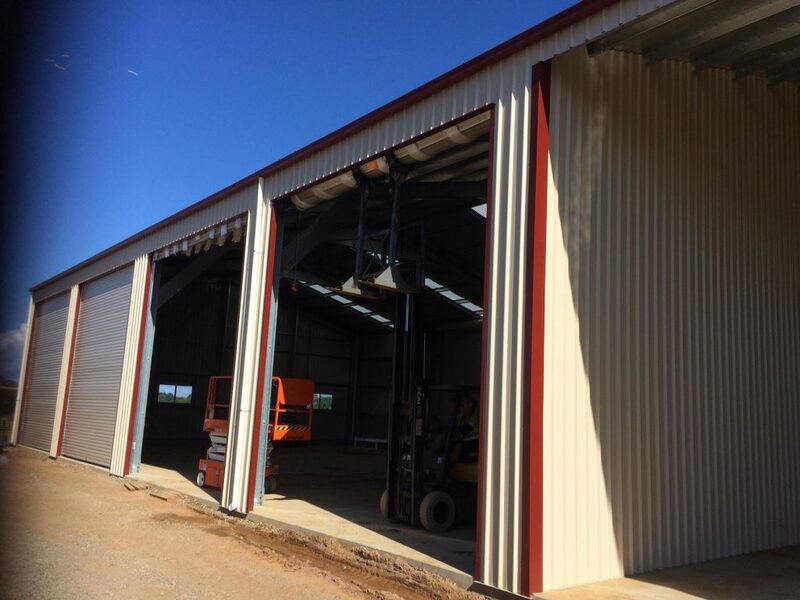 This allowed them to gain the maximum possible width from the shed and allow for a good size roller door for access. 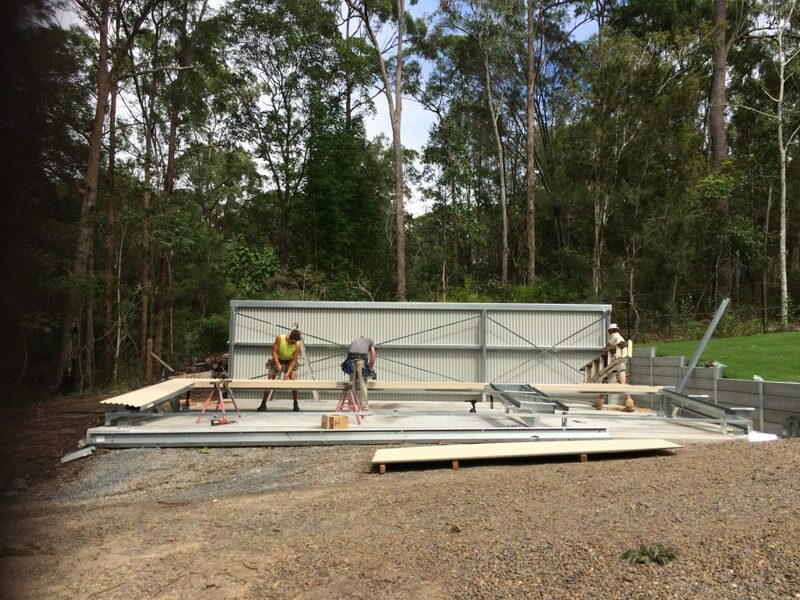 The final size was 3.3m x 9m, and it’s amazing just how much you can get into 29.7 sqm steel structure. 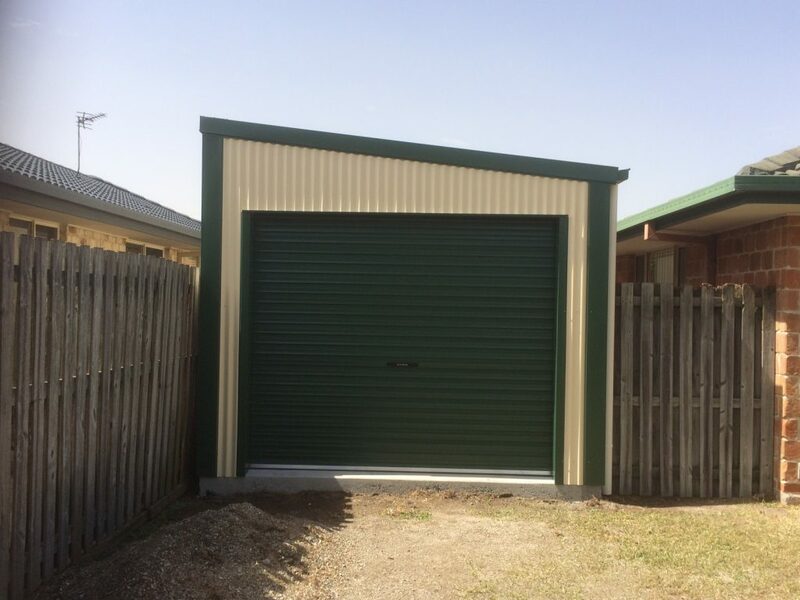 Got a small space? 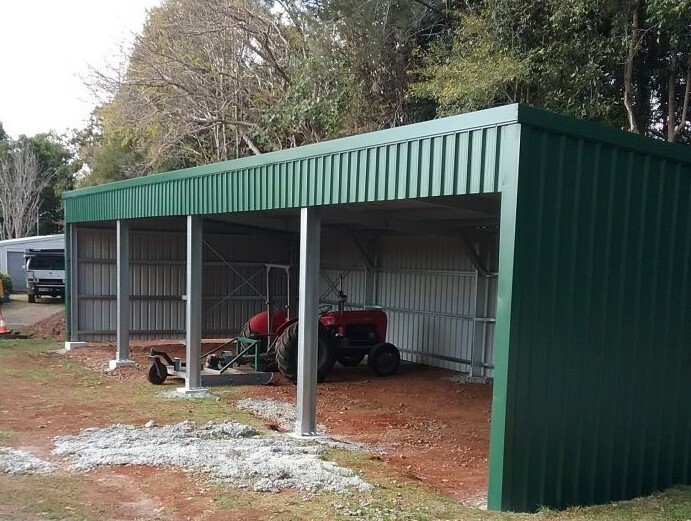 Want a shed to maximize storage? 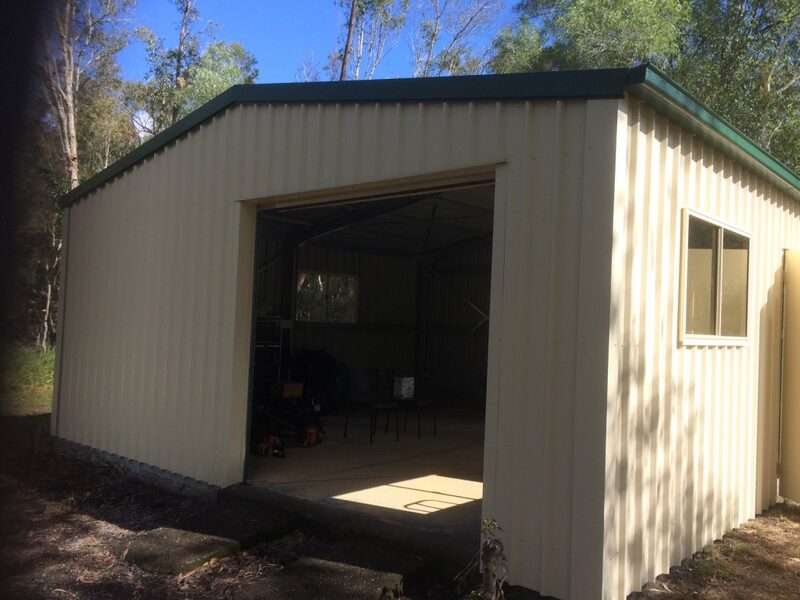 We are here to help, talk to Totally Sheds about getting the shed you need. 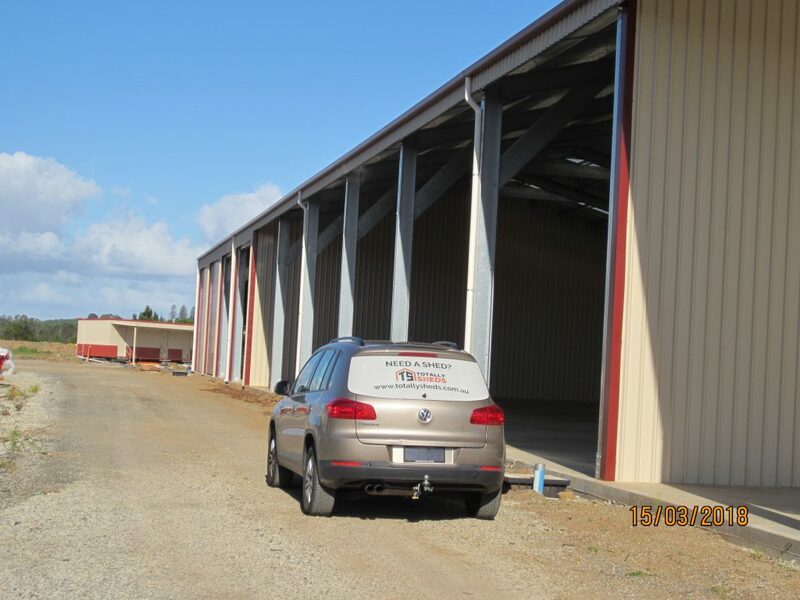 Our client needed a Farm Shed to house his tractor and some cars. 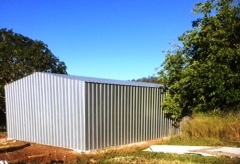 In addition, he needed somewhere protected to safely store other farm items. 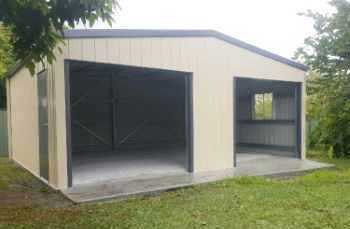 He was specific about his needs on sizes and dimensions and Totally Sheds simply delivered exactly what he wanted. 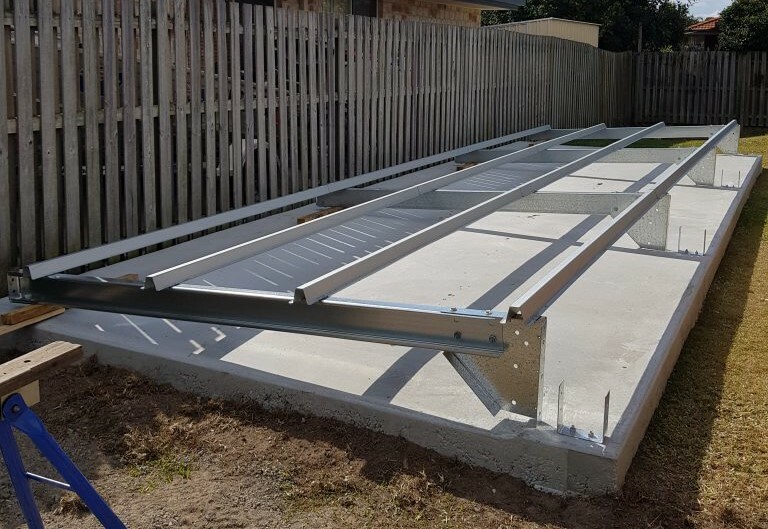 He engaged a favour from a mate in the concreting business to erect the piers and we supplied him with the correct plans to do so. 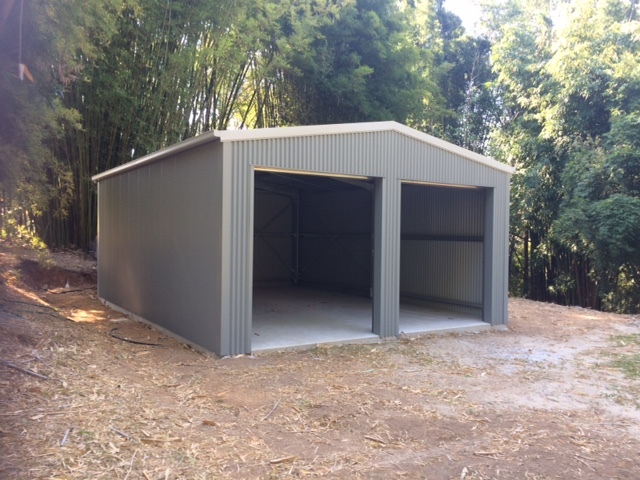 Totally Sheds erected the 3-sided shed for him and the result is another happy client. 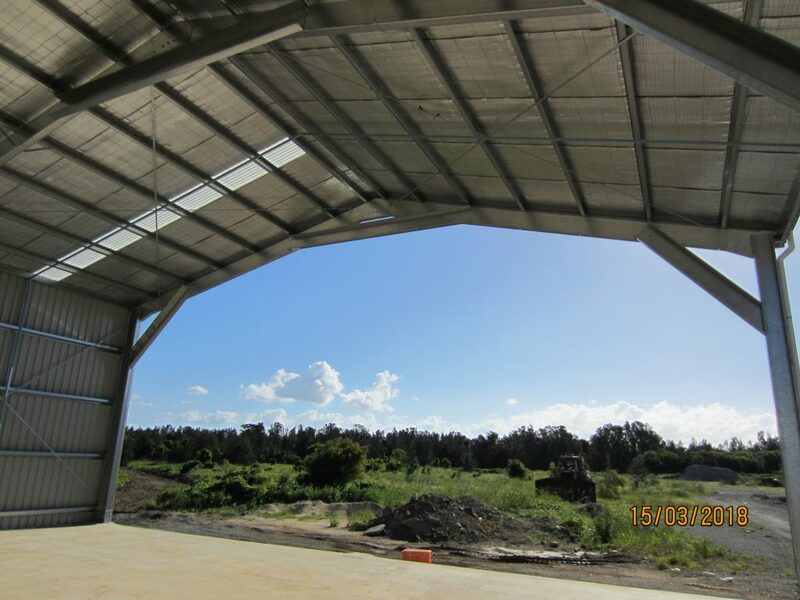 See the photos here and check out Paul’s testimonial on our ‘testimonials page’. 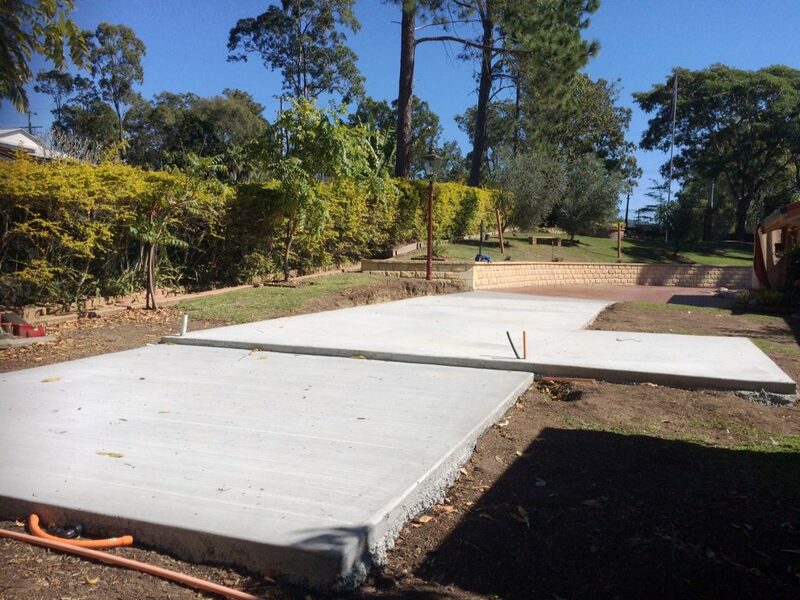 If you want something specific and exactly to your plans call or email them to us and we will design to suit. 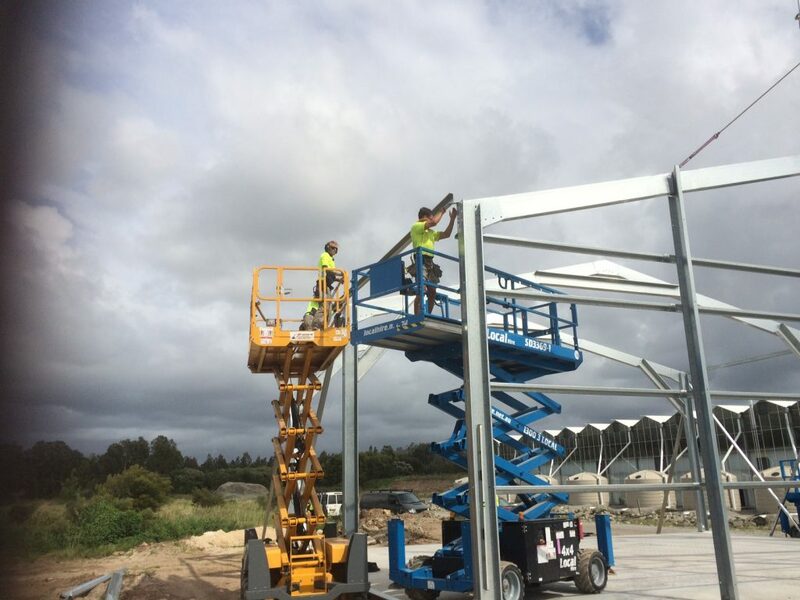 Alternatively, we can assist you with all aspects and answer any questions you might have. 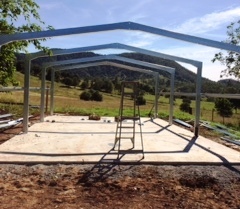 Get that shed project underway today. 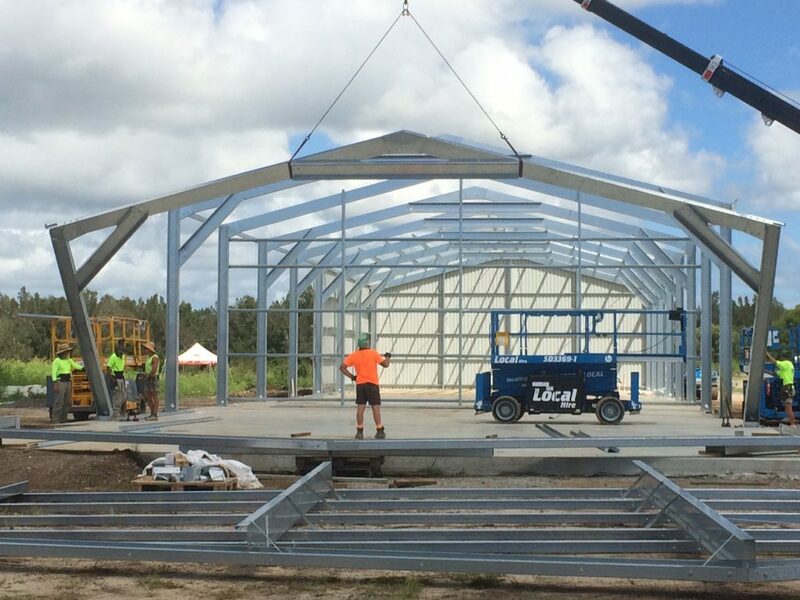 Contact Totally Sheds now! 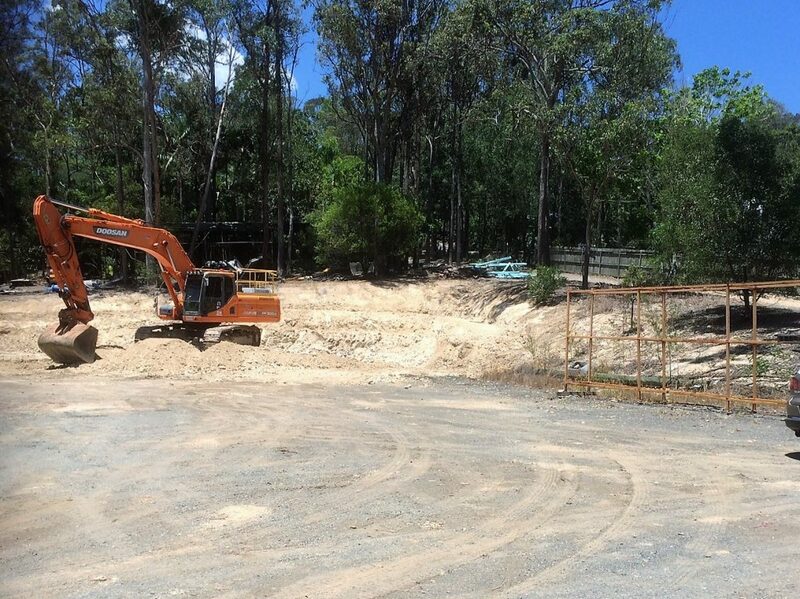 Our client purchased a fantastic block of land at Duranbah, New South Wales on which to build his ‘dream home’. 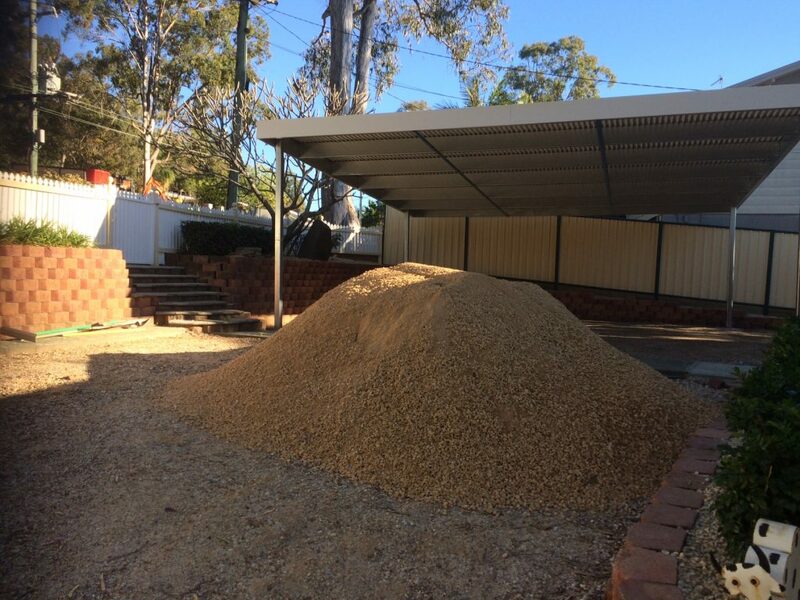 He decided he also wanted his ‘dream shed’ to complete the picture. 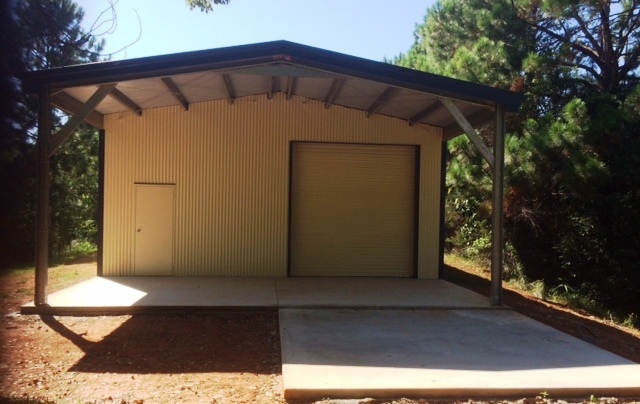 He engaged Totally Sheds to design and construct this multi-purpose steel building complete with workshop, room for storage and party room. 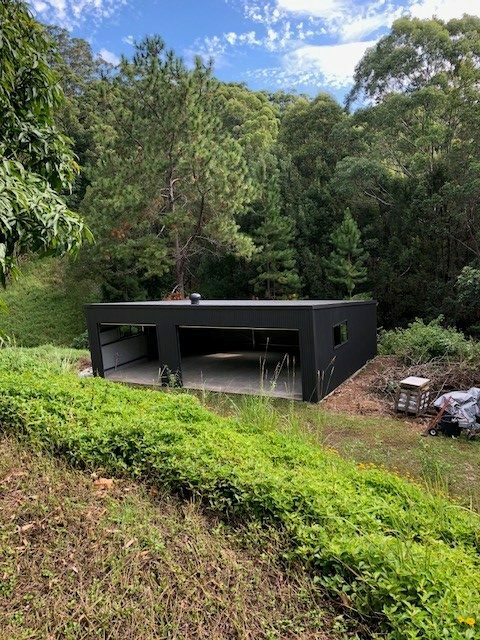 Located high on a ridge with stunning views of the Pacific Ocean, we worked together to design a shed to best capture the views from the lean-to/party area. 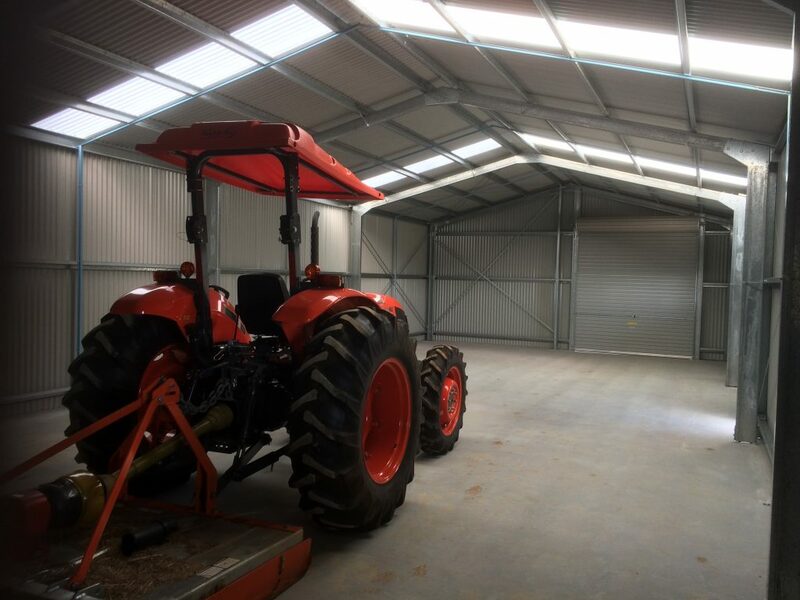 The client wanted roller door-access at both gable-ends to ensure his workhorse tractor could be sheltered from the elements. 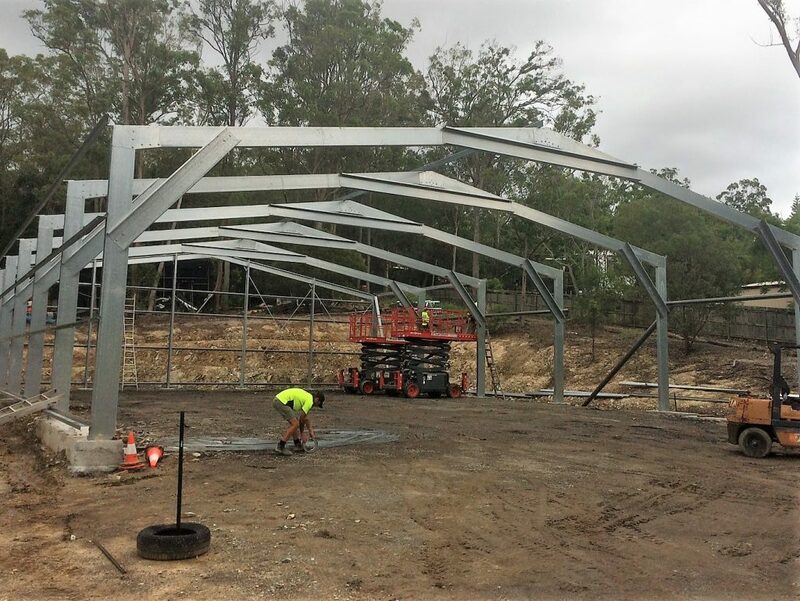 These pictures speak from themselves – one of our better locations to build a quality shed that will sit proud for many years to come. 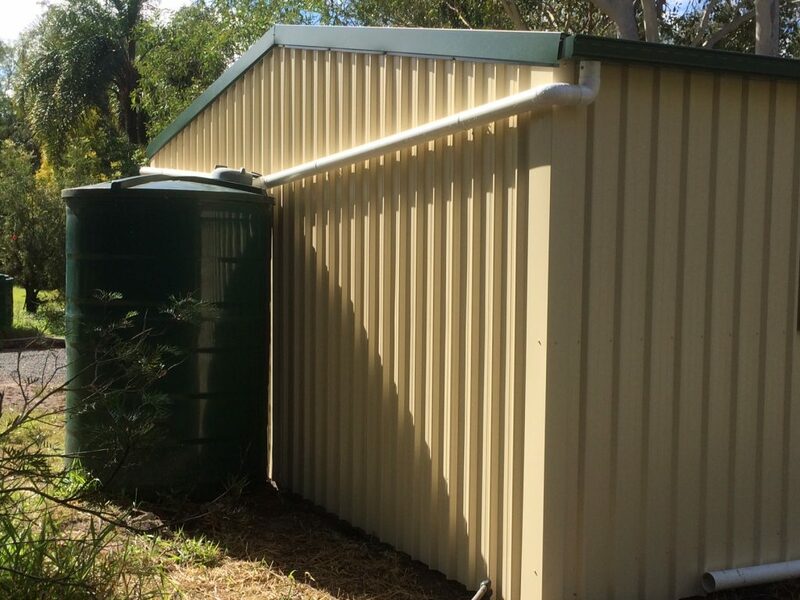 Our client had the unfortunate situation of a tree falling on his old Shed making it unusable – no problems Totally Sheds came to the rescue. 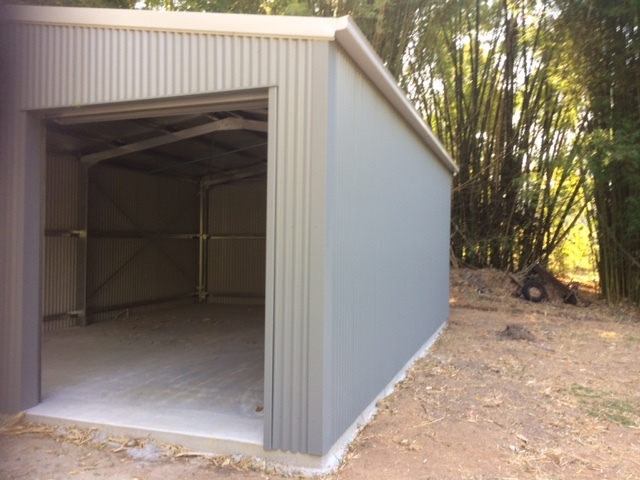 We measured the existing slab, supplied all new materials like for like and included some upgrades to make the shed better than ever. 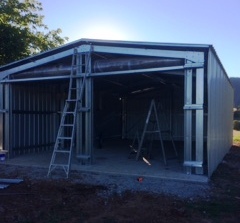 We also determined the old shed had never been erected properly and was just sitting on a slab that was not square. 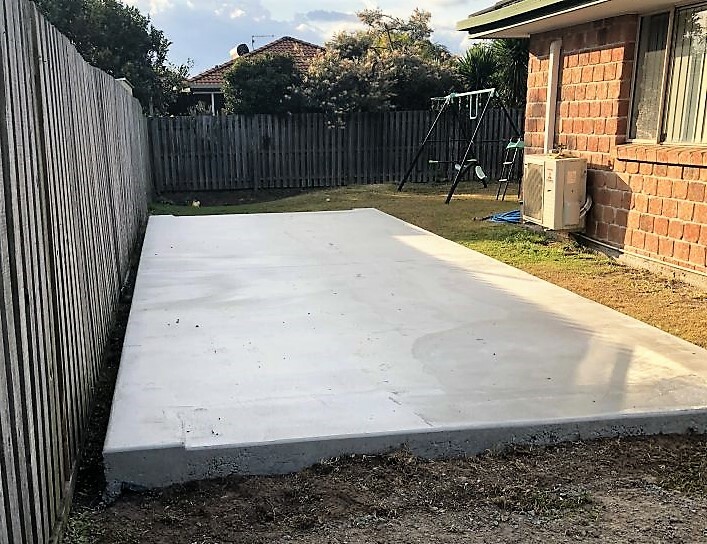 We fixed the old slab by cutting it square allowing for the replacement shed to sit properly over the slab providing effective weather proofing. 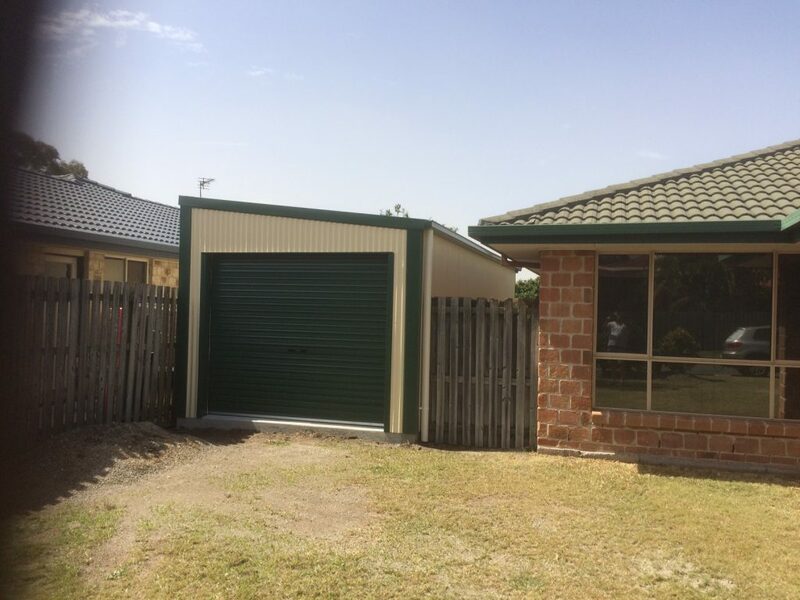 Our client now had the opportunity to select colours of Classic Cream and Cottage Green to compliment his home. 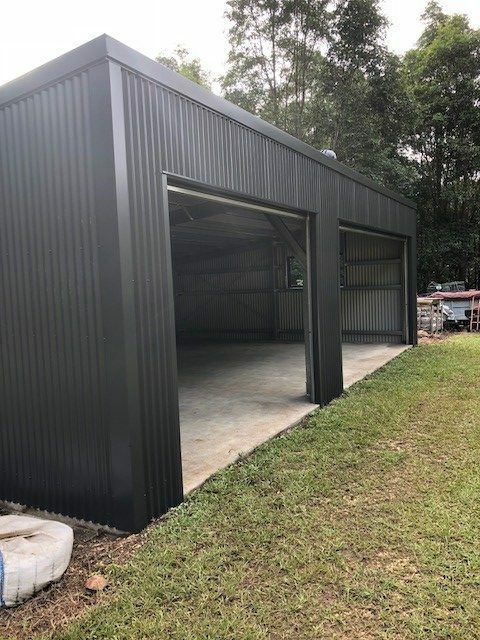 Wilson was extremely happy with the structure, design and service stating; “Great shed, fabulous end product and your builder was helpful and pleasant to deal with”. 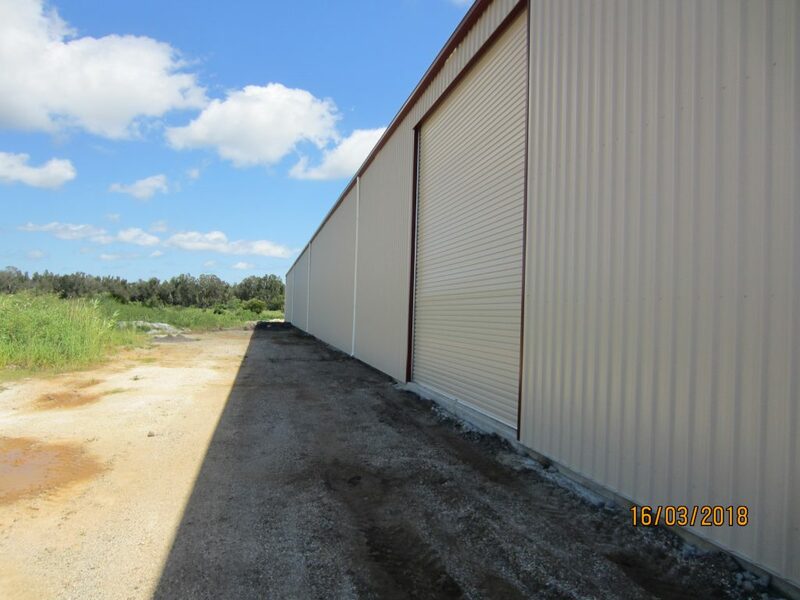 Turn a day of despair into one that leads to opportunity, all you need to do is contact Totally Sheds and we will help restore your steel building to better than ever. 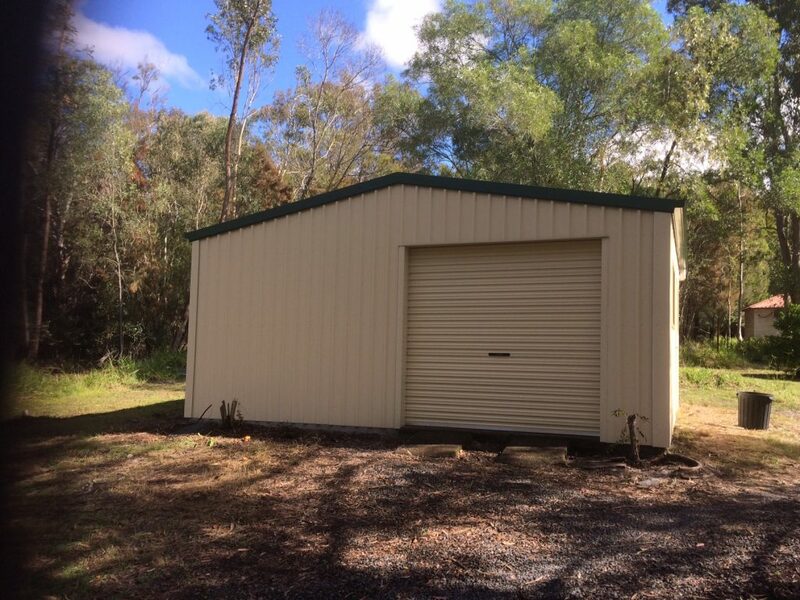 Need to protect a couple of vehicles, a ride-on or two, expensive tools and have space left over for a workshop? 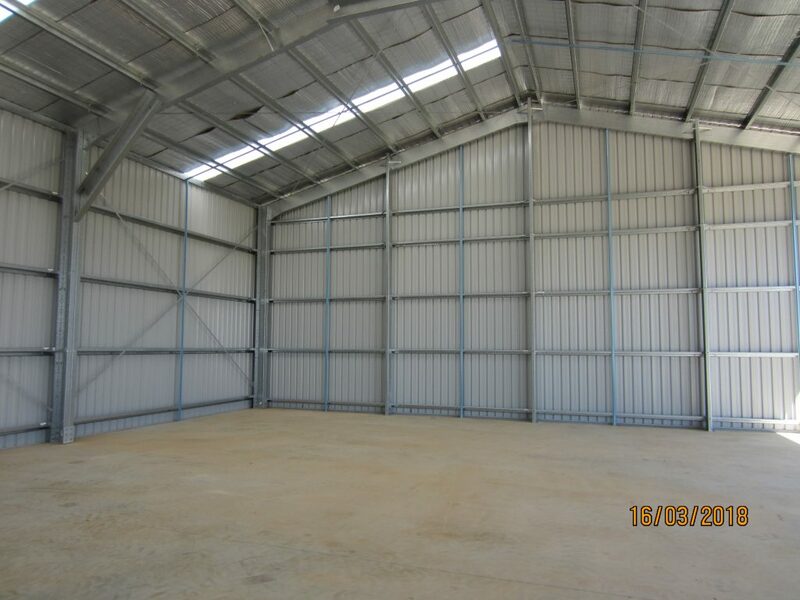 Totally Sheds provided the full package for our client based at Worongary. 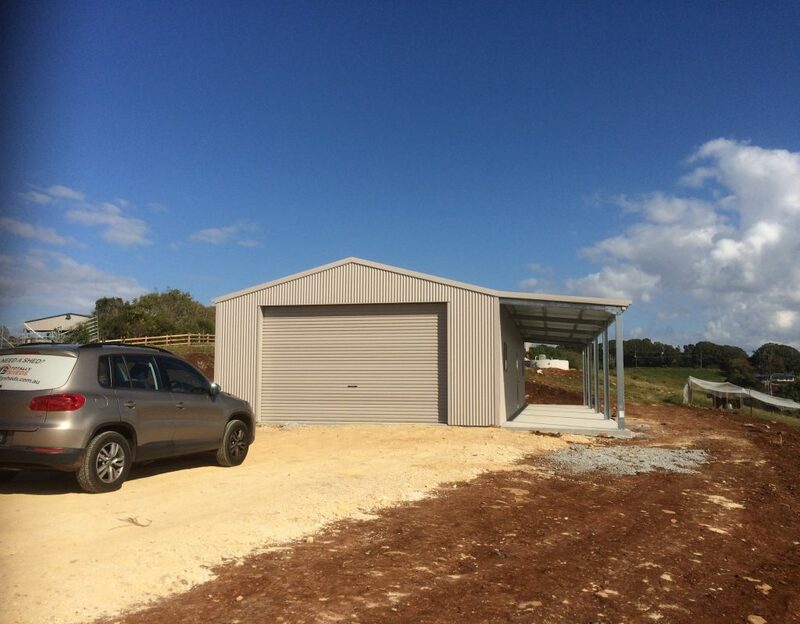 We organised the council application ensuring he could come as close to his boundary as possible; the clearing of the pad; the construction of his slab and spoon drain around the perimeter of the shed as well as the full construction of this Skillion Garage. 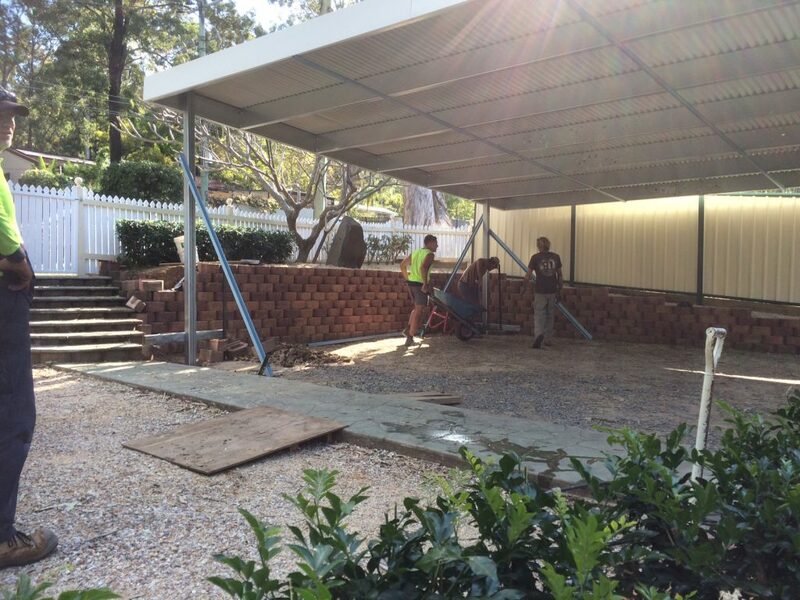 This 7m wide x 9m long skillion design is now a quality addition to our clients’ home. 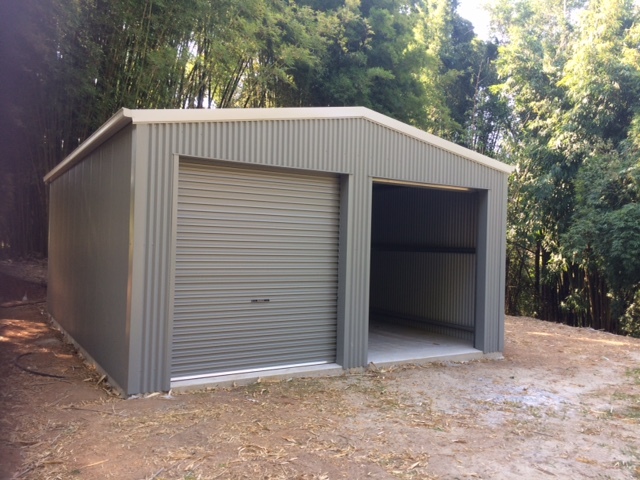 Made complete with electronic roller doors to provide ease-of-access for both he and his wife to park their cars and a separate door for the ride-on access as well. 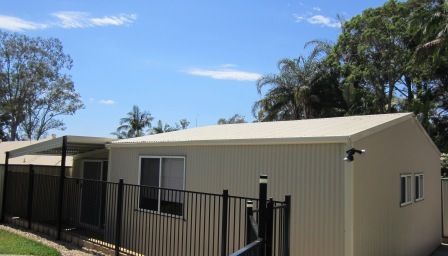 Colorbond Paperbark walls and Pale Eucalypt roof was chosen to match in perfectly with the existing home. 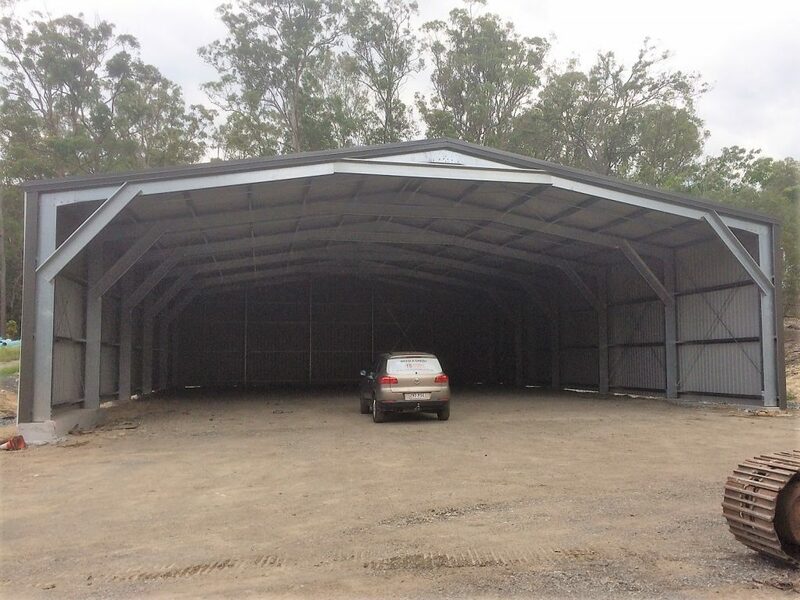 Whatever you want secured and protected from the elements, Totally Sheds has you covered. 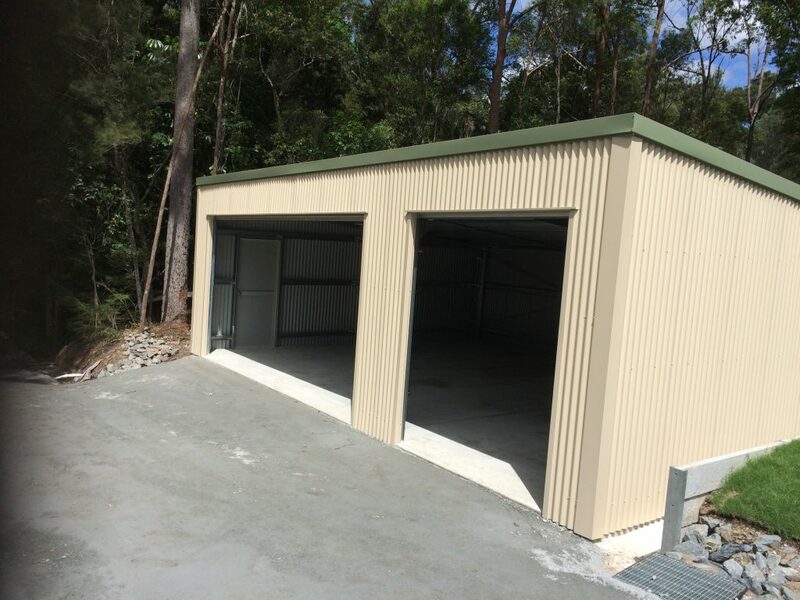 Bring us your plans or discuss with us what you want and we design the perfect fully-enclosed garage to suit your needs.If you want, we can arrange the whole project for you – all you need to do is enjoy the finished structure after we have cleaned up and left you with the keys. 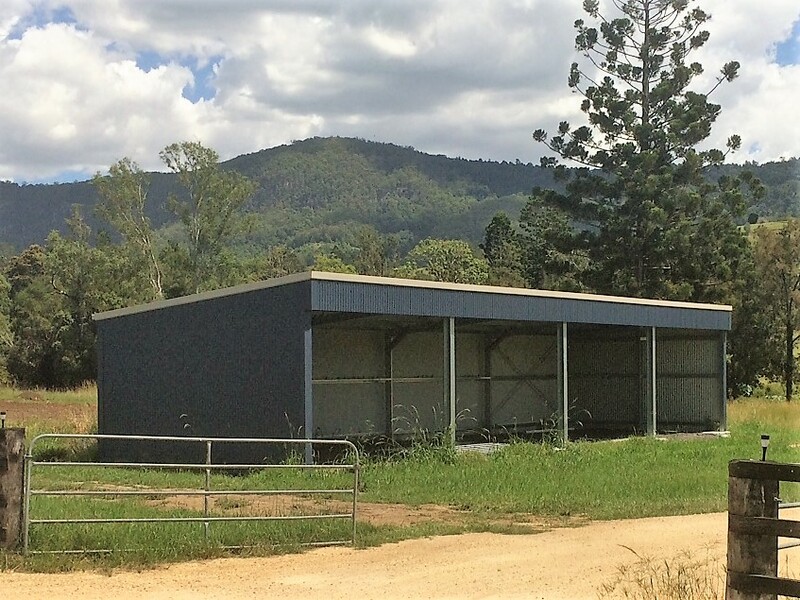 Our client had a secured a fantastic block of land just outside Mullumbimby and wanted a cost-effective way of having a ‘weekender’ where she could wake up to the view of mountains and catch the sunset at days end. 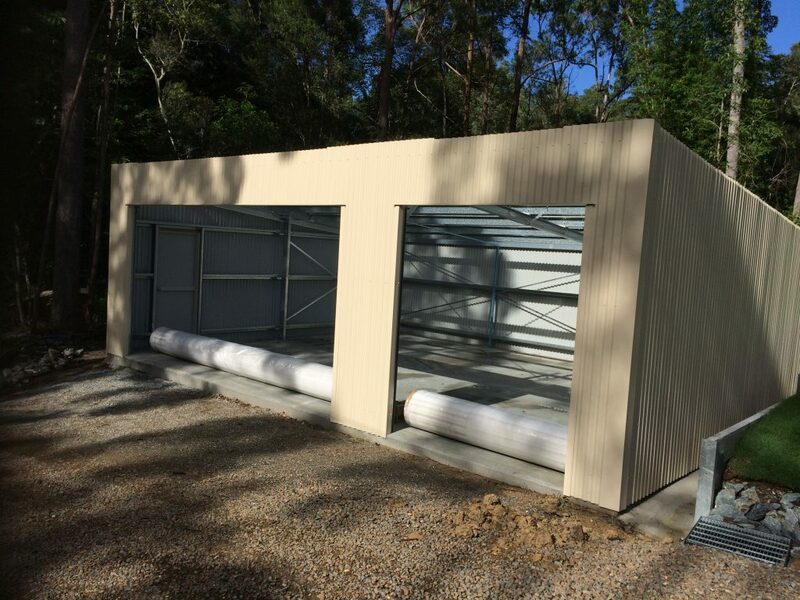 Totally Sheds worked closely with her to ensure we designed what she needed and as cost effectively as possible. 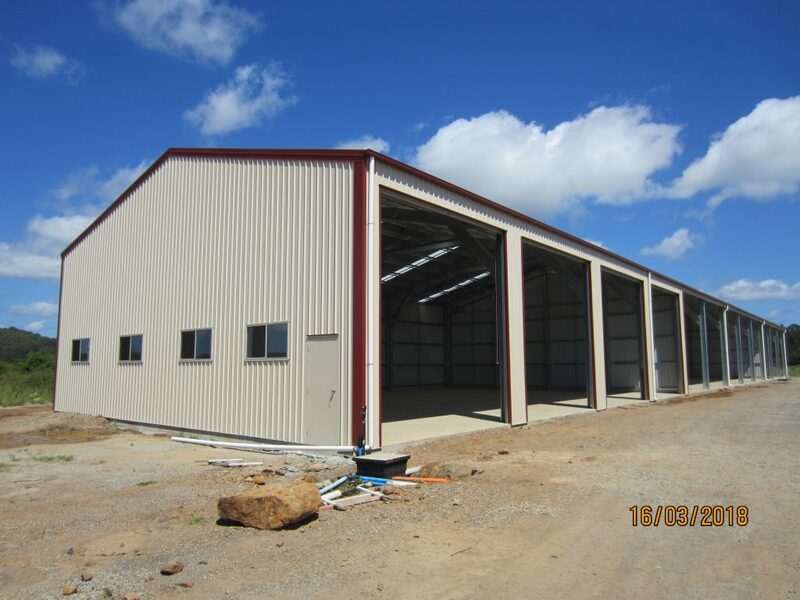 Ultimately an 8m x 12m x 5m Class 1A Building was settled on as the best option. 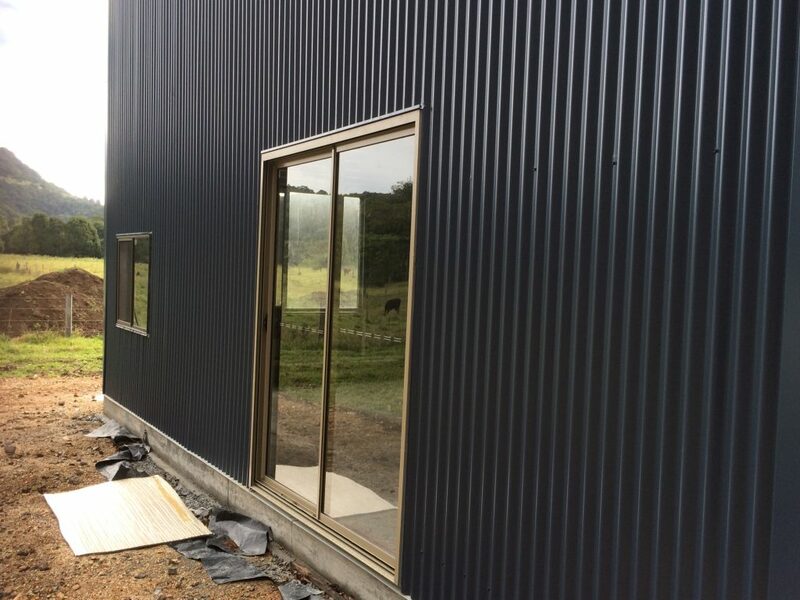 We supplied all the materials including glass sliding doors, but also incorporated in to the deign some unique windows the client had sourced locally. 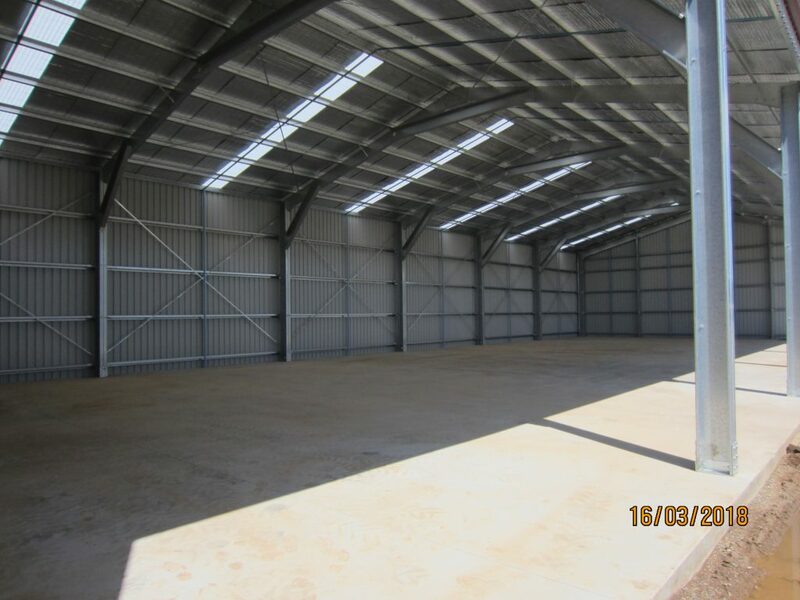 To maximise floor space, we incorporated a fully engineered mezzanine level across the whole building, giving a total floor space of 192 sqm. 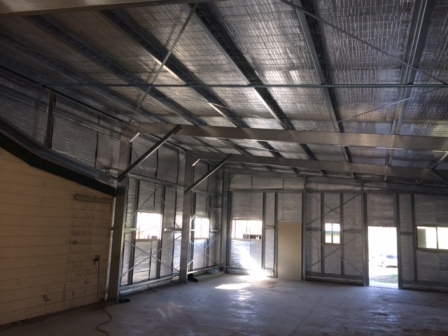 The whole top floor was fully insulated using Polyx multi to the roof and walls. 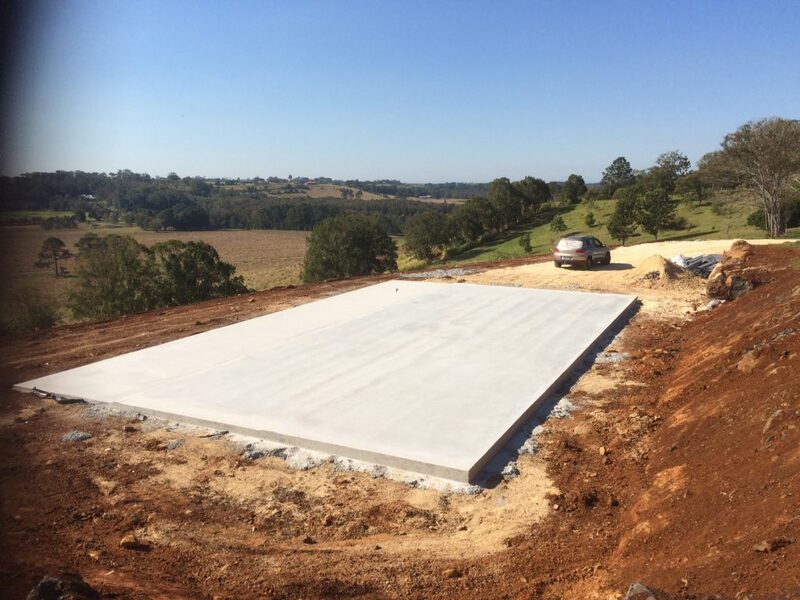 The client had a close friend that is a concreter, and Totally Sheds supplied all plans to them to complete the slab to specifications. 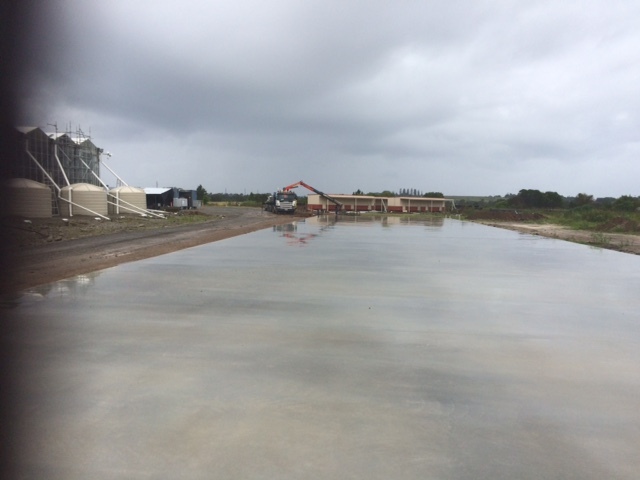 We then constructed the building for the client on that slab. 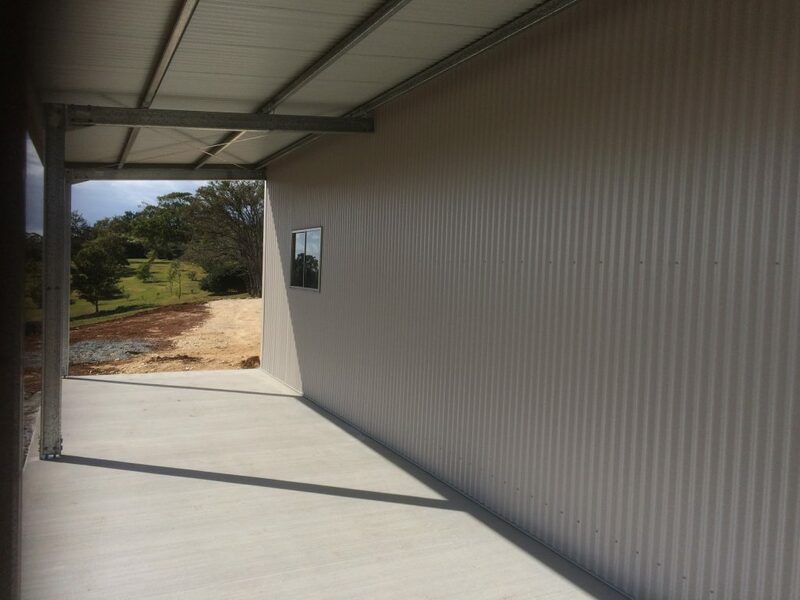 Deep Ocean Colorbond sheeting was chosen for the walls along with Evening Haze for the roof and Cove for the roller doors. 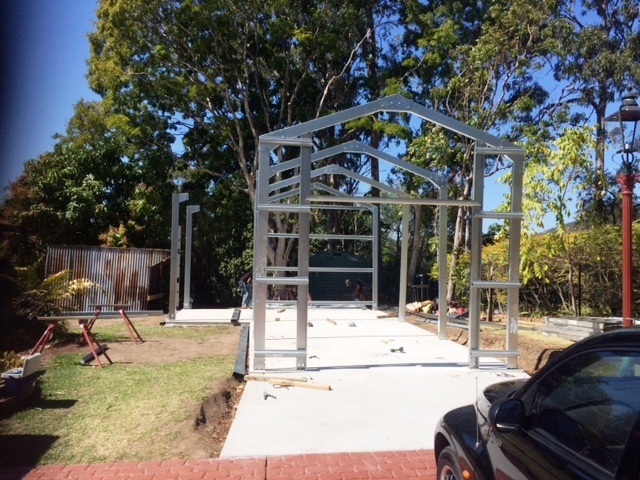 This perfectly complimented the camphor laurel surrounds. 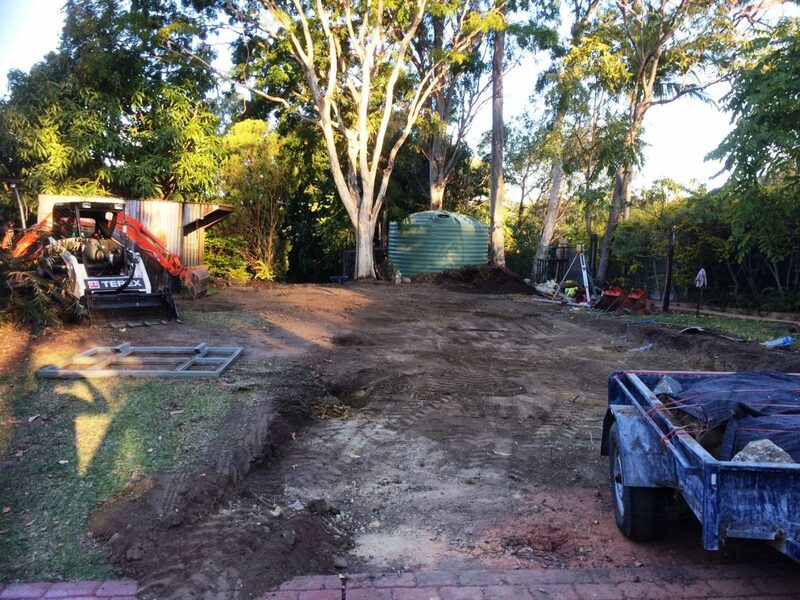 The client was very happy with the end result and we believe once some landscaping and gardening work is complete this will be the oasis she was dreaming of. 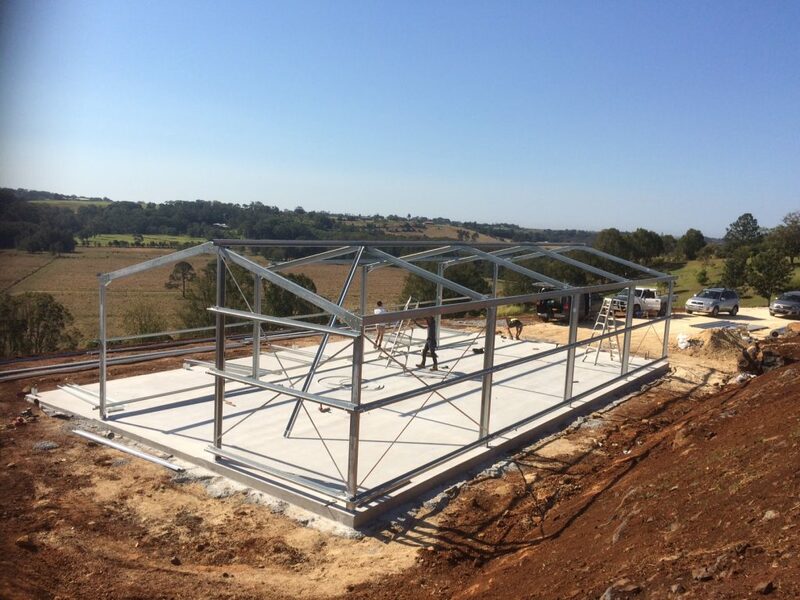 Got a project in mind? 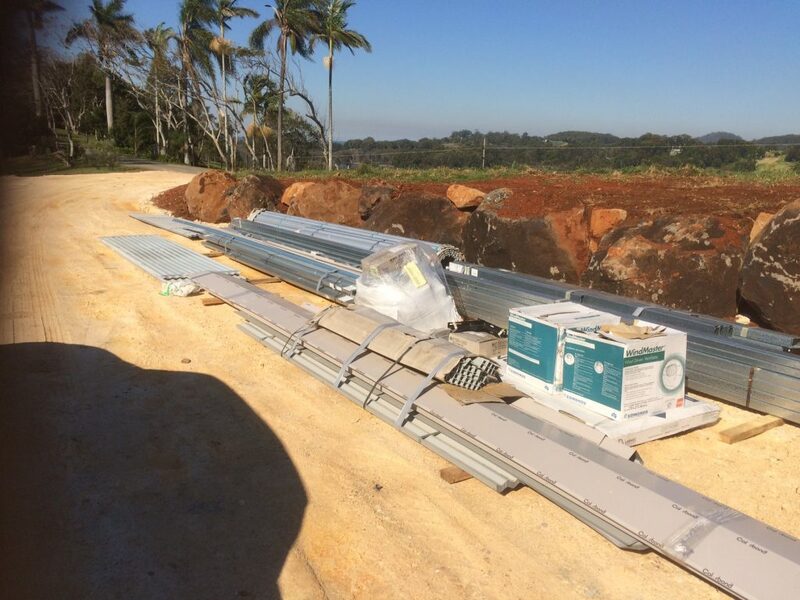 Call and let us work with you to make it a reality and start enjoying your piece of paradise. 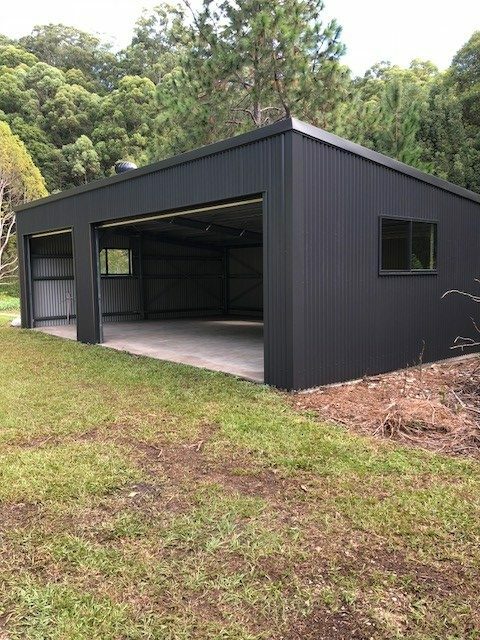 Our client at Currumbin Valley wanted a Skillion Garage that would accommodate his beloved 1963 EH Holden along with space for his camper van. 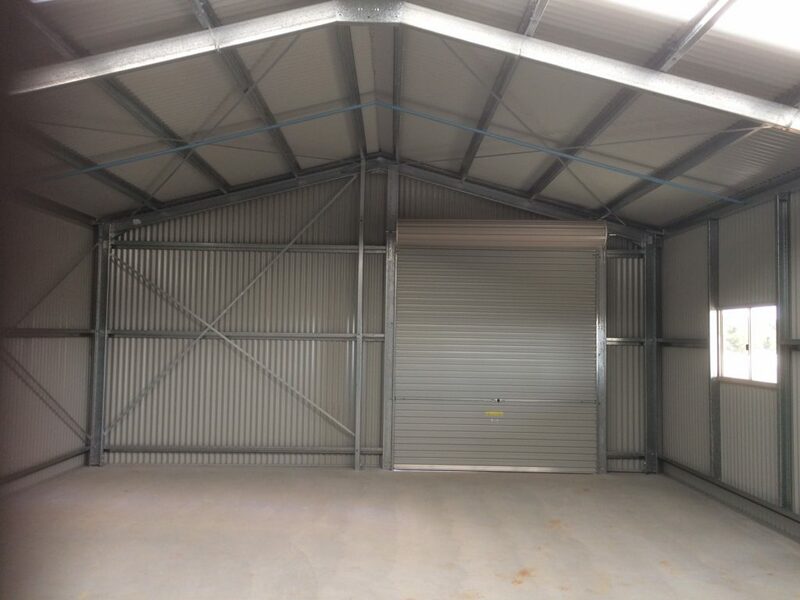 Totally Sheds designed a structure that worked in with his existing slab and ensured he had separate areas to park the camper van and give his ‘pride and joy’ plenty of room to enter and exit the garage via a full width 5m roller door. 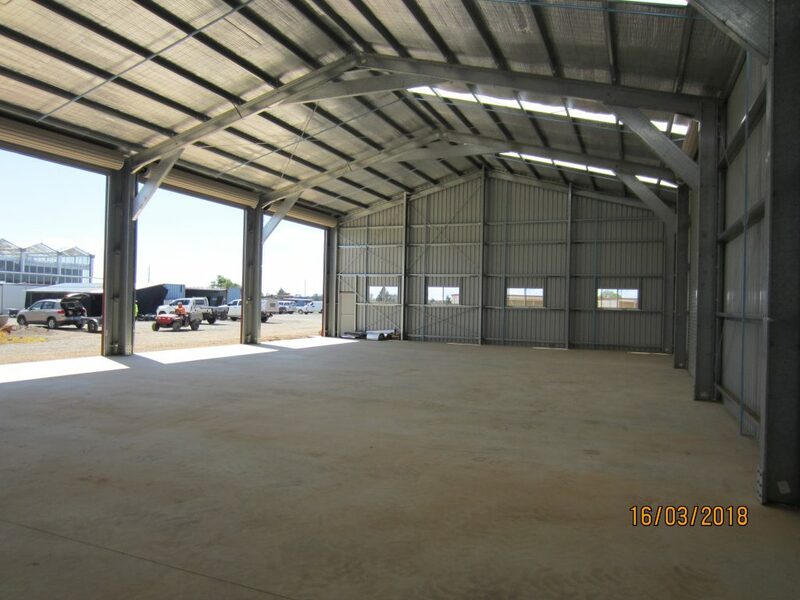 The 5.95m bay for the EH also allows him plenty of space to work on the classic 179 motor, and keep the body work clean for those classic Sunday drives. 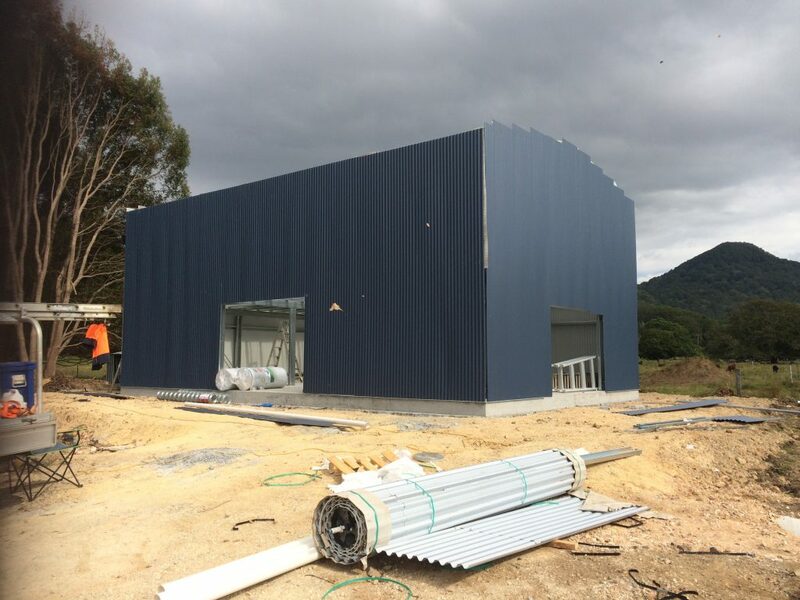 Colorbond Monument in Corodek profile was used with matching windows and doors chosen to compliment the clients house colours. 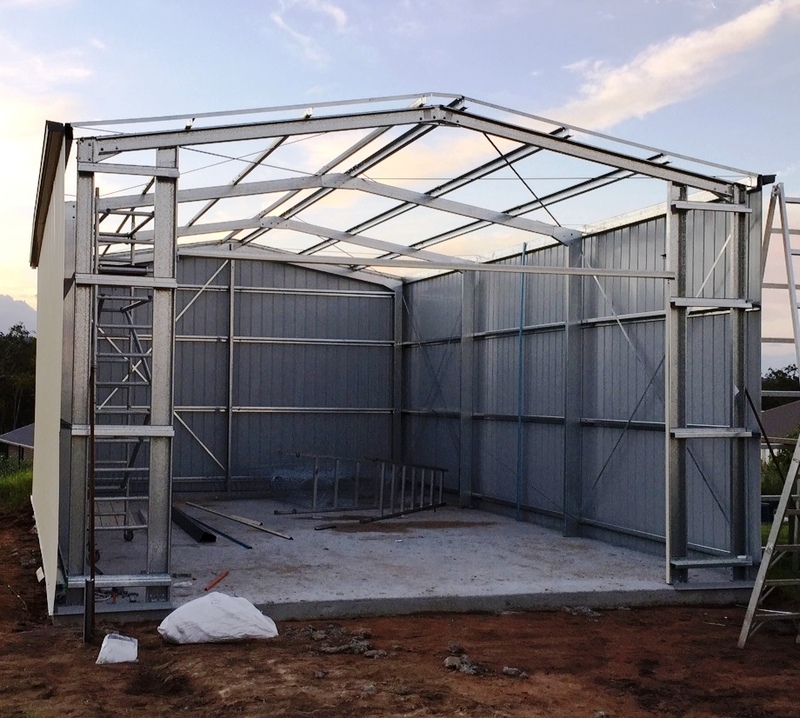 Totally Sheds erected the whole job in two days. 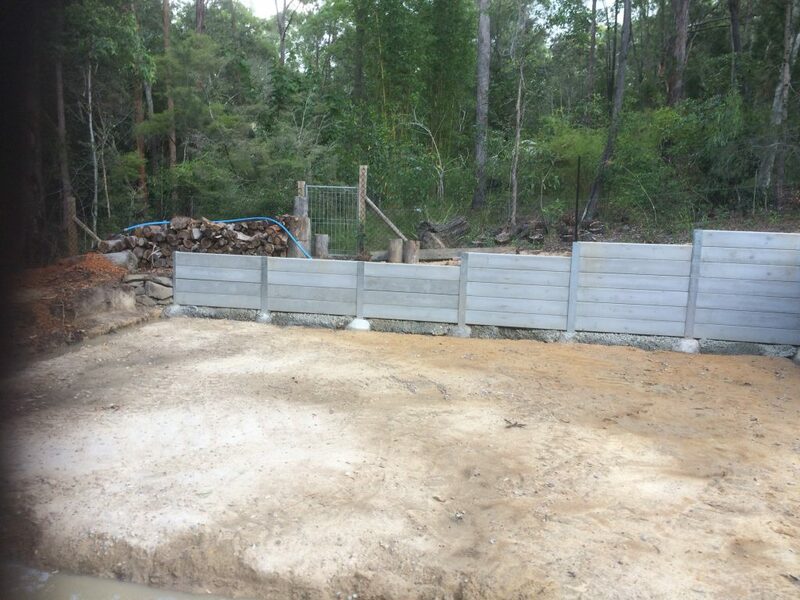 Check out Paul’s testimonial in our Testimonial section, he is very happy with the end result. 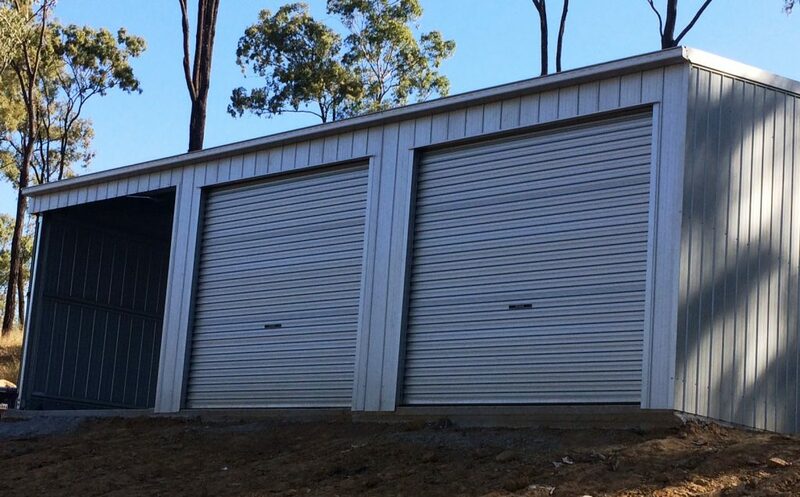 Got something precious you want protected from the elements? 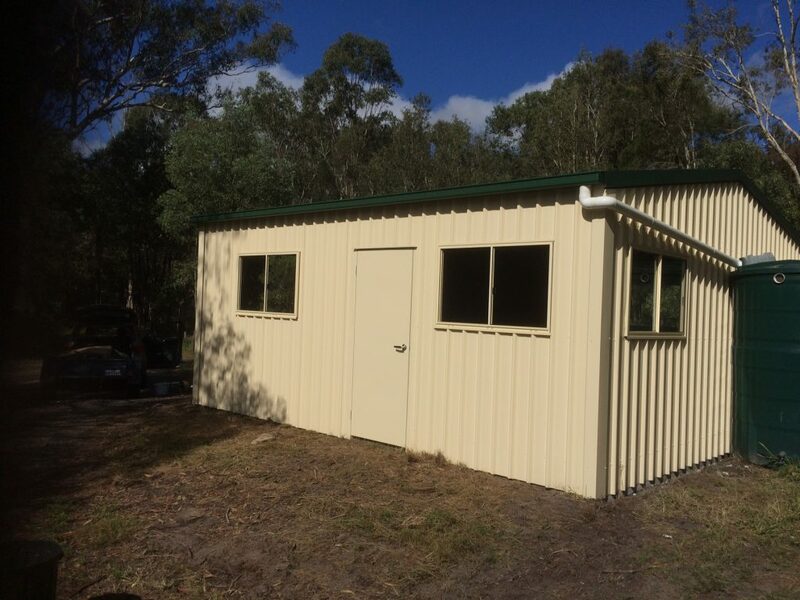 Give us a call or email us to get your shed project started today. 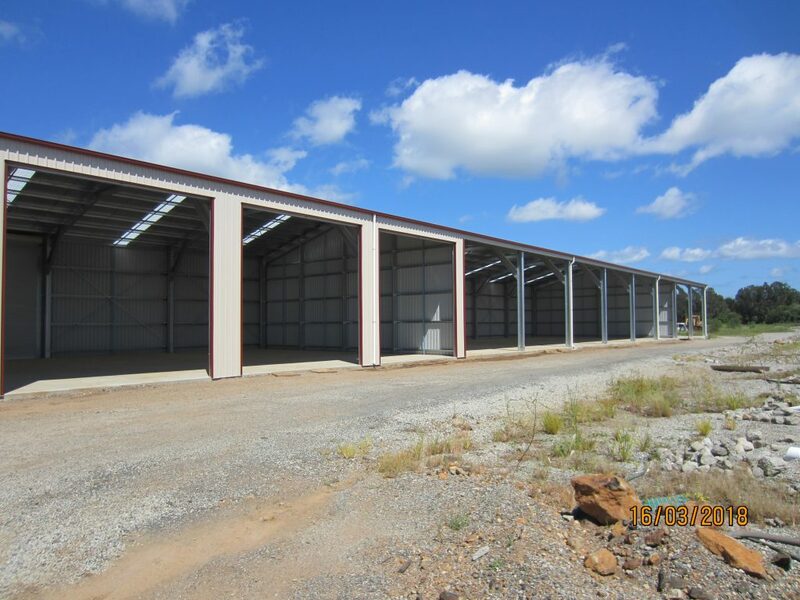 Need plenty of space for storage of all your expensive rural property equipment; ride-on mowers, tractors and other tools etc? 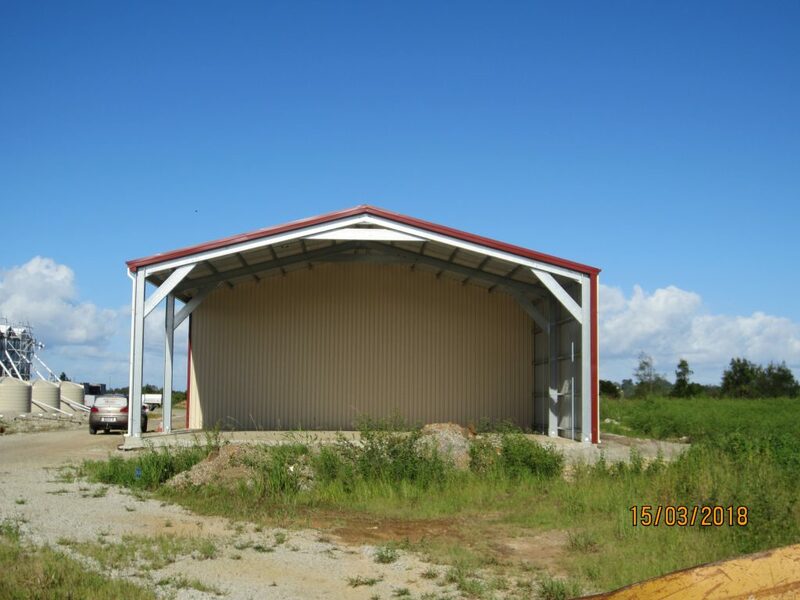 Totally Sheds has you covered. 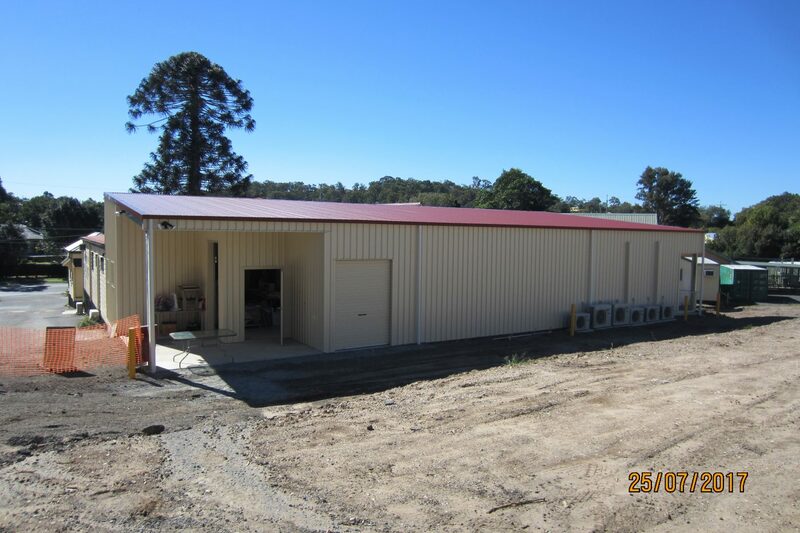 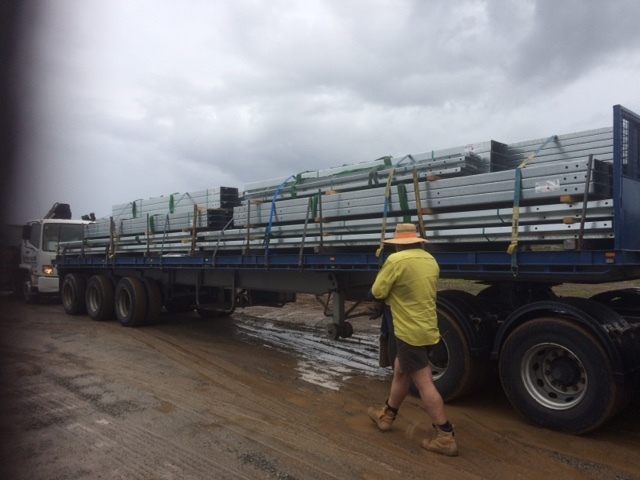 We supplied the kit for this 9m x 20m x 3.6m Rural Shed for construction at Norwell QLD. 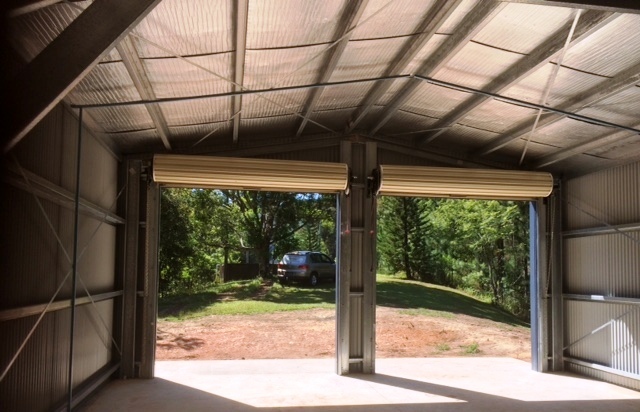 Our client incorporated 4 x 3m x 3.3m roller doors to give him plenty of access into the shed. 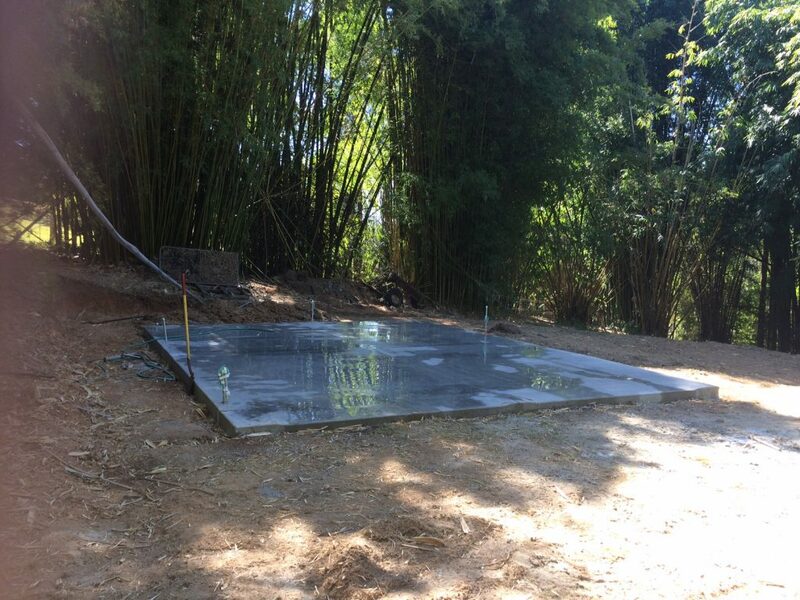 He engaged us to provide the concrete slab for him and he decided to erect the shed himself. 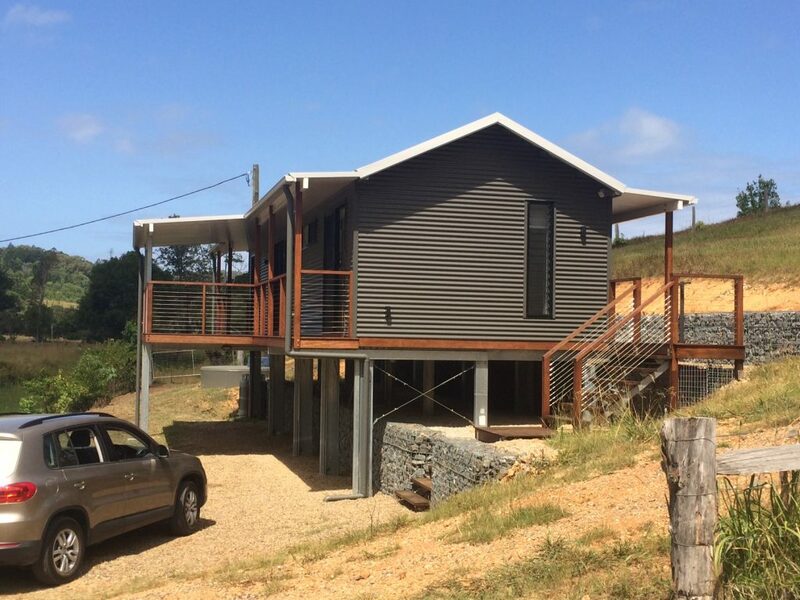 With the aid of a ‘builder relative’ along with our construction manual and a few clarifying phone calls, the photos show he did a terrific job. 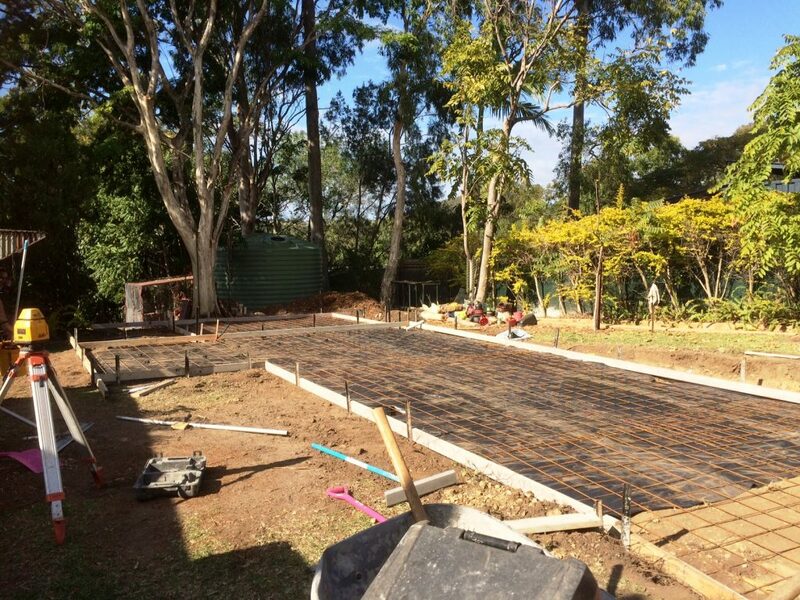 We can provide you with the full suite of services including kit, slab and build or you can pick and choose which option suits you best. 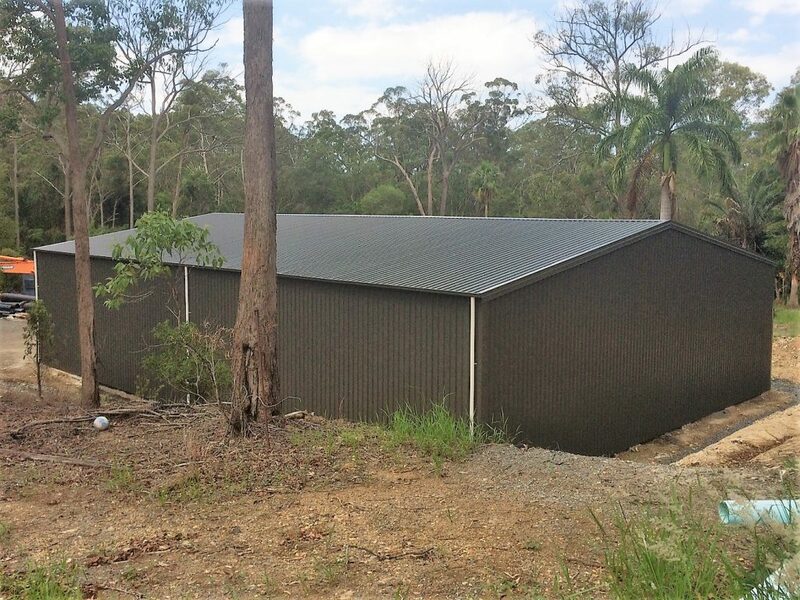 Give us a call to get your shed project started today and check out our client’ testimonials on our service. 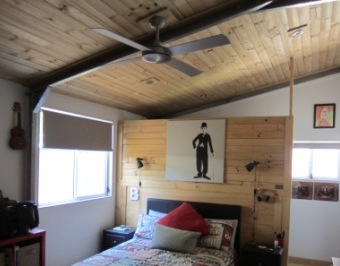 Like Josh you will be glad you called. 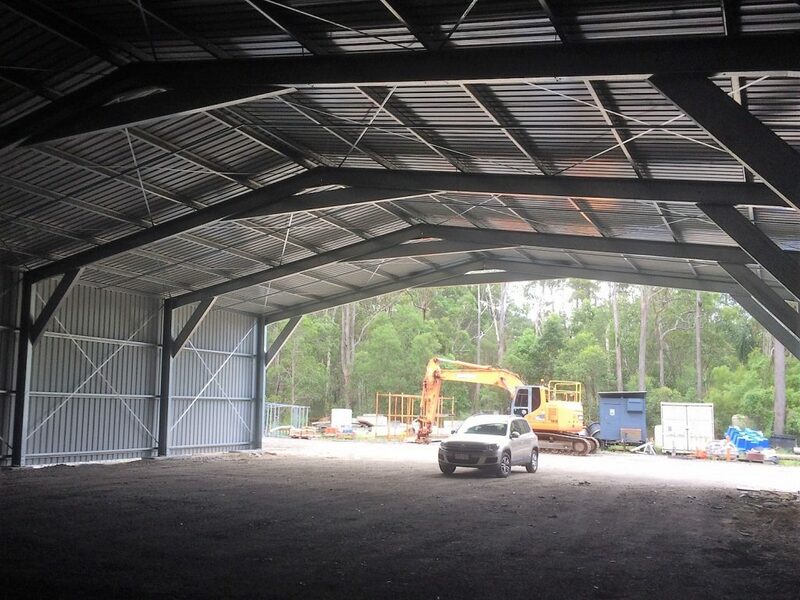 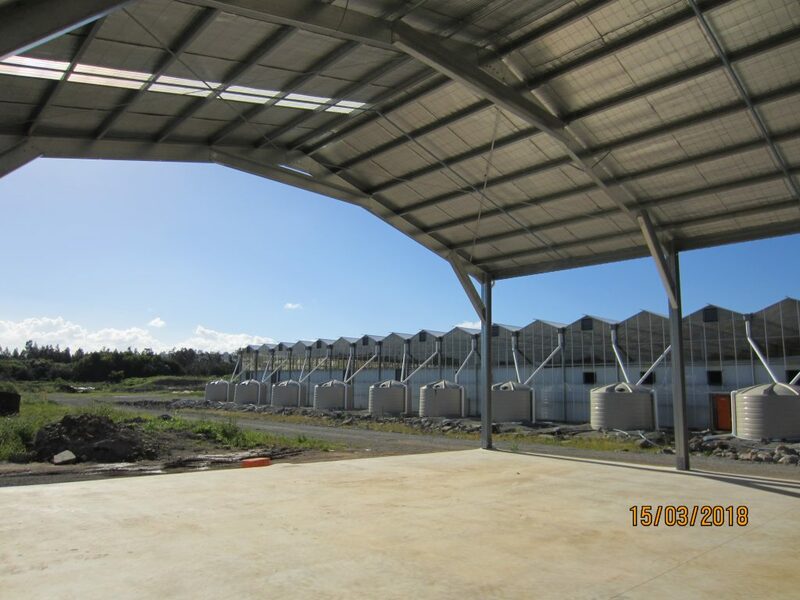 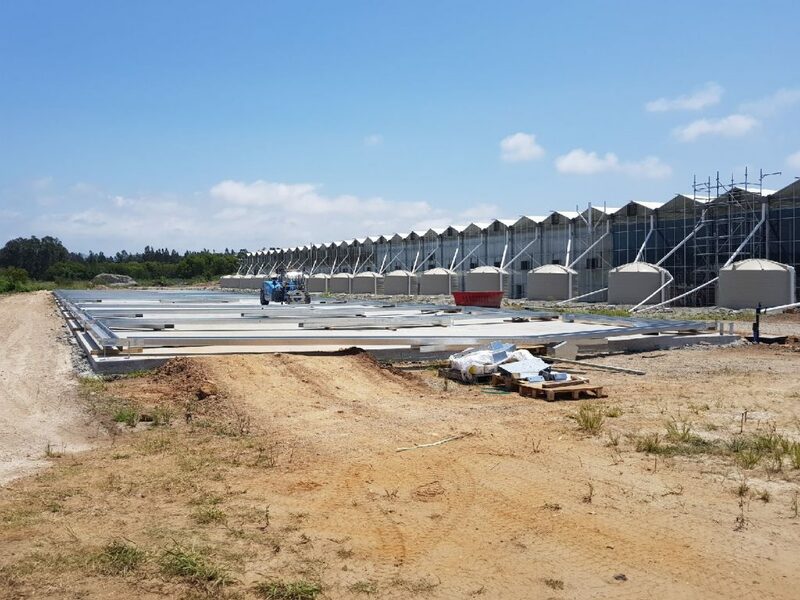 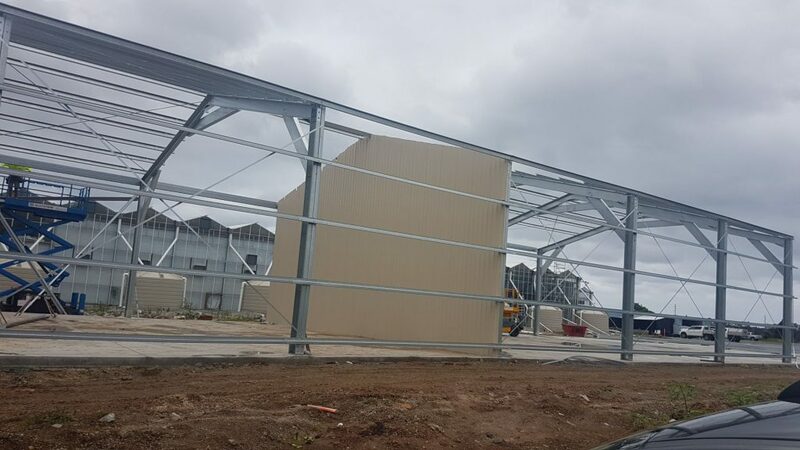 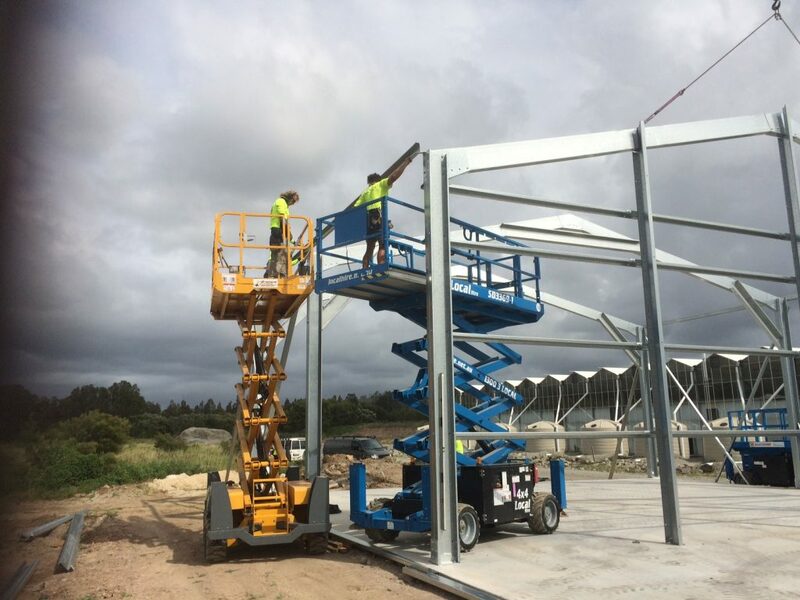 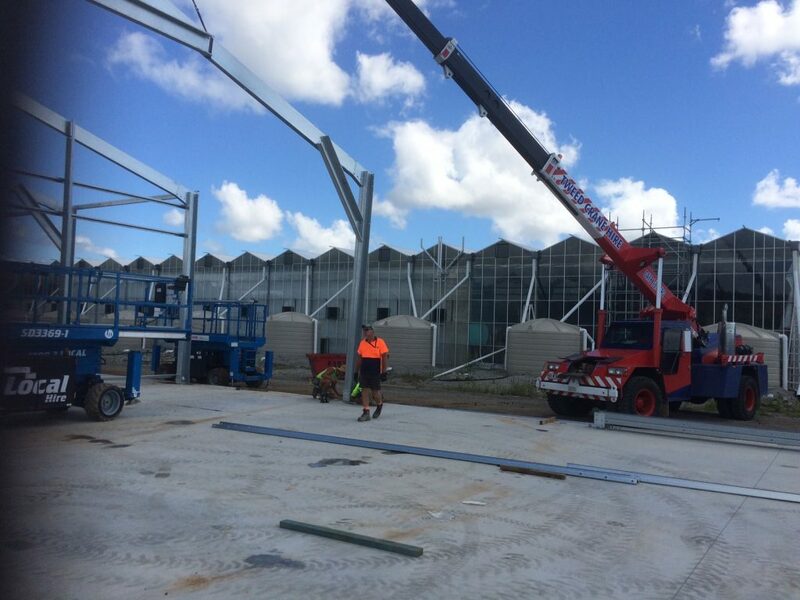 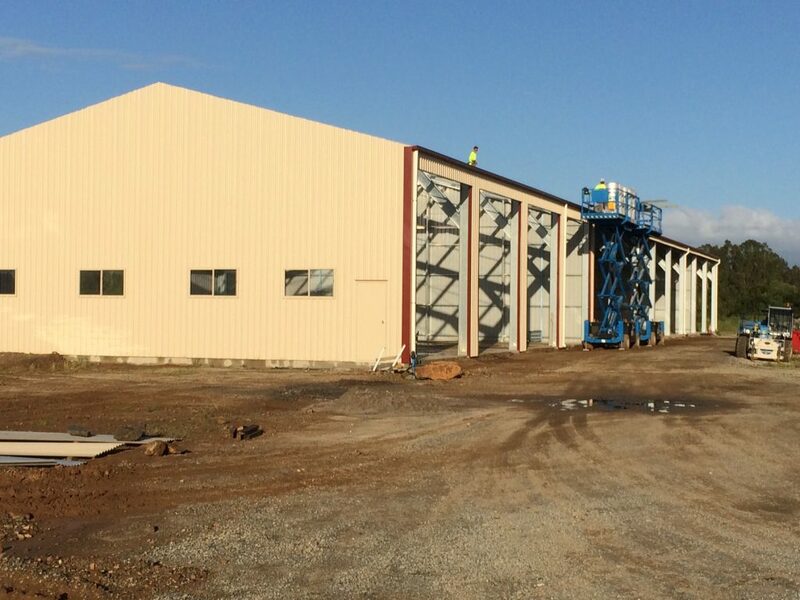 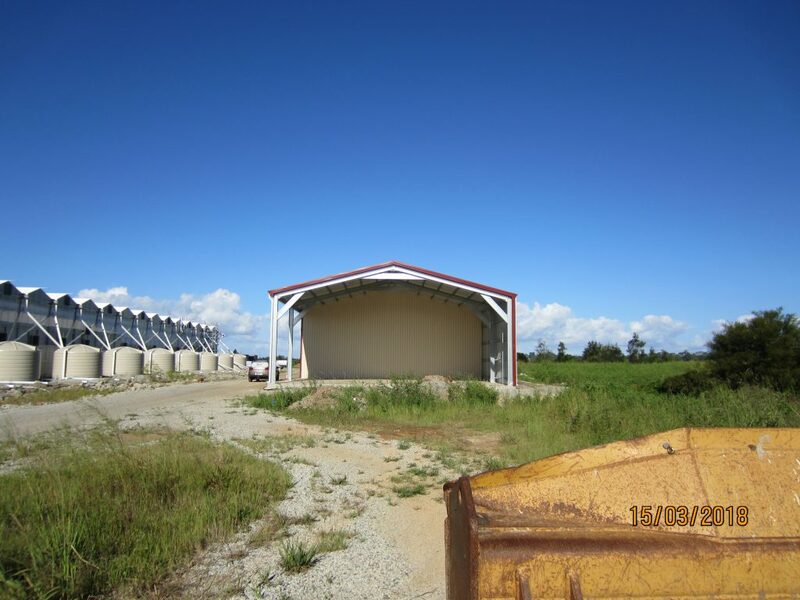 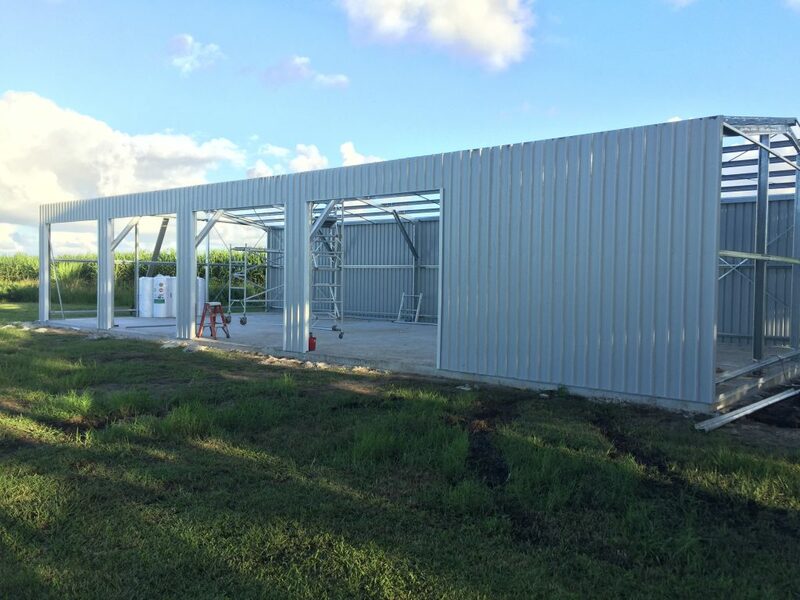 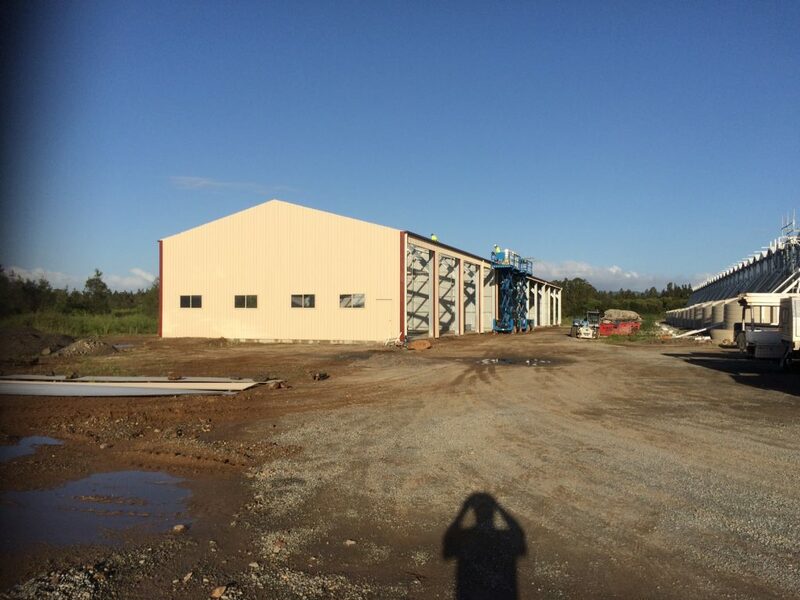 Our client, Australian Bay Lobster Producers needed a large Shed to facilitate their operations expansion. 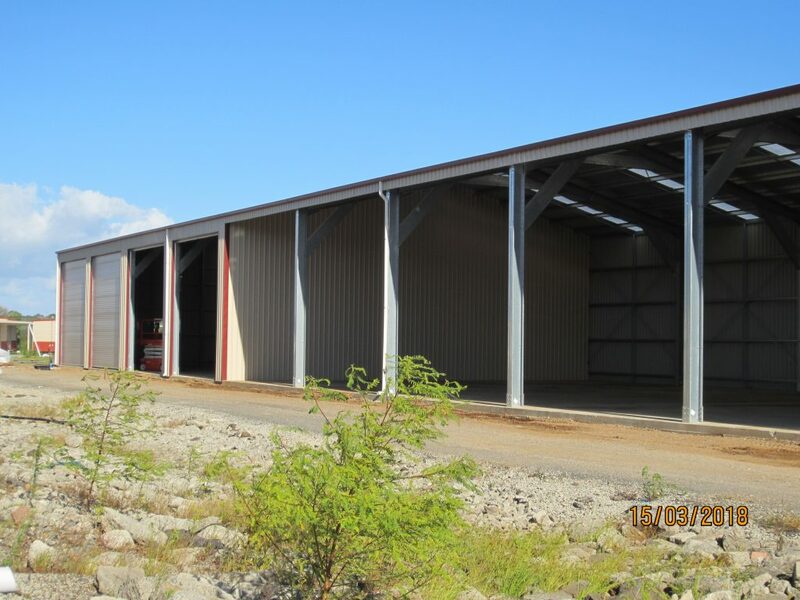 They approached Totally Sheds to design and construct a 15 x 72 x 5.6m 12-bay combination storage/workshop/open front steel structure. 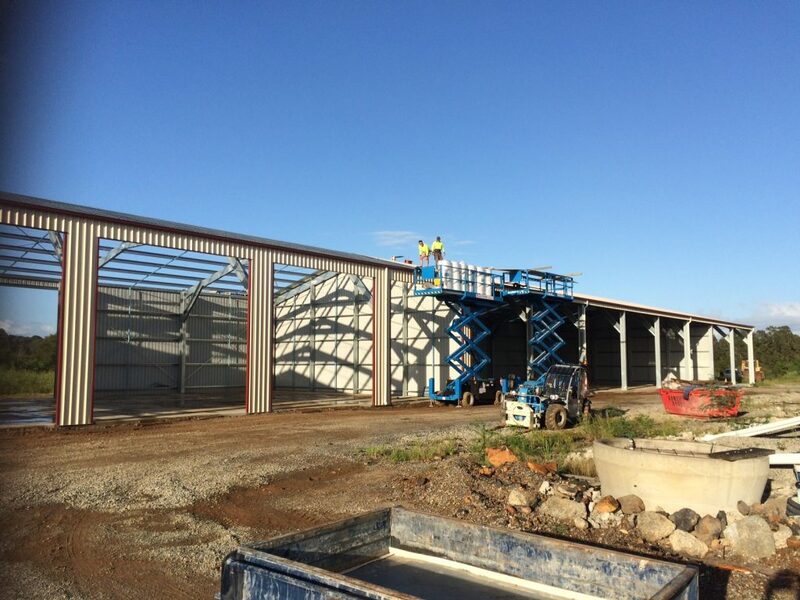 Totally Sheds worked with the clients’ preferred concreter then supplied and built this massive structure including five 5 x 5m automatic roller doors. 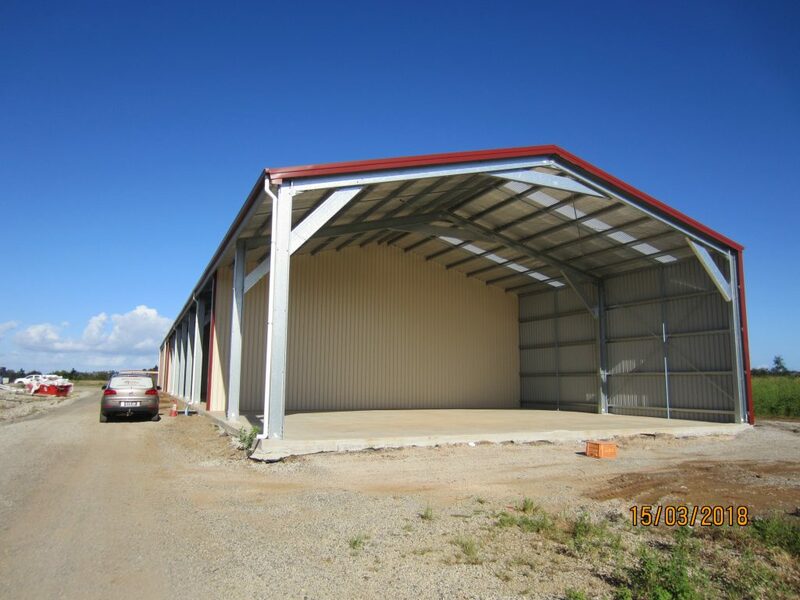 Whatever your project big or small Totally Sheds will work with you to deliver the desired steel building for your needs. 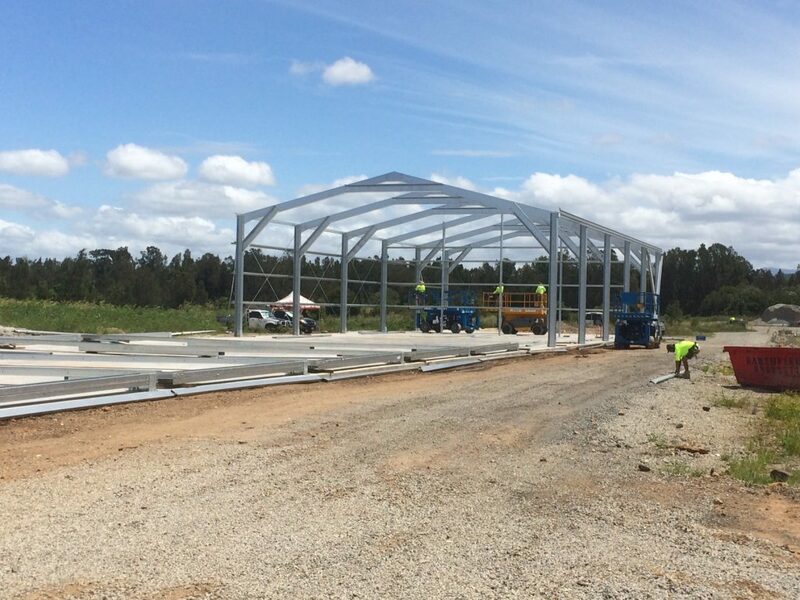 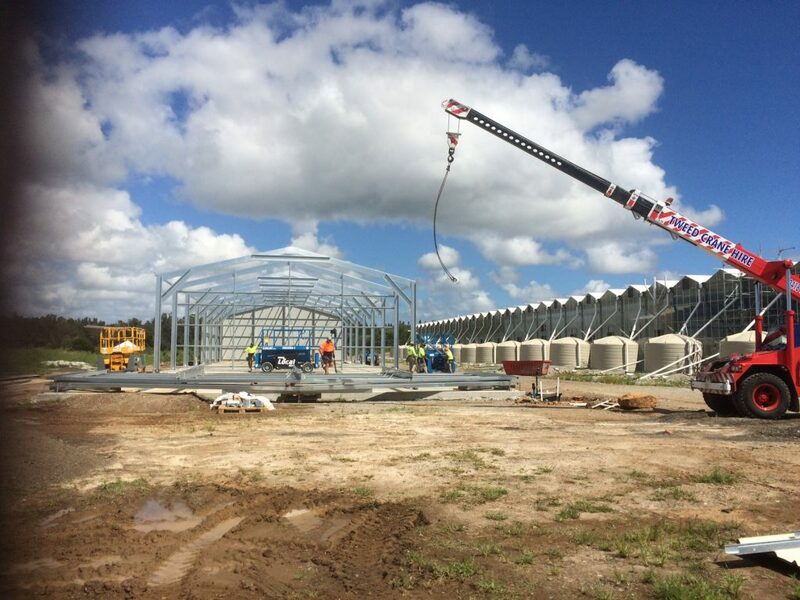 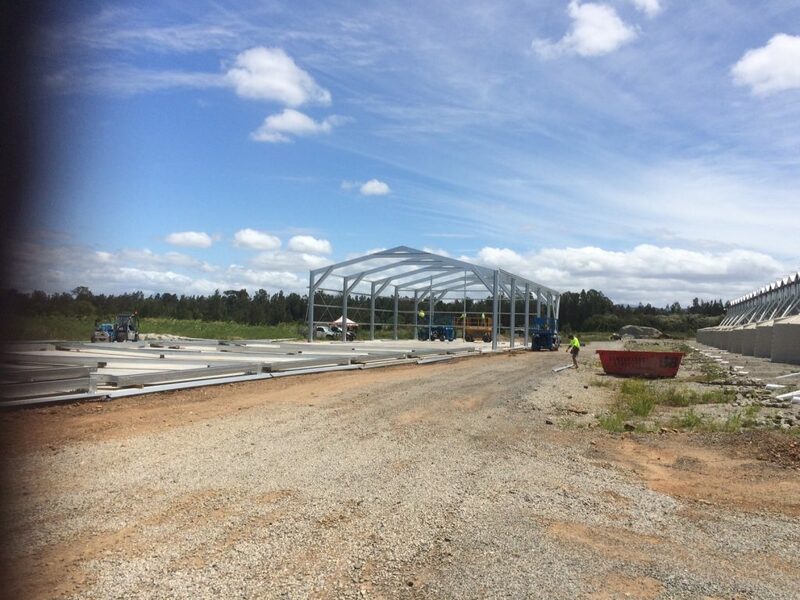 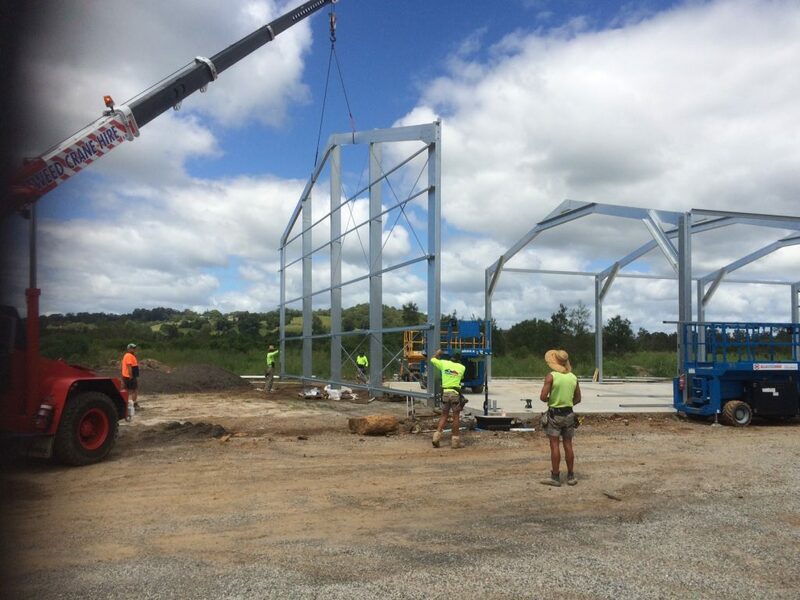 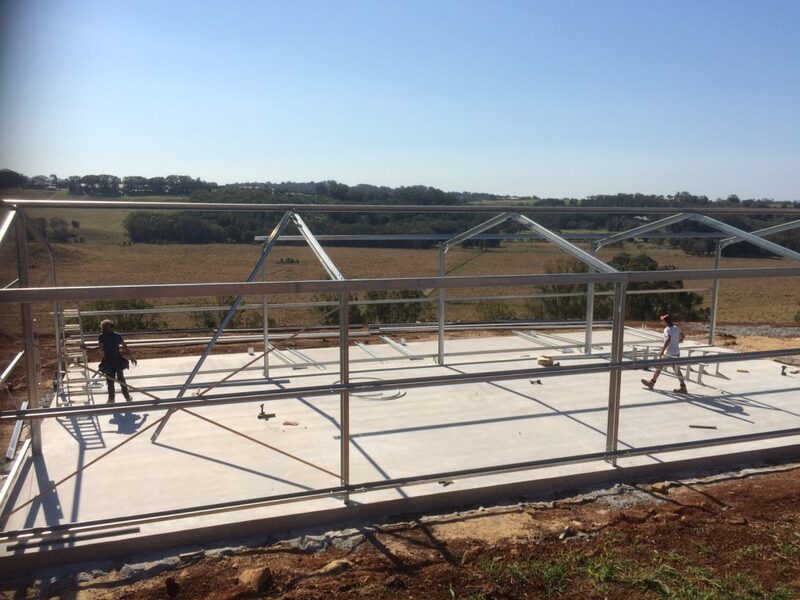 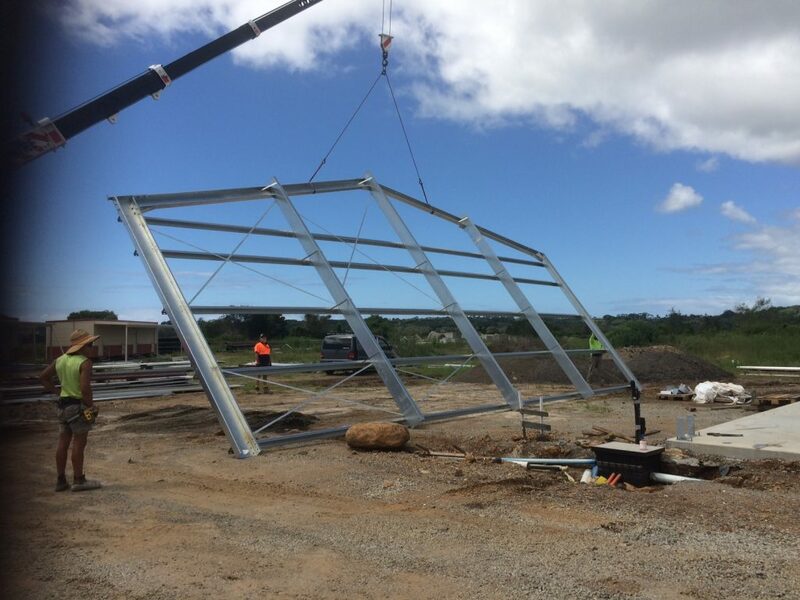 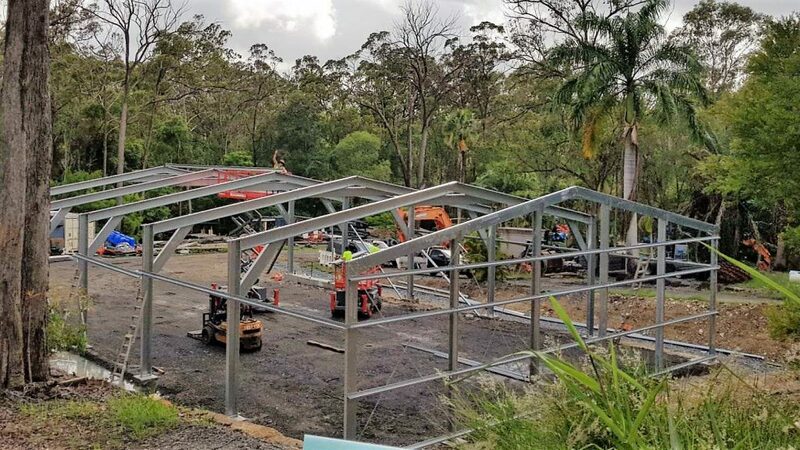 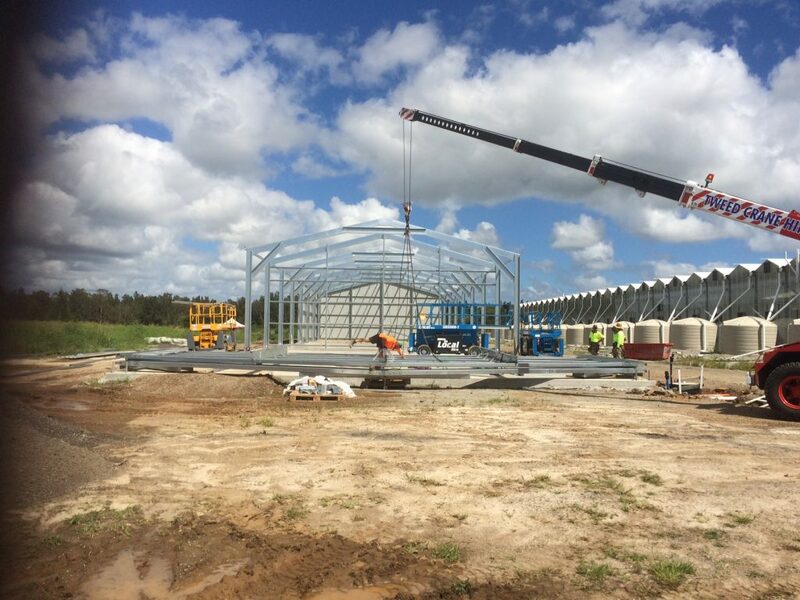 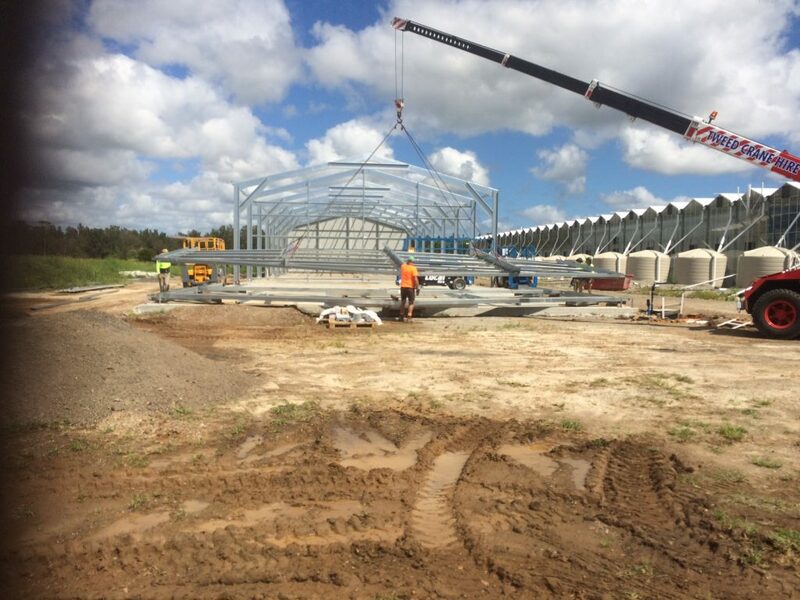 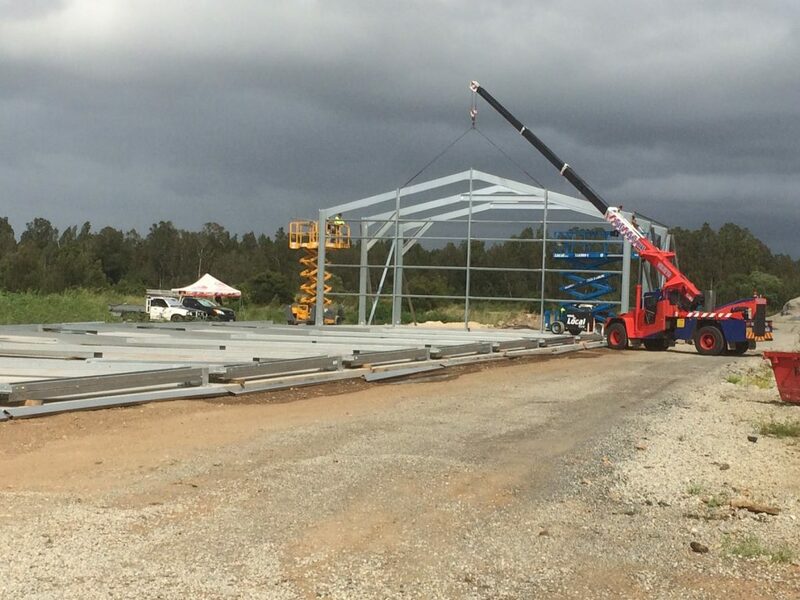 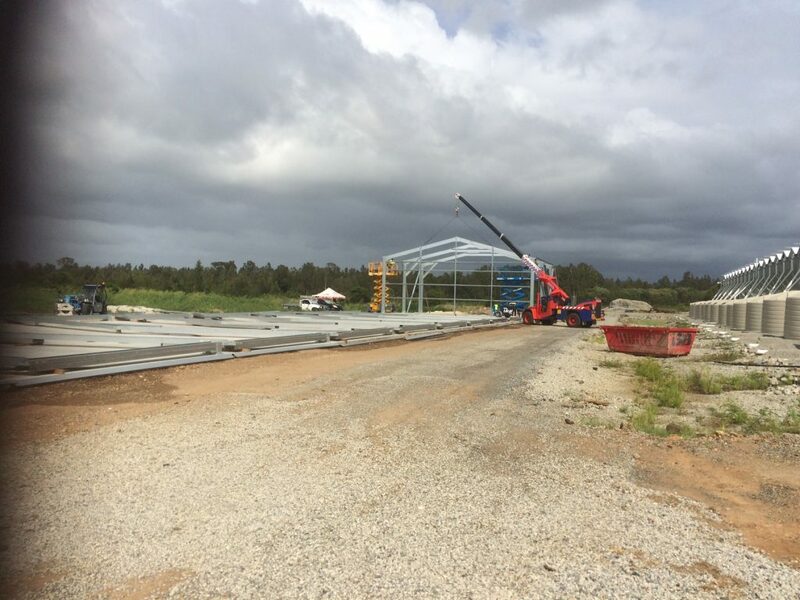 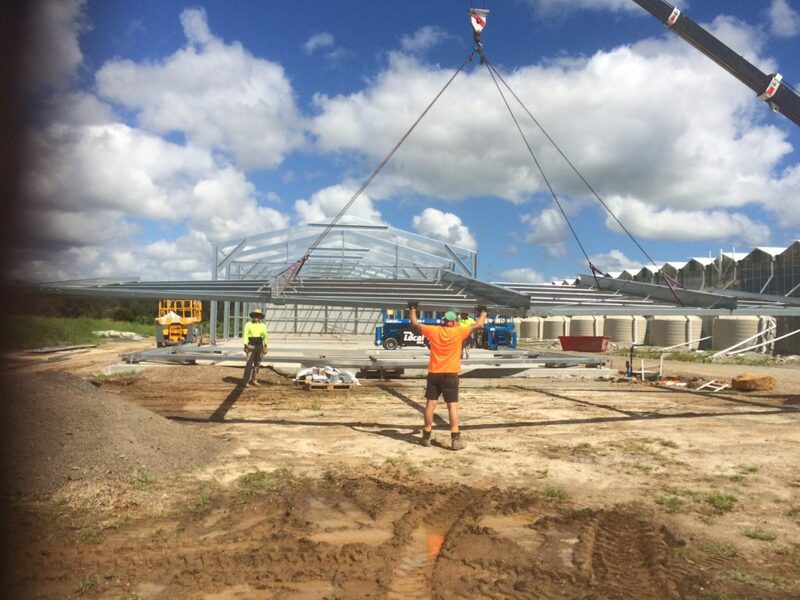 We are proud to have been associated with this Chinderah project and if you need a shed this size or bigger we can assist you with a quote from supply of kit to full build and/or concrete. 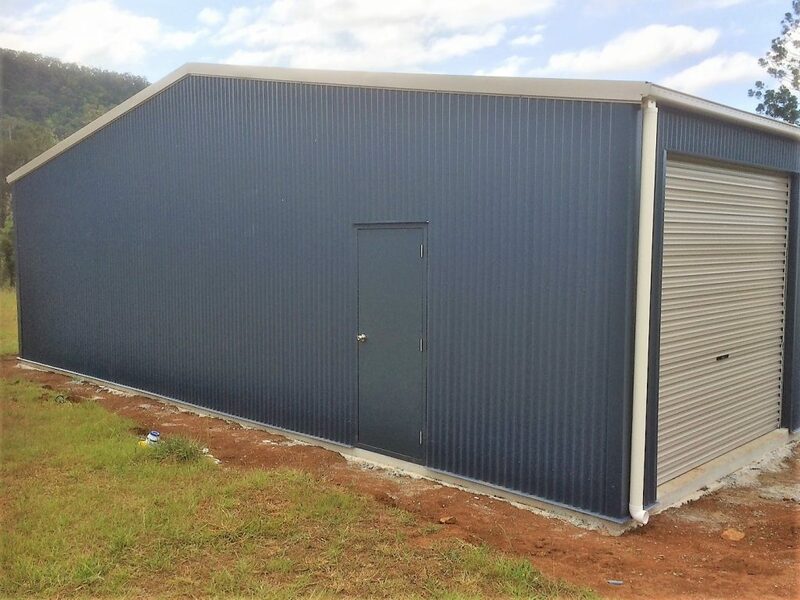 If you are looking for a steel building but don’t need to engage the services of a builder, Totally Sheds are happy to provide you with a Kit Only Shed, based on your requirements. 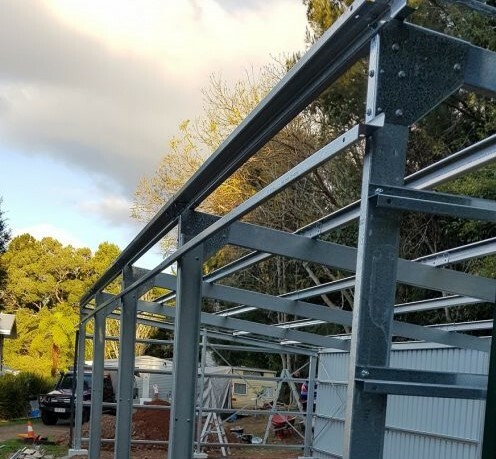 We will supply all you need to go ahead with the shed erecting yourself, including construction manual, concrete/pier details, council documents and engineering certification (Form 15). 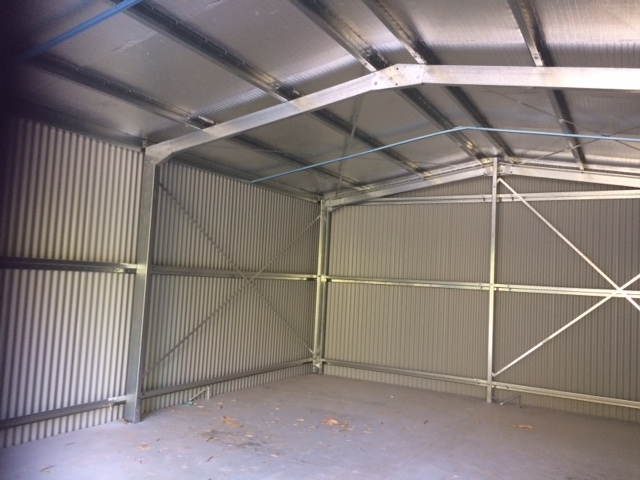 Our client at New Beith erected this 7 x 12m shed himself, after looking for storage to replace an existing old wooden shed. 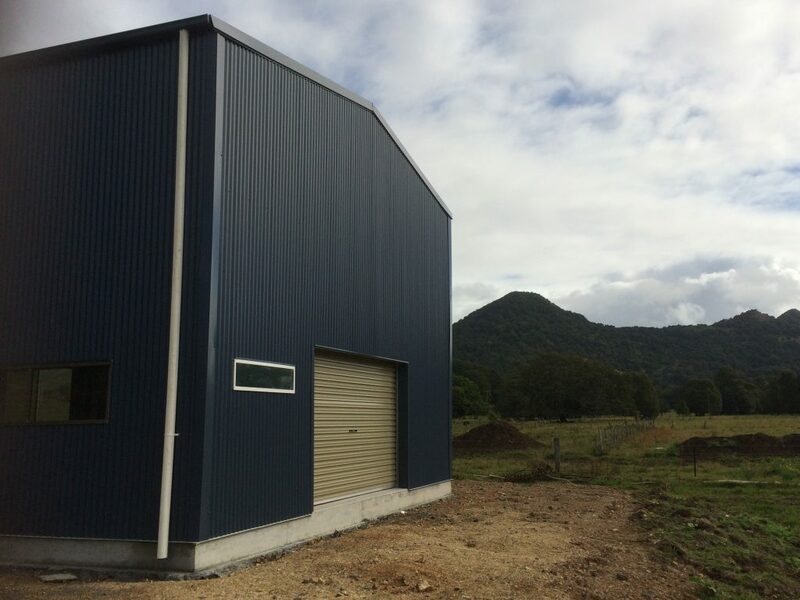 Featuring Classic Cream walls and Ironstone roof and trim, Ben was happy to have achieved a successful construction with the help of family and friends – and all based on the documents Totally Sheds provided. 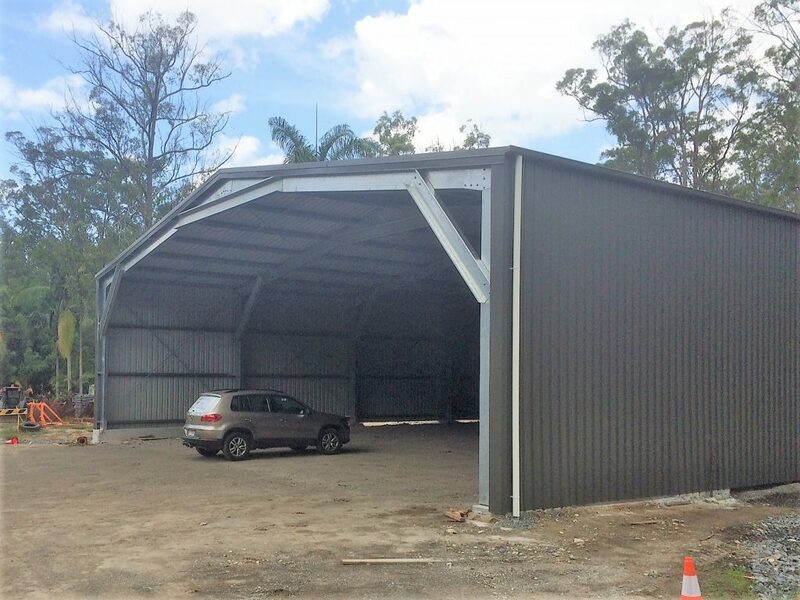 If you are just looking for a steel shed and don’t need any help with construction, let Totally Sheds help design the best fit for you. 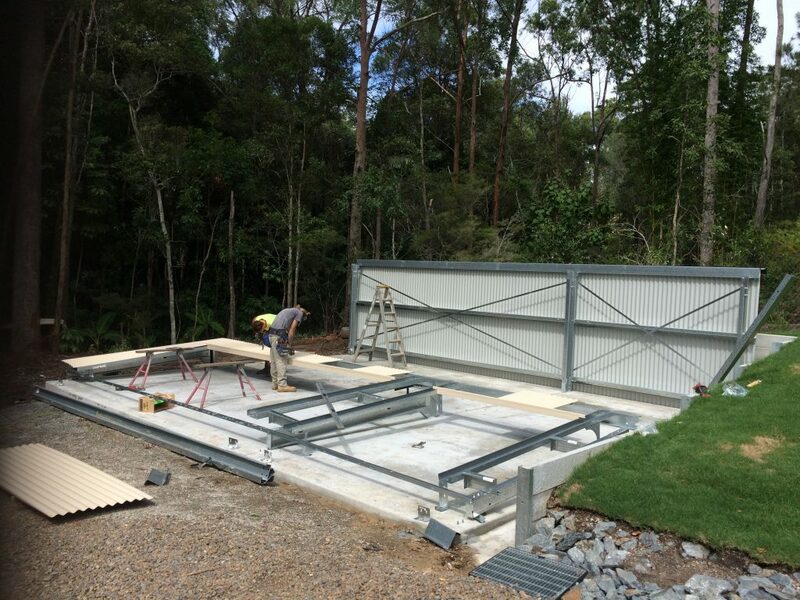 This Currumbin Valley property provided the ideal location for this comprehensively designed quality Workshop/Garage. 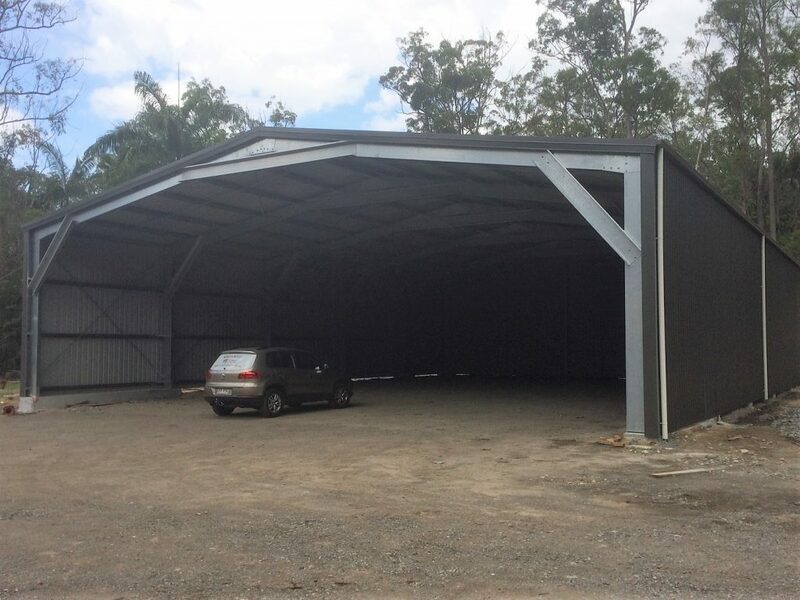 Totally Sheds organised the complete job including earthworks, fully-engineered P-site slab, supply, construction and finally certification of this superb 8m x 36m bespoke shed. 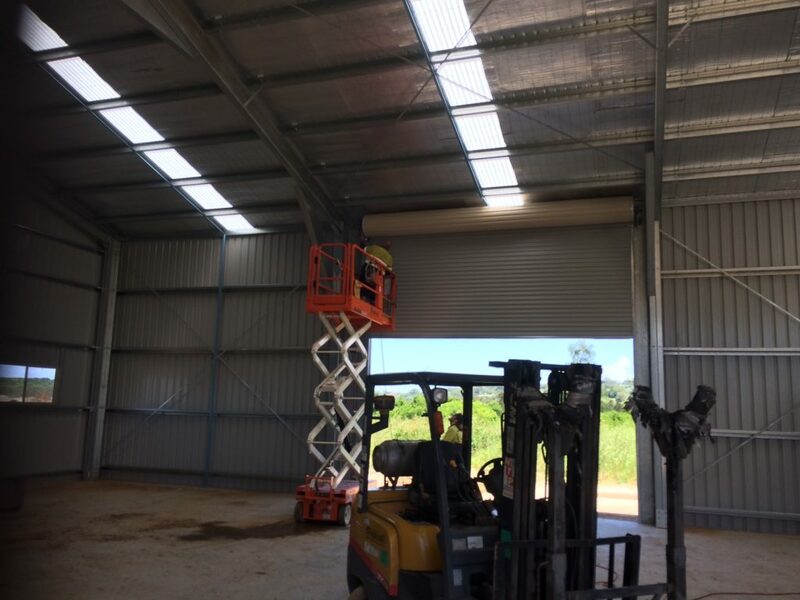 The client’s design brief included three large industrial roller doors, three standard roller doors, a number of PA doors and windows as well as a mezzanine level for storage. 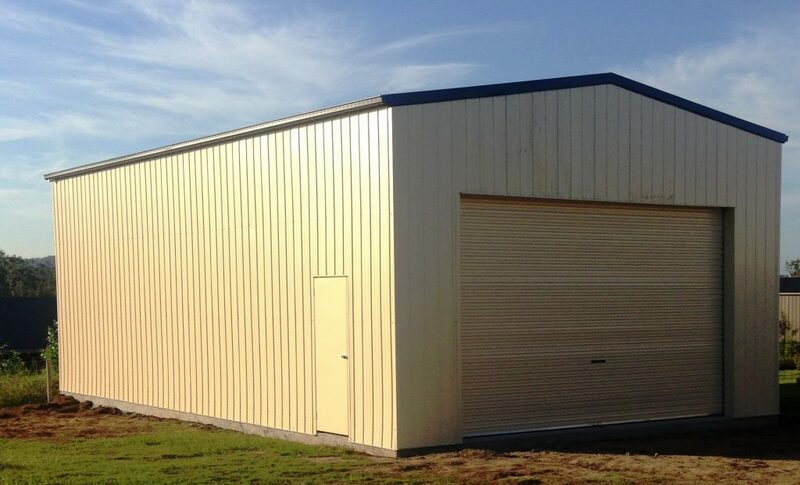 Classic Cream® was chosen for the walls/roof and Deep Ocean® on the trim. 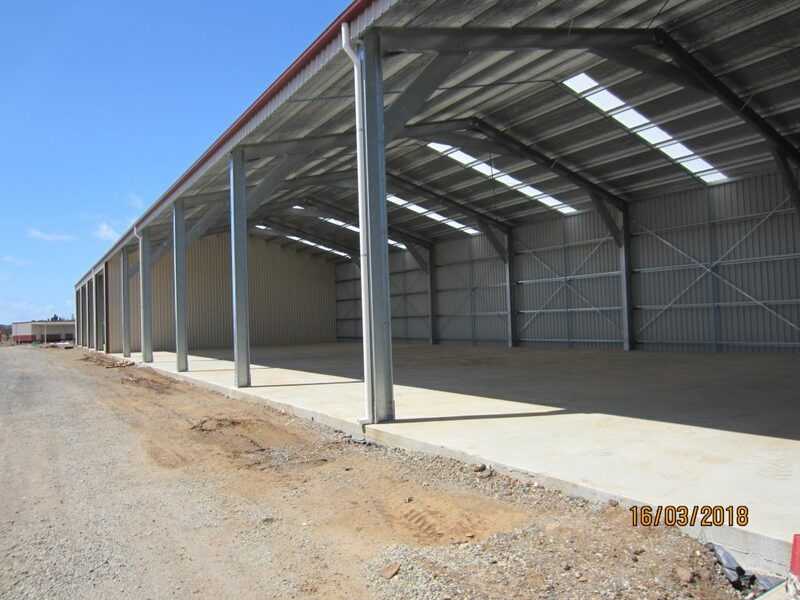 Our client was very happy with the high standard of materials used and workmanship carried out. 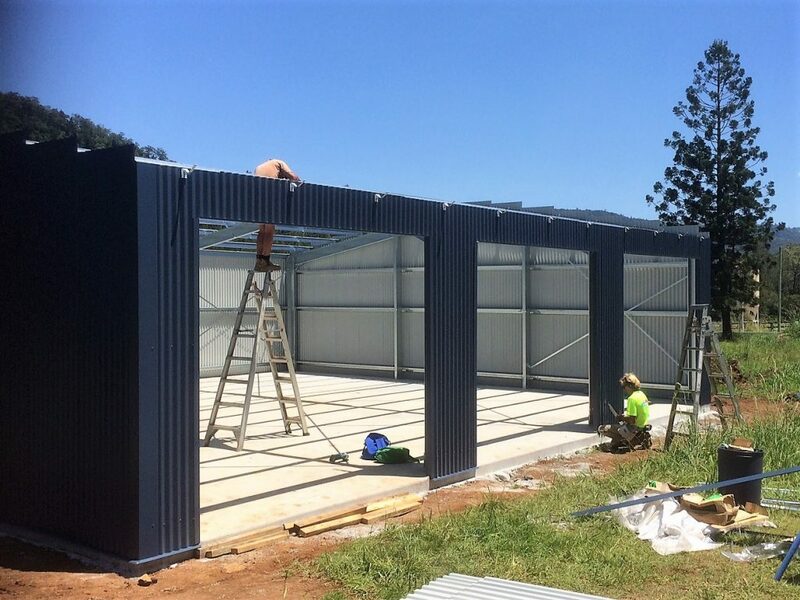 No job is too large for the Totally Sheds team who work hard to make your visions a reality. 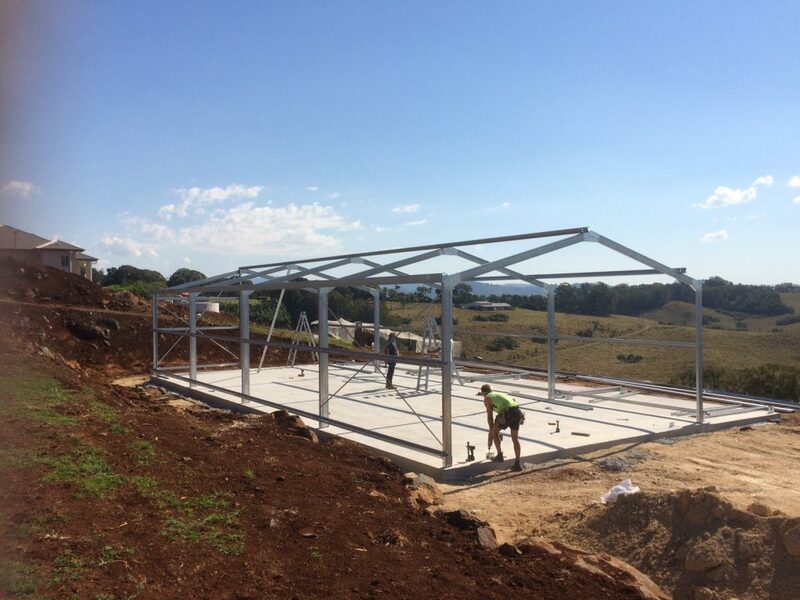 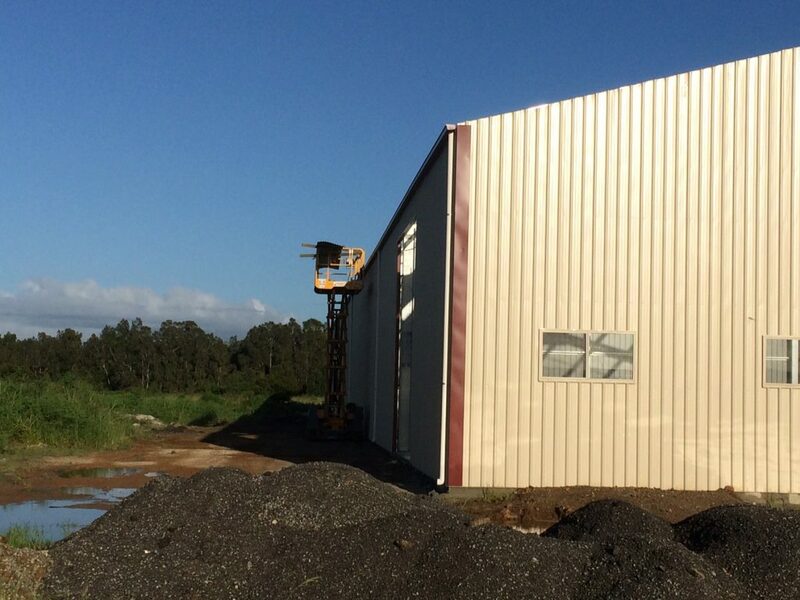 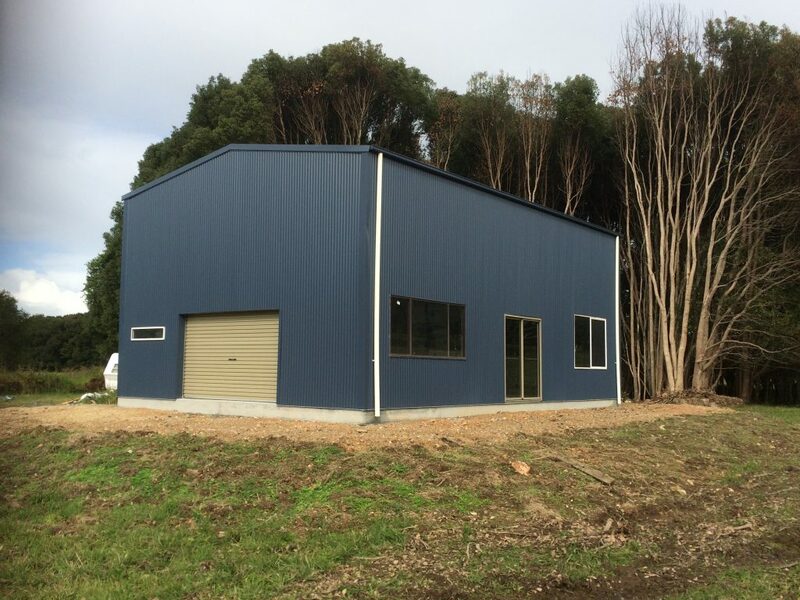 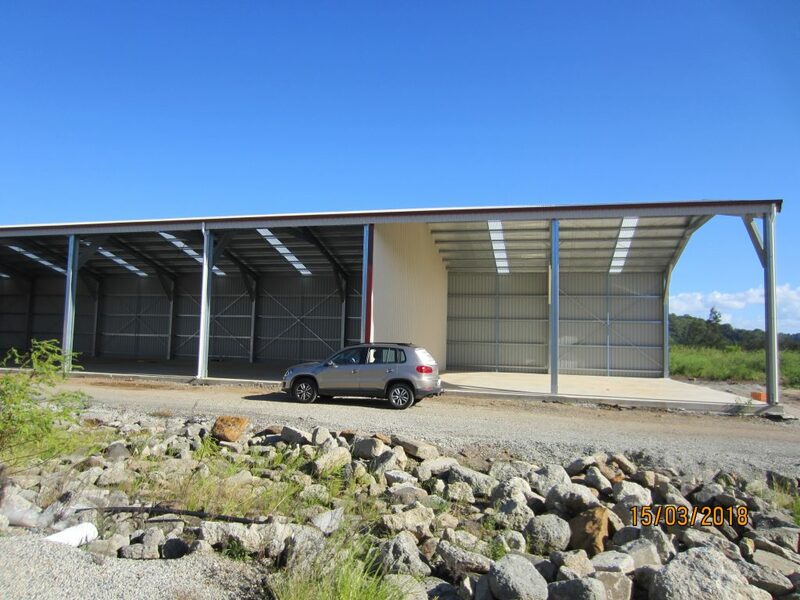 This 6 x 10m steel building provided our Mundoolun client with the storage solution he needed. 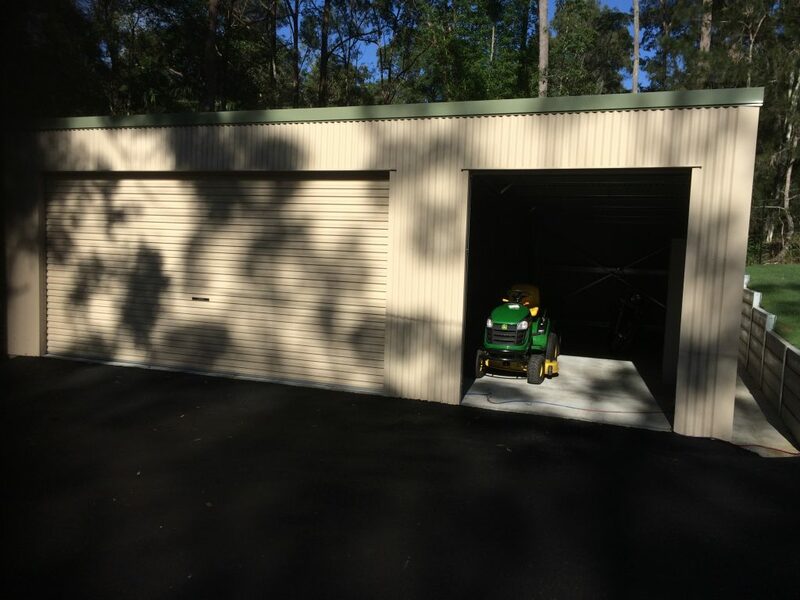 The shed is currently being used to protect building materials for his home currently under construction, but its ultimate use is to store a couple of cars and the ride-on lawn mower. 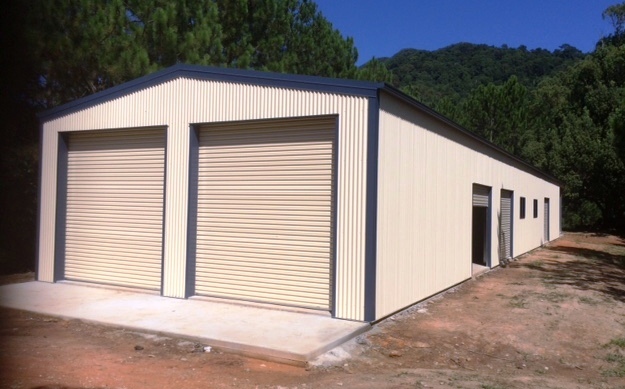 This Shed features a corrugated Zincalume® roof and Metroclad low profile walls. 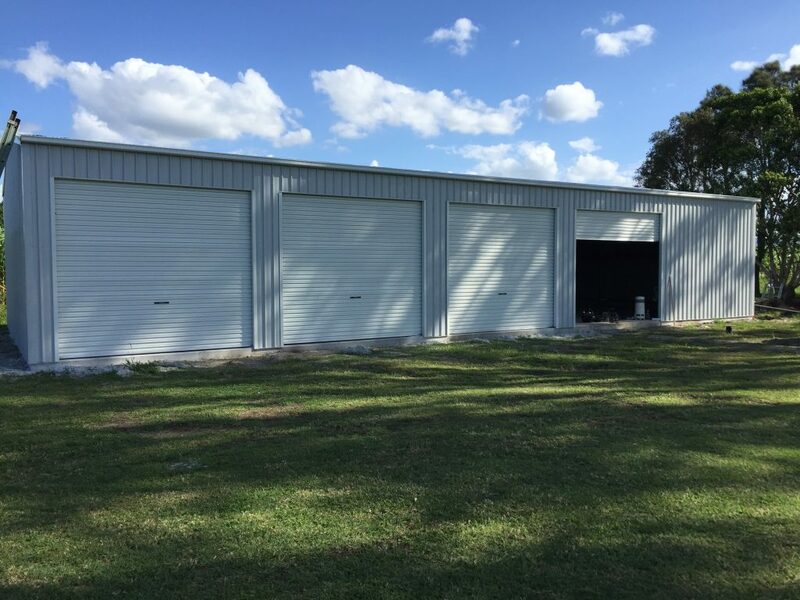 Roller Doors were also supplied in Zincalume® for the two enclosed bays with the third bay left open but enclosed on the side and rear walls for weather protection. 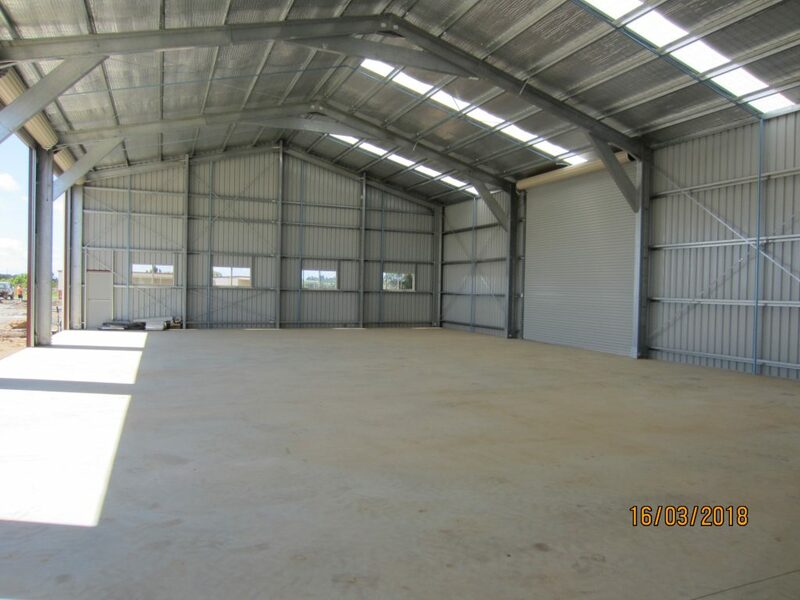 Looking at a specific design? 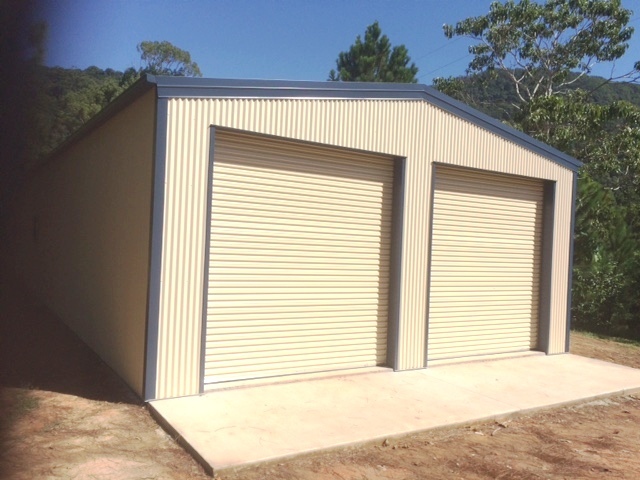 Give the team at Totally Sheds a call now and get your project started. 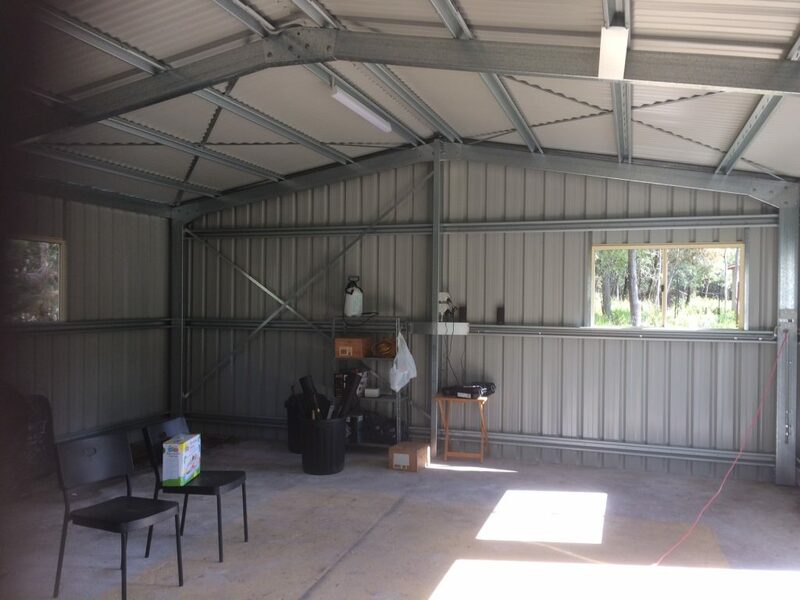 This Mudgeeraba Workshop measuring 13m x 4m provided our client with his own retreat where he could spend his time pursuing a love of bee keeping. 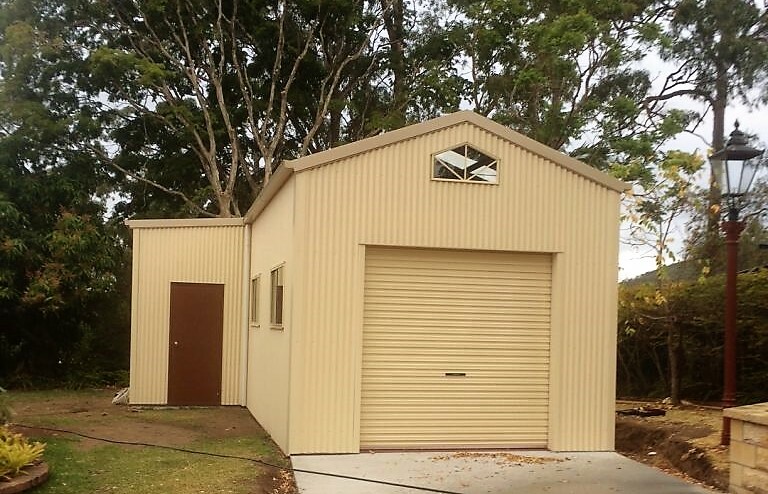 He chose to style the shed with barn windows and gable roofing in Classic Cream Colorbond with Paperbark trim. 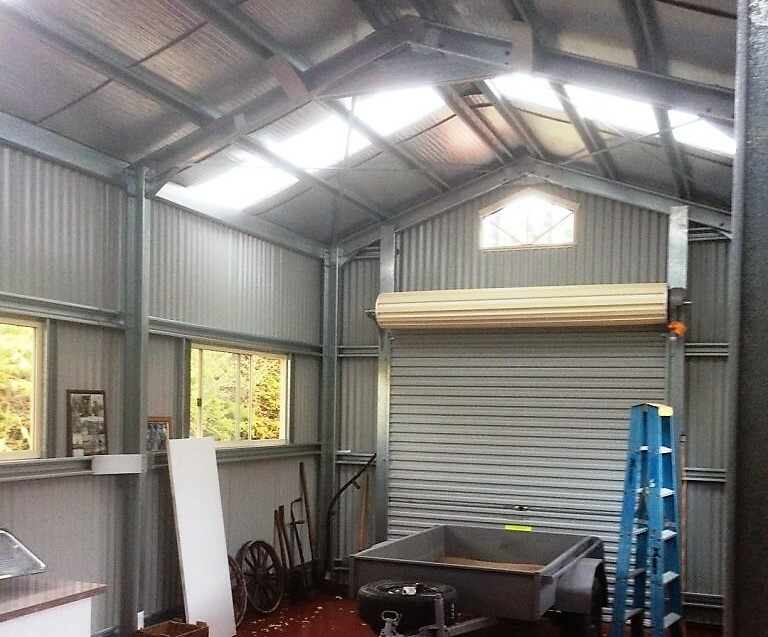 Skylights were installed to capture natural light and a small 2m lean-to was added to cover the PA door. 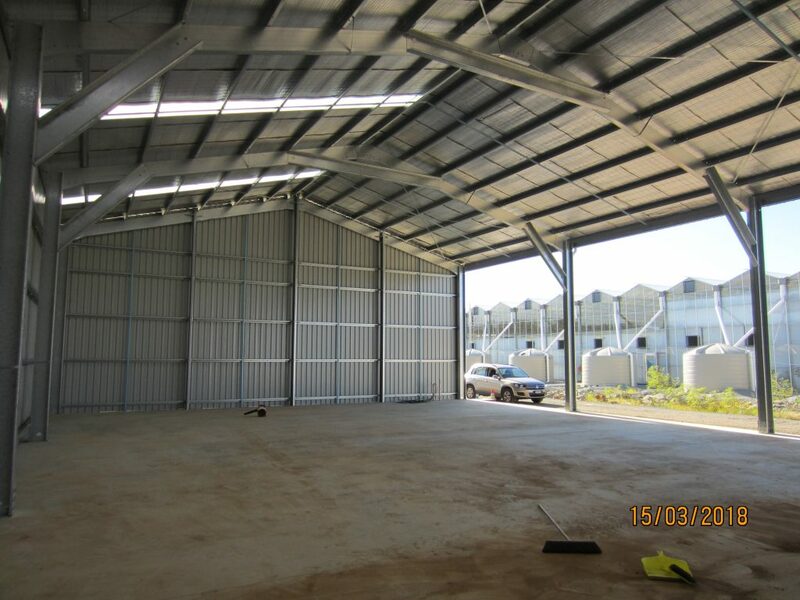 Totally Sheds arranged all earthworks, slab, build and certification for this job. 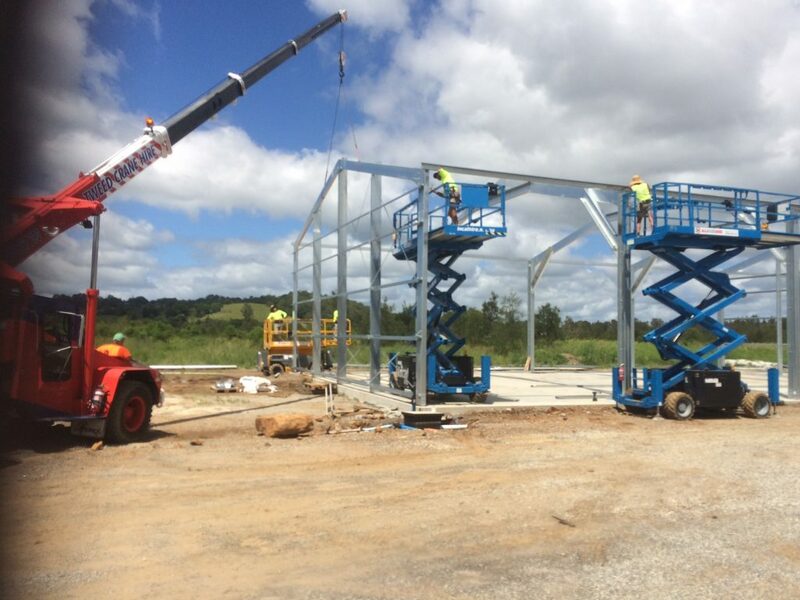 Some could say life became a little sweeter… check out the progress in pictures here. 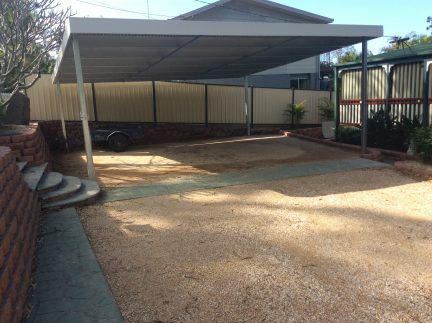 Our client engaged us to do the full job on a carport transformation on an unused space in their front yard. 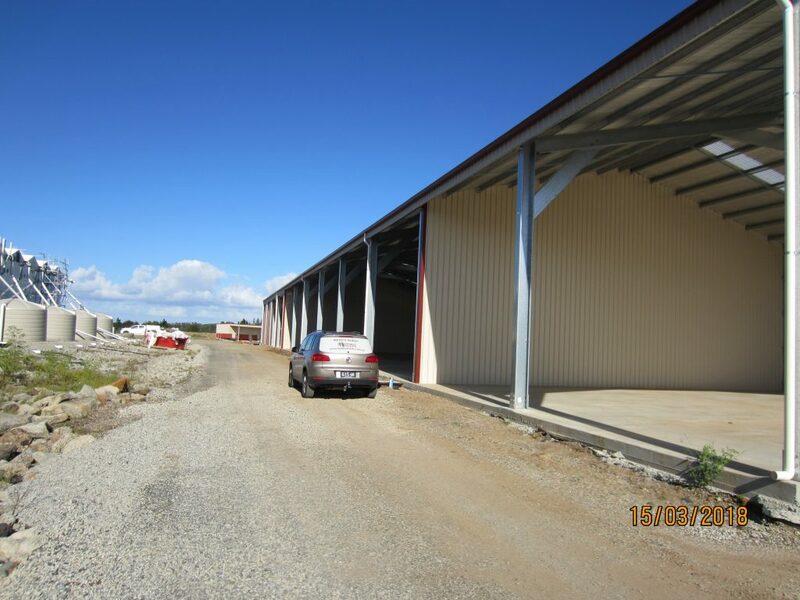 They had limited parking available and really wanted an undercover area to park 3 cars. 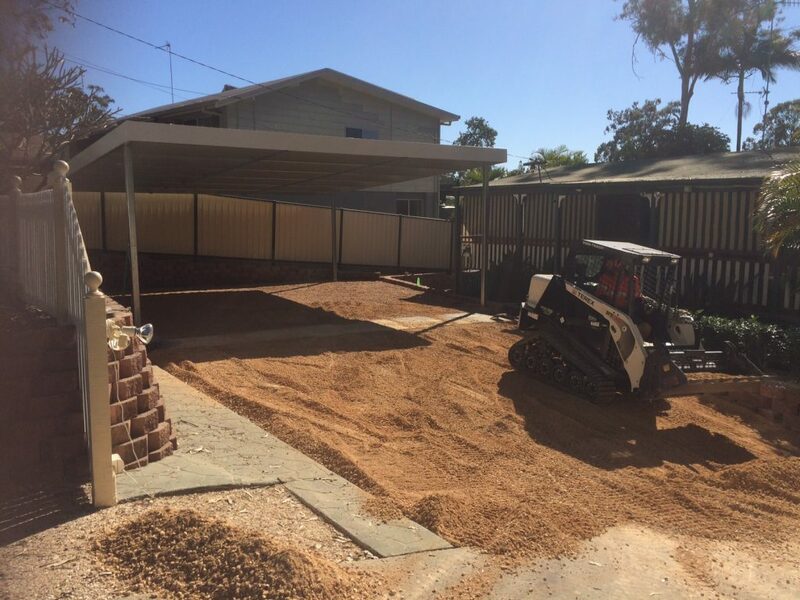 Totally Sheds went to work firstly clearing away 20 cubic meters of soil, engaged a contractor to rebuild a retaining wall, designed an 8m x 8m skillion carport, constructed the carport and then organised the delivery, spreading and compacting of 15 cubic metres of road base to completely transform the site. 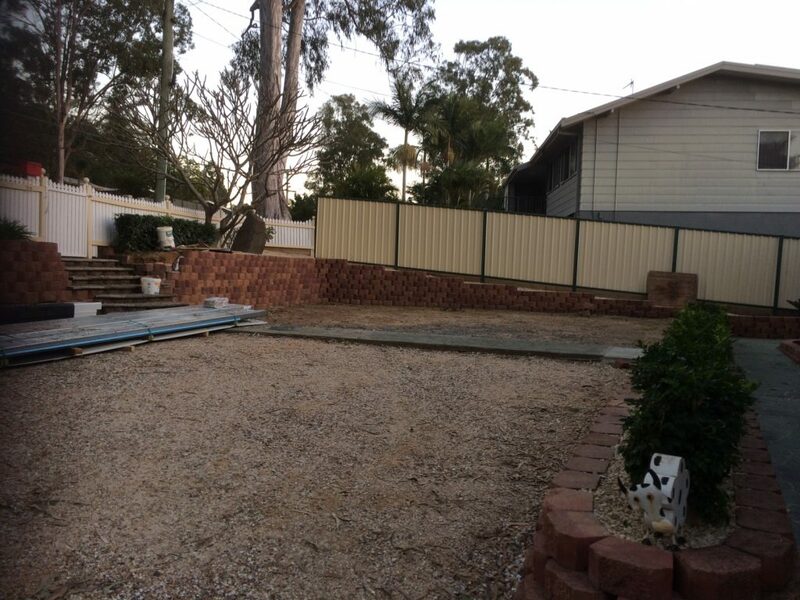 The end result saw the whole front yard being converted to a usable space that can house 3 cars, caravan etc. 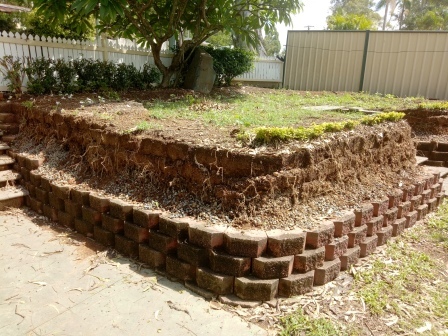 and added thousands to the value of the owner’s property. 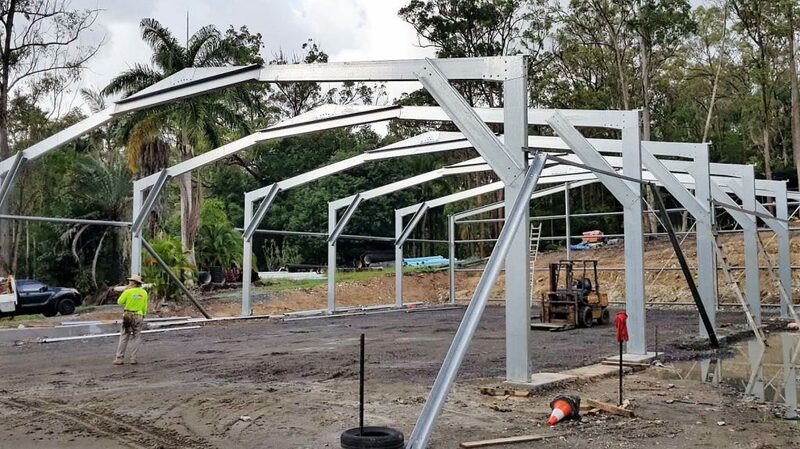 Check out the transformation here. 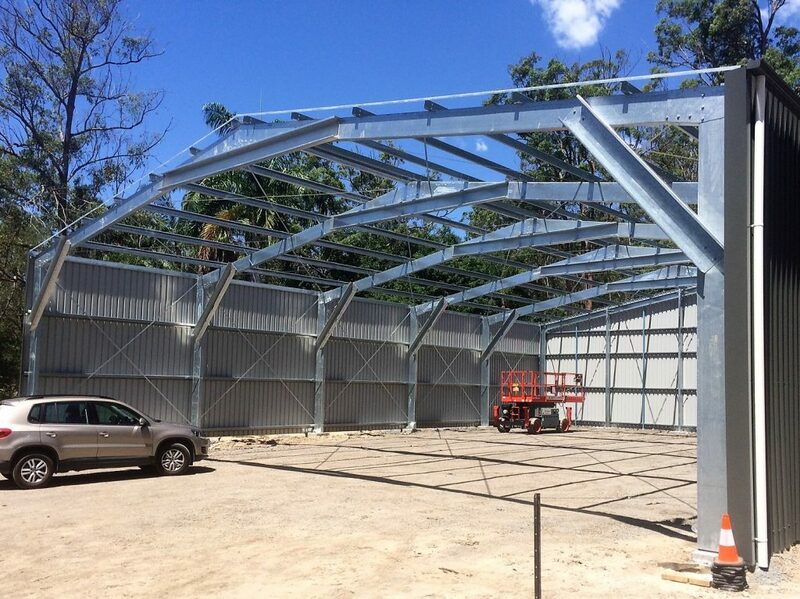 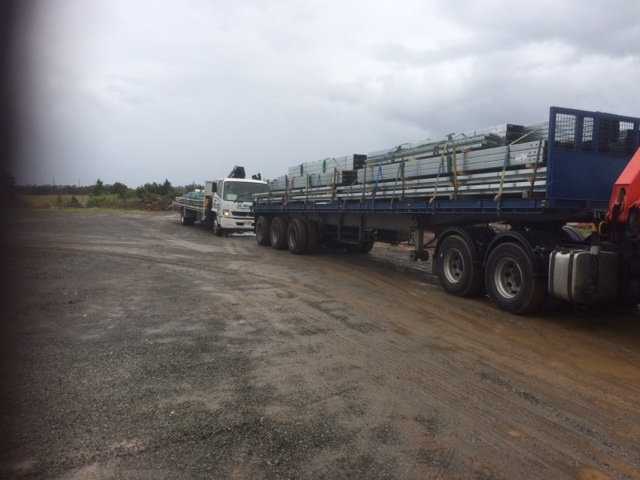 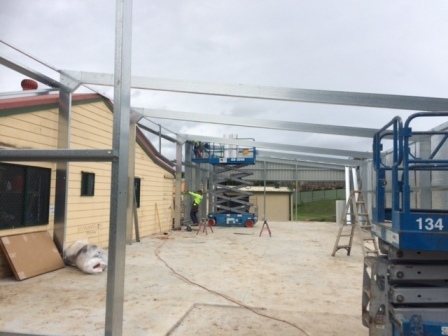 Our client at Maudsland decided it was time to replace his old rundown shed with this new steel construction. 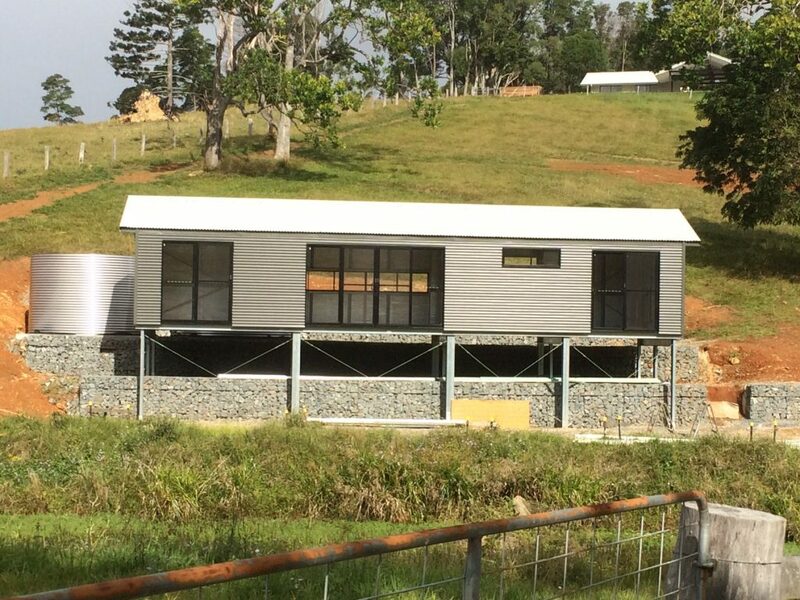 He mindfully chose the Colorbond selections of wind spray and shale grey to best blend in with the bamboo surrounds. 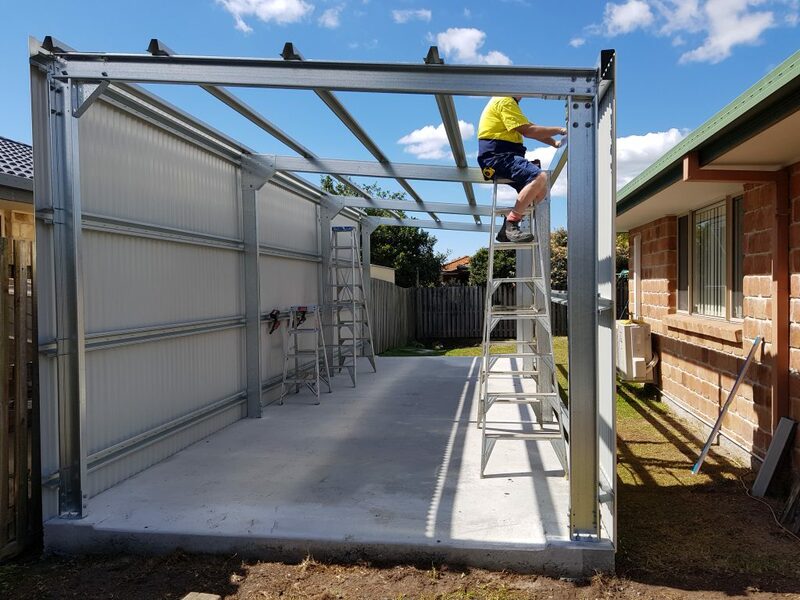 After engaging the services of our builders he is now happily filing his new 8 x 8 steel shed with his ride on mowers, power tools and whatever else he wants! 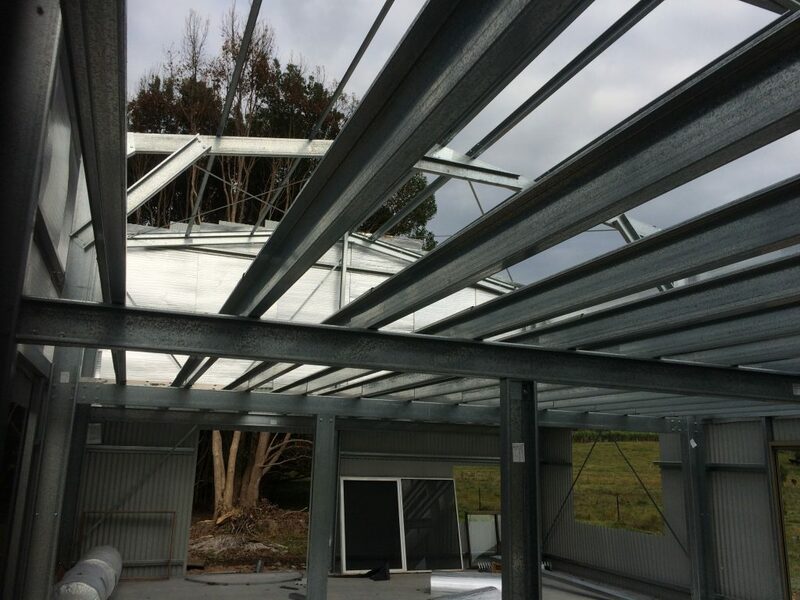 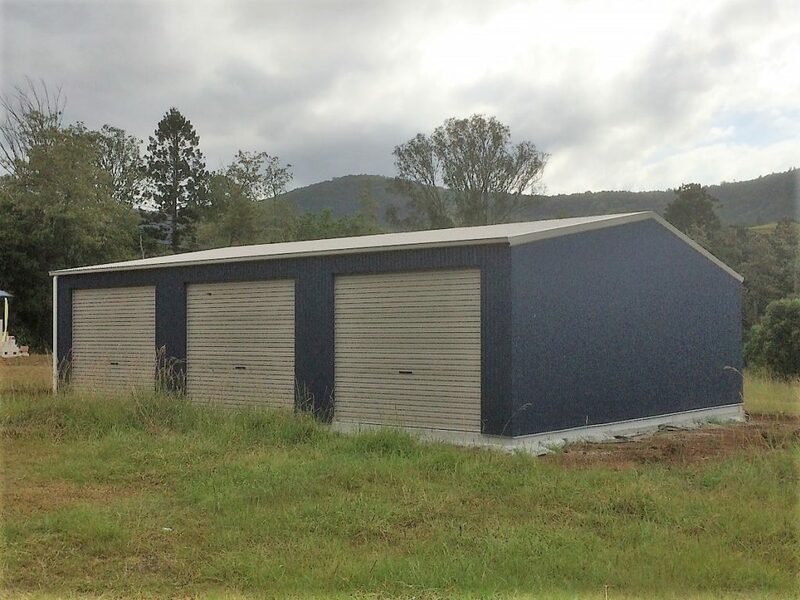 This small business operator needed a quick solution for additional storage on his Gympie property. 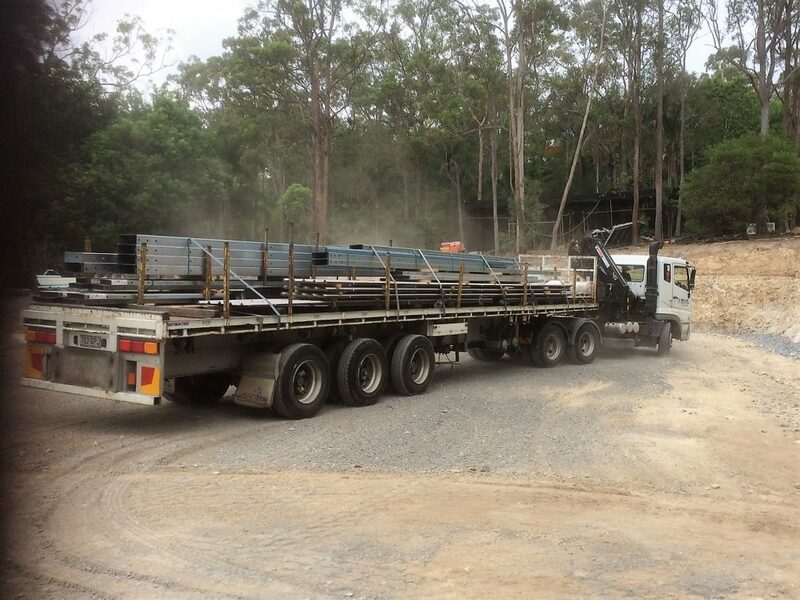 He went with ‘Kit Only’, undertaking to build it himself. 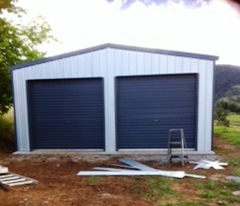 For this 6 x 9 Zinc Shed the Colorbond shade of Ironstone was chosen for the Roller Doors, Flashings, Trim and Gutters. 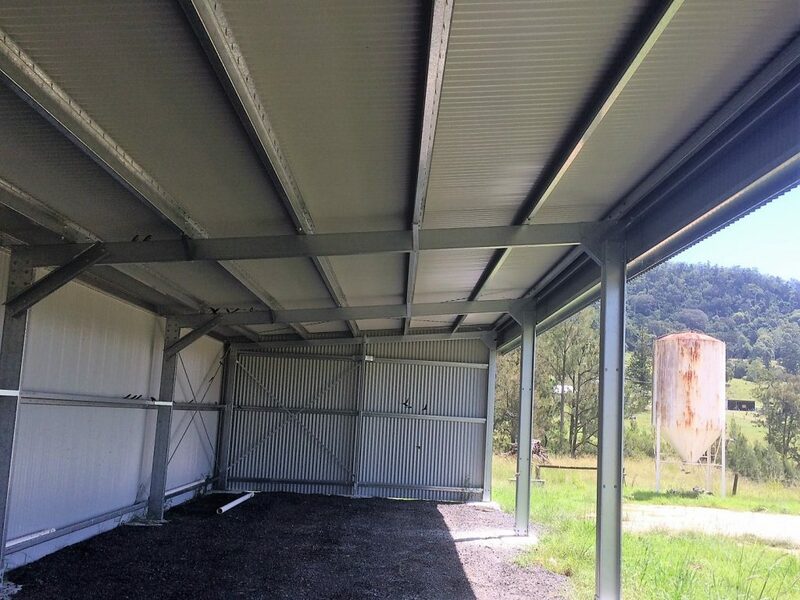 Our client was very happy with the quality of the steel kit and service from Totally Sheds (refer to his review for July 2017 on our testimonial page). 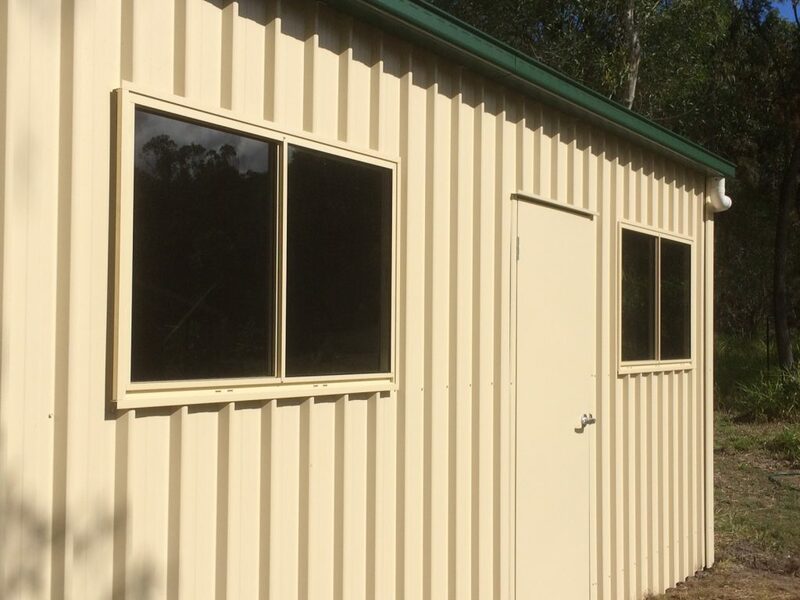 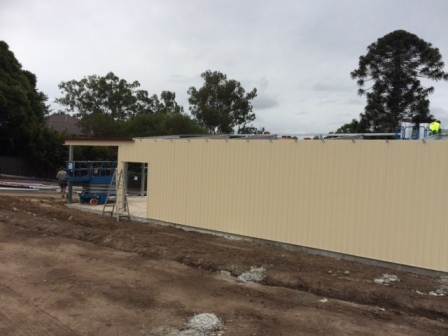 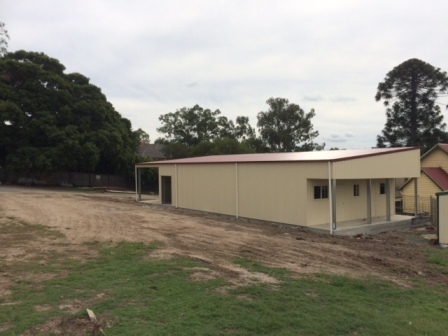 Totally Sheds is proud to have been associated with the Mudgeeraba Uniting Church and their project to supply and construct a 9 x 22 Shed to facilitate the expansion of their Opportunity Shop (op Shop) operation. 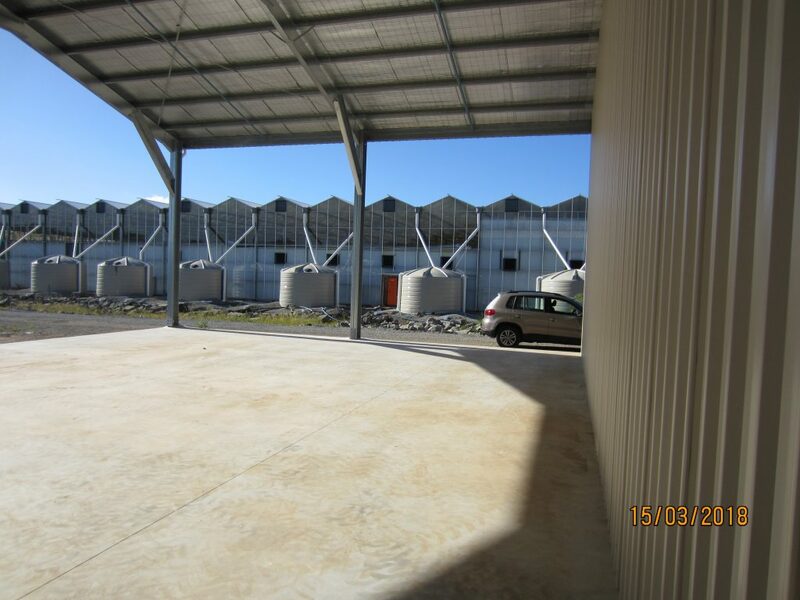 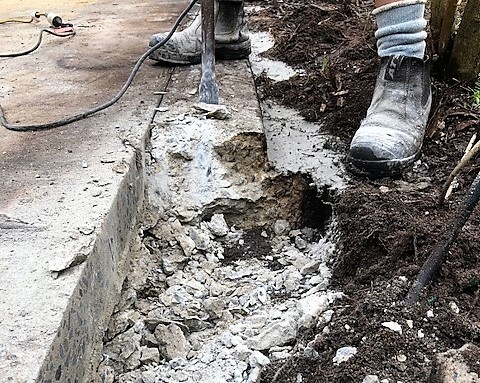 We worked extensively with the committee on the design of the building assisting the client with earthworks, concreting, construction and certification. 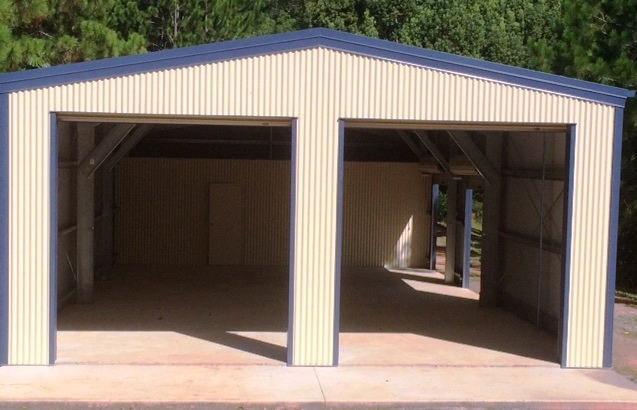 We consulted with the client for months to ensure the shed met the Church Committee’s specific needs. 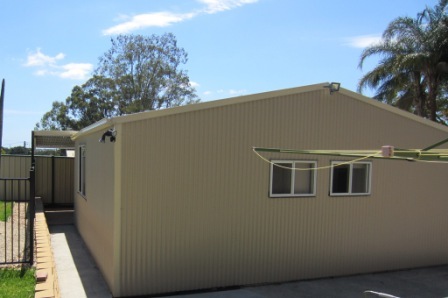 The Op Shop is now fully operational and by all accounts, the staff is extremely happy with the end result. 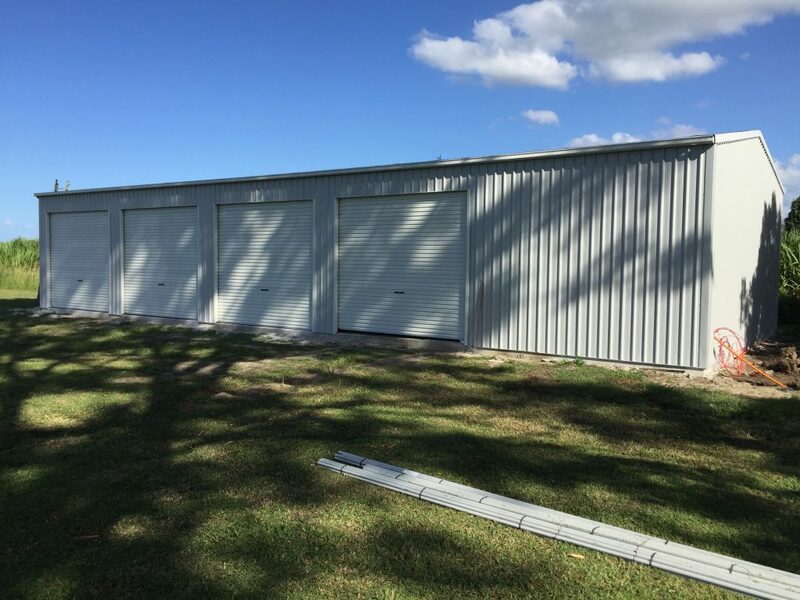 Tony engaged Totally Sheds to organise a builder and deliver a Double Garage to his Deception Bay property. 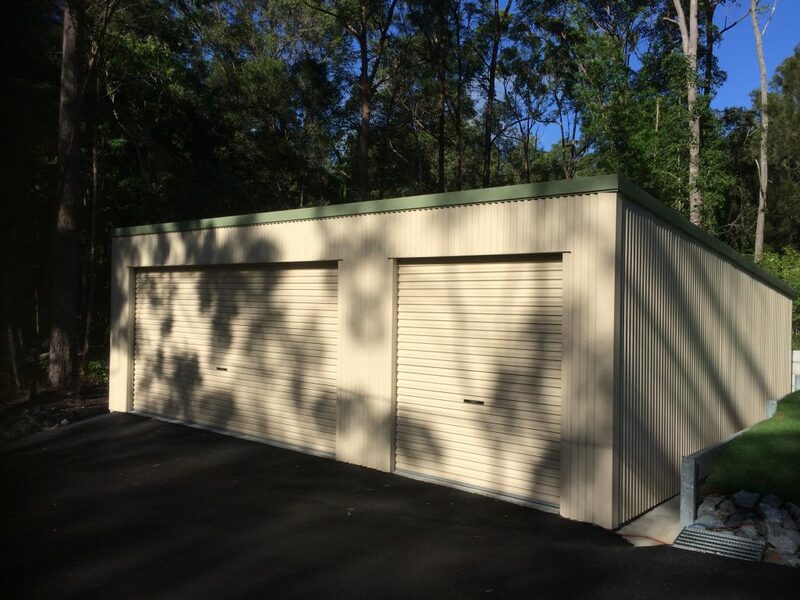 He reported being very happy with the end result and his colour choices – mixing Paperbark walls and roof with Ironstone roller doors, gutters and flashings. 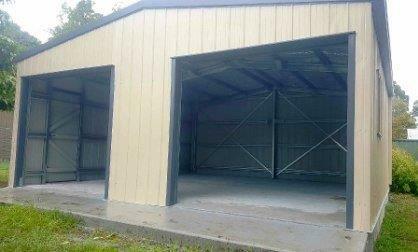 This client was looking for additional storage space for household items and somewhere undercover to park his vehicle. 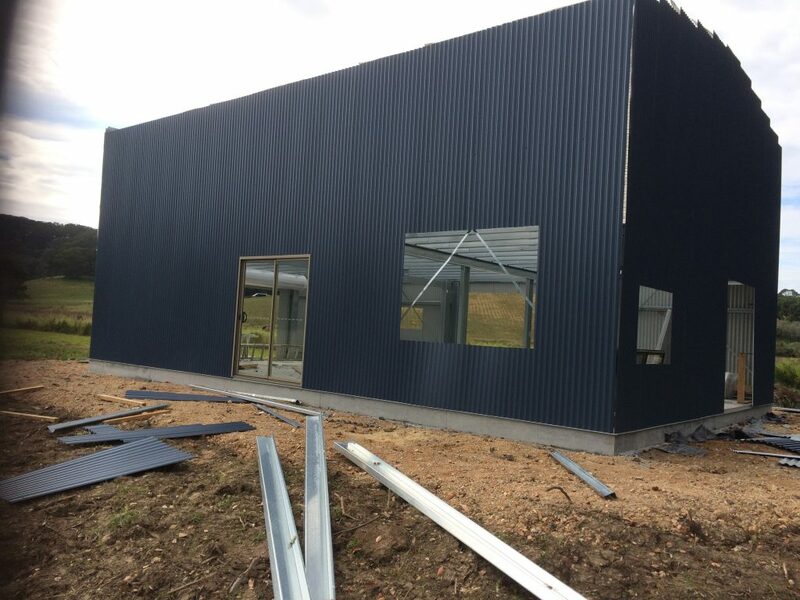 This steel building ticked all those boxes. 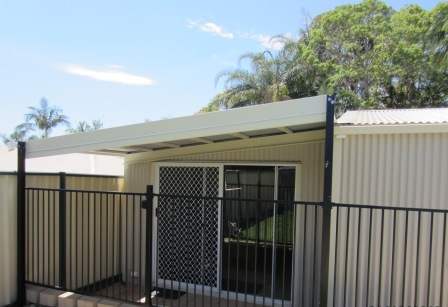 In Mudgeeraba, our client wanted a livable space to provide a comfortable and practical solution for two stay-at-home young men. 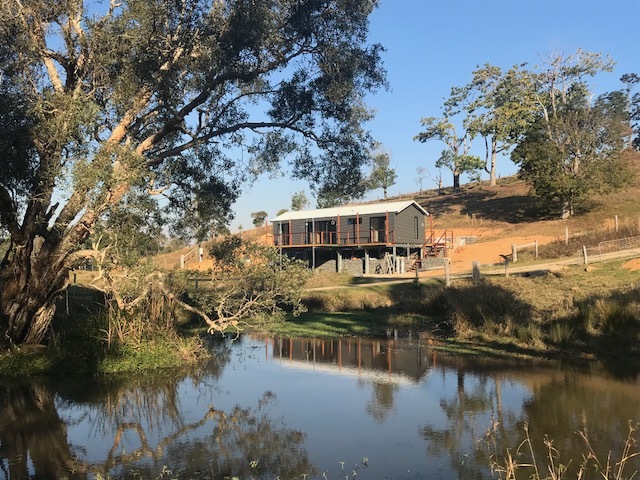 With an external access bathroom already on the property, Totally Sheds was engaged to design and build a structure that would give them a separate private bedroom as well as a common area that would allow friends to come over and enjoy the ‘shack’. 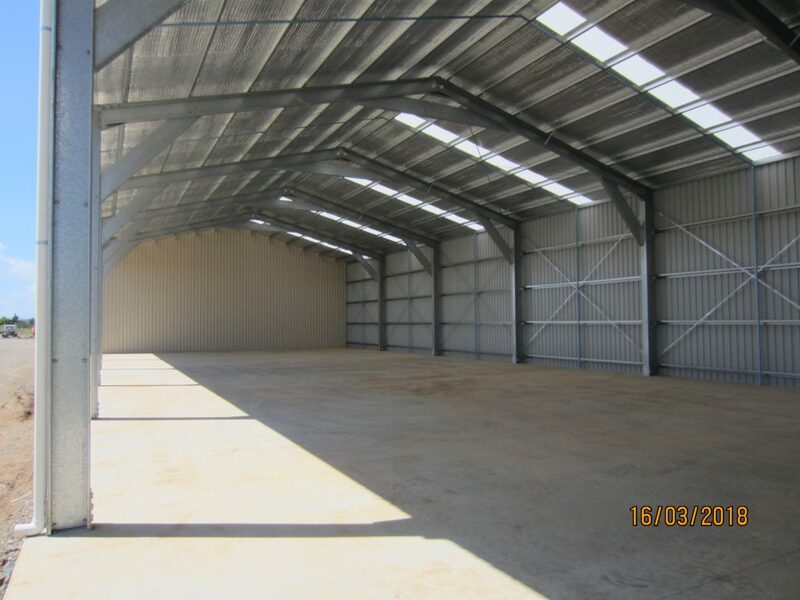 Totally Sheds not only worked within the parameters of the usable land, designing the building they provided advice on the internal fit out as well. 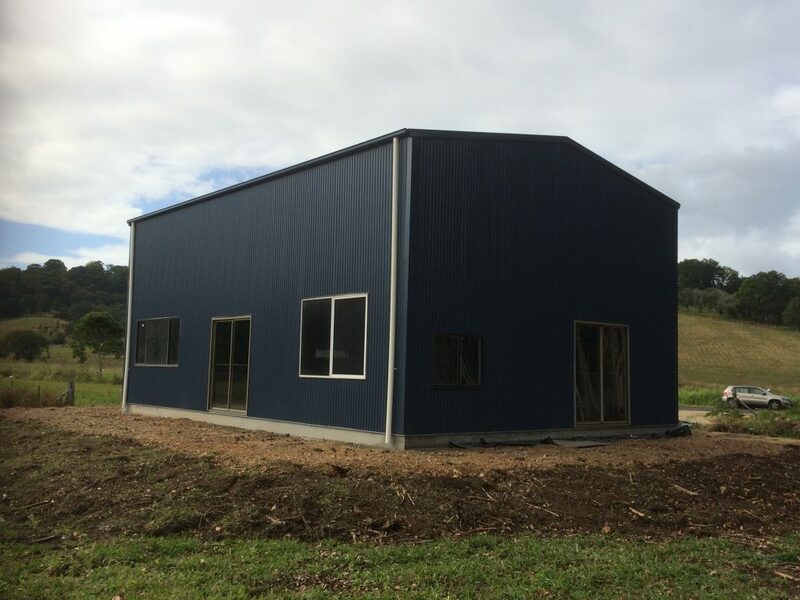 The result was a shed that allows young adults to come and go as they please, is functional, looks great and has added value to the property, effectively converting the home from three bedrooms into five.